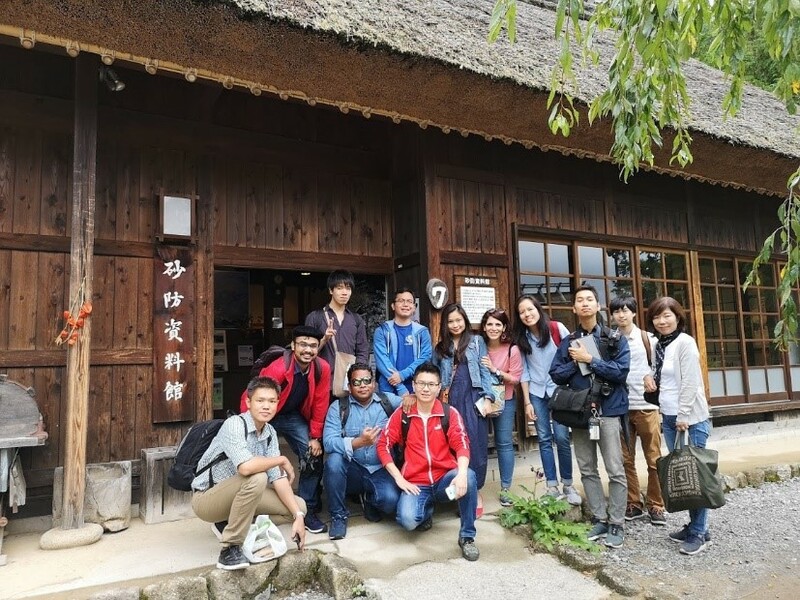 Takeuchi lab went on a trip to Kawaguchiko in Yamanashi Prefecture on September 11-12, 2018. 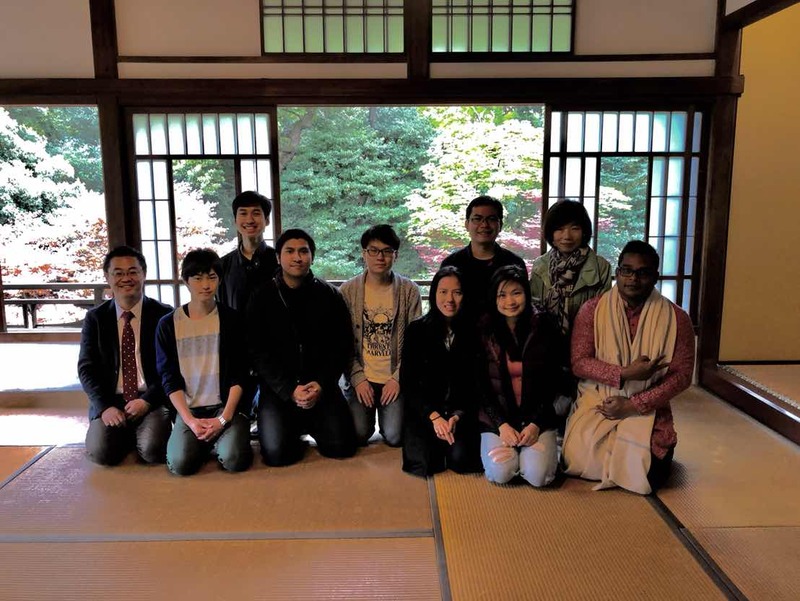 It was a time to be refreshed by the cool weather of the area while gaining valuable and interesting insights about this place in Japan. We are particularly impressed by how a museum (Sabo Museum) was put up to commemorate the mud flow that happened on September 25, 1966 in what was used to be called Ashiwada Village in Nenba Area (Fig. 1). 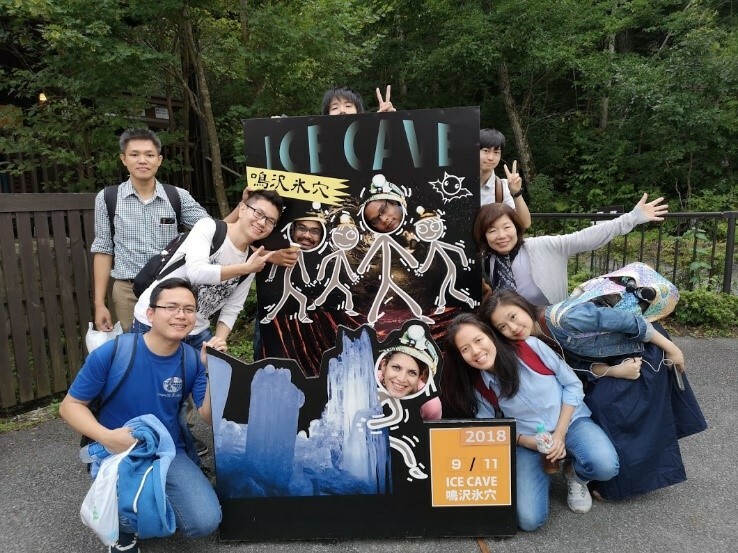 Of course, the team has enjoyed fun time together during our trips around Lake Kawaguchi, experienced the chilling temperature inside the Ice Cave (Fig. 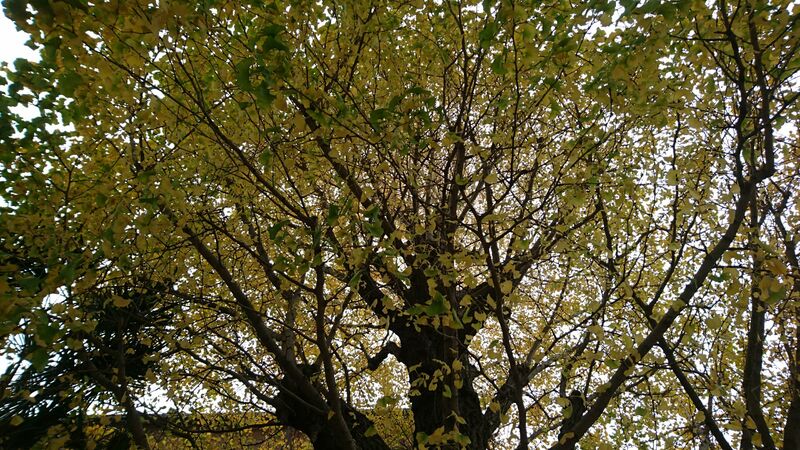 2), captivated by the melodies at Kawaguchi-ko Music Forest (Fig. 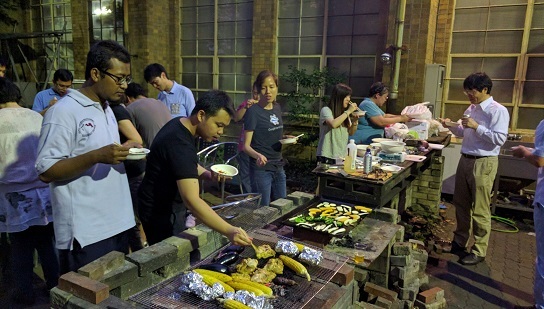 3), and enjoyed to the full our BBQ party (Fig. 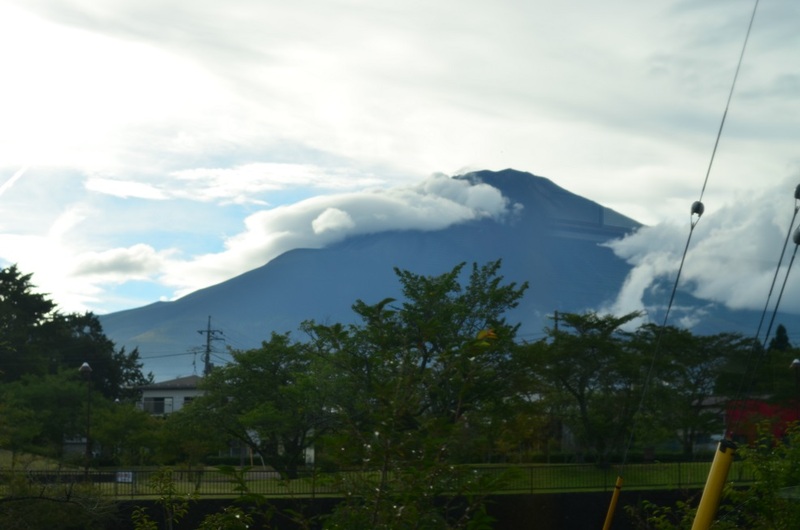 4) at our accommodation overlooking the majestic Mount Fuji. 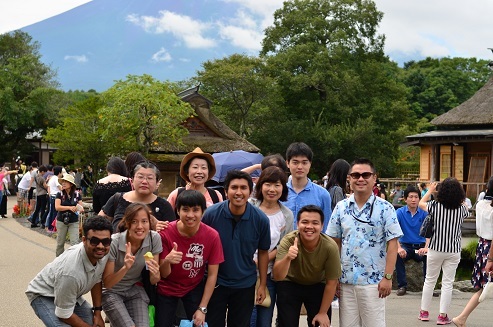 Indeed, there are a lot of interesting places in Japan that are yet to be explored by both the locals and foreigners. 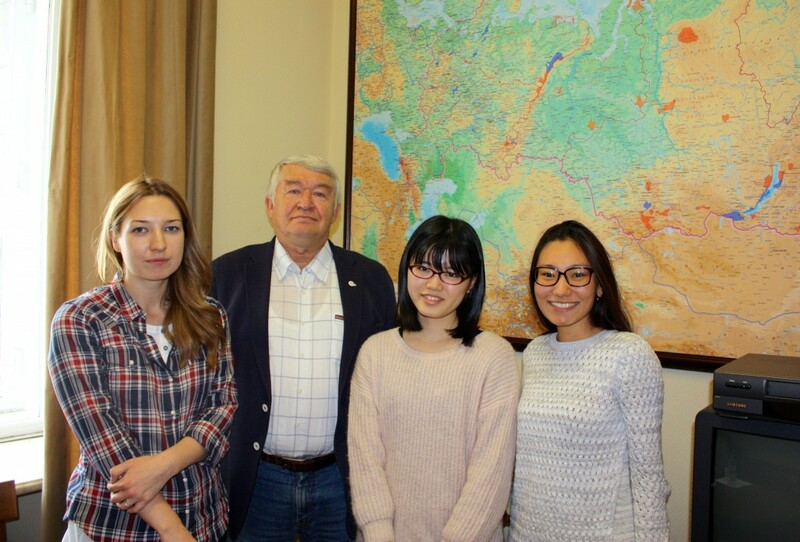 Lab trips such as this has given students the opportunity to go to some of these places and be amazed in the natural beauty and rich culture of this country. I hope to explore more of Japan! 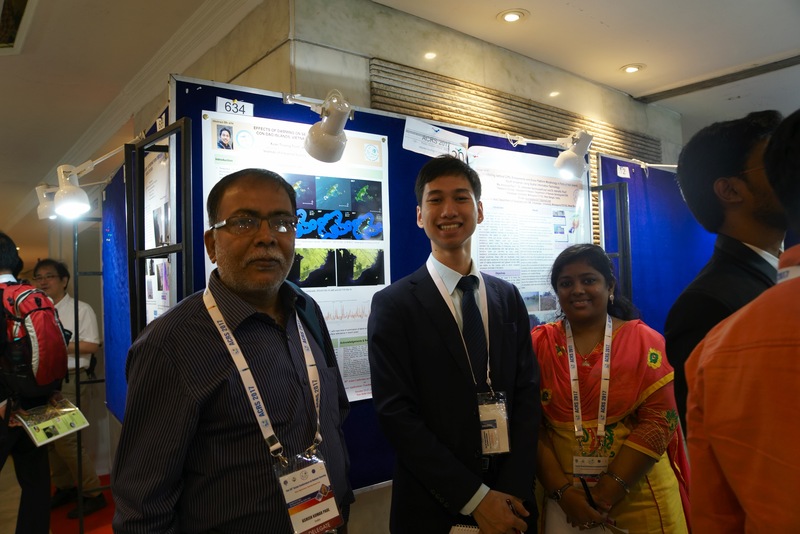 One of the key projects of our lab is biomass estimation in ASEAN countries. 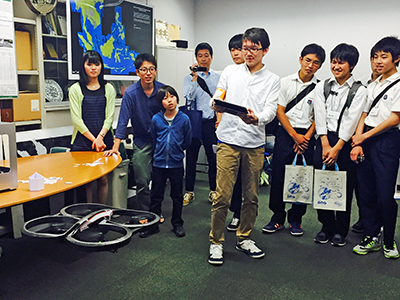 Prakhar Misra, post doctoral fellow attended International Conference on Unmanned Aerial Vehicles in Environment-2018 (20, 21 August) organized at Hokkaido University on behalf of Dr Wataru Takeuchi. 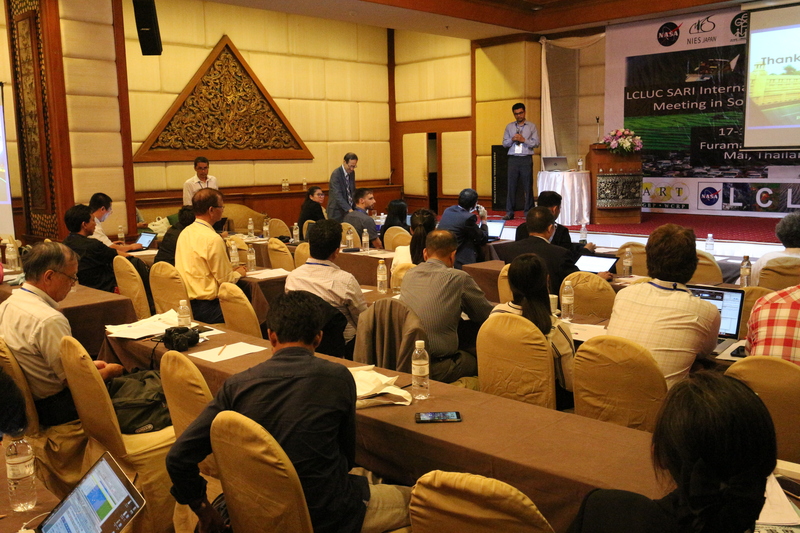 Title of talk was – “Supporting efficient management of oil palm plantation using RS, UAV, GIS and GNSS in Malaysia” which also consisted of Pegah’s results and a poster “Seagrass mapping at Ninh Thuan Province by Landsat and UAV” on behalf of Truong . 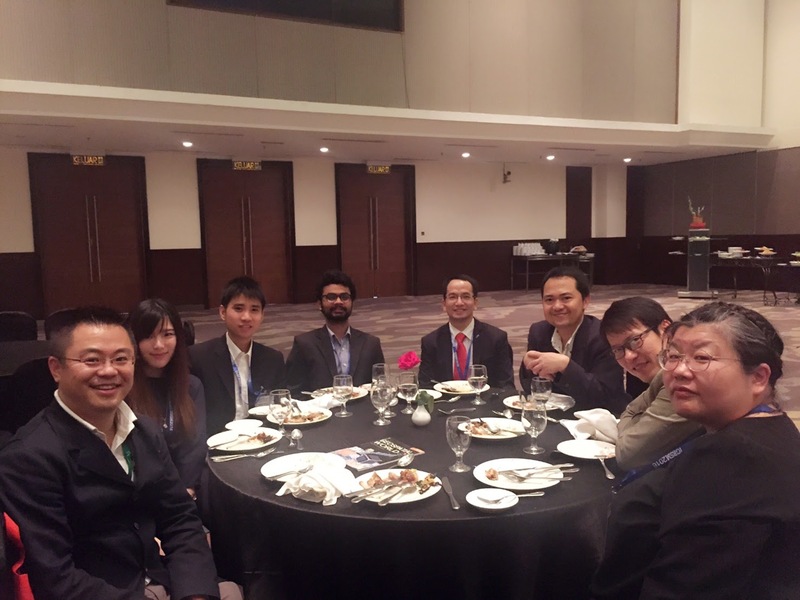 This conference was organized by our lab alumnus Dr Ram Avtar, asst professor at Hokkaido University. 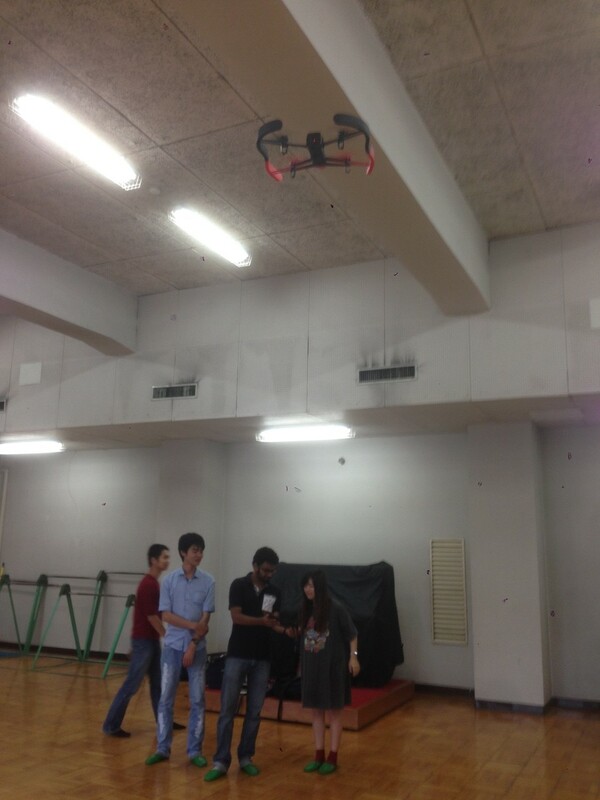 It was an exciting opportunity to explore new opportunities for UAV by interacting with other researchers. E.g Counting migratory birds at night, UAV for glacial studies in Greenland and monitoring change in snow and erosion using UAV. 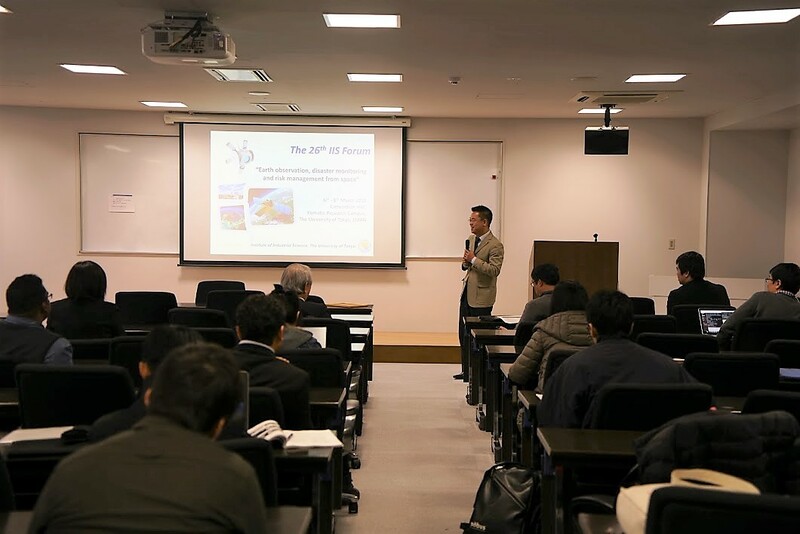 During round table discussion challenges pertaining to image segmentation and challenges in image acquisition using UAV were discussed. 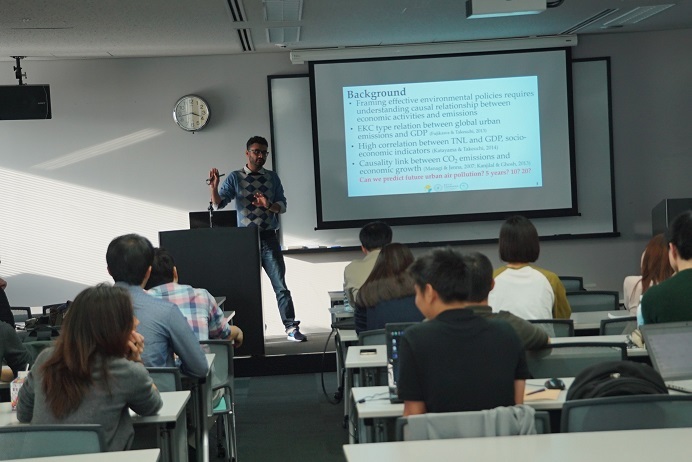 Prakhar Misra also discussed scope of cooperative localization UAV with his previous professor from India, Bharat Lohani (IIT Kanpur, India) for identifying emission sources. 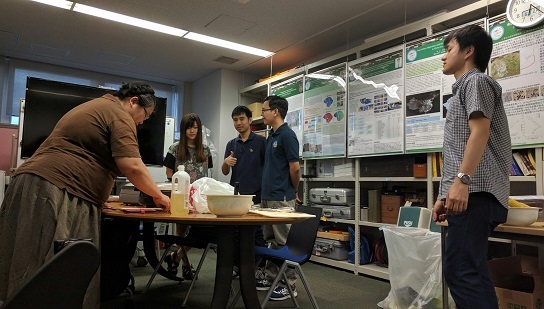 Our Laboratory held small seminar. 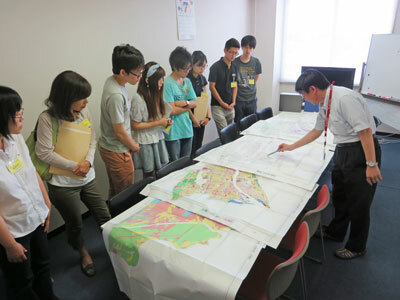 The topic is classification of objects in old Japanese map. A couple of decades ago, the satellite images were not common, so maps were only way to know what there were in those days. In order to make it clear, we had to read map signs and add color to make it easy to read. We used machine learning and tried to make it automatically. 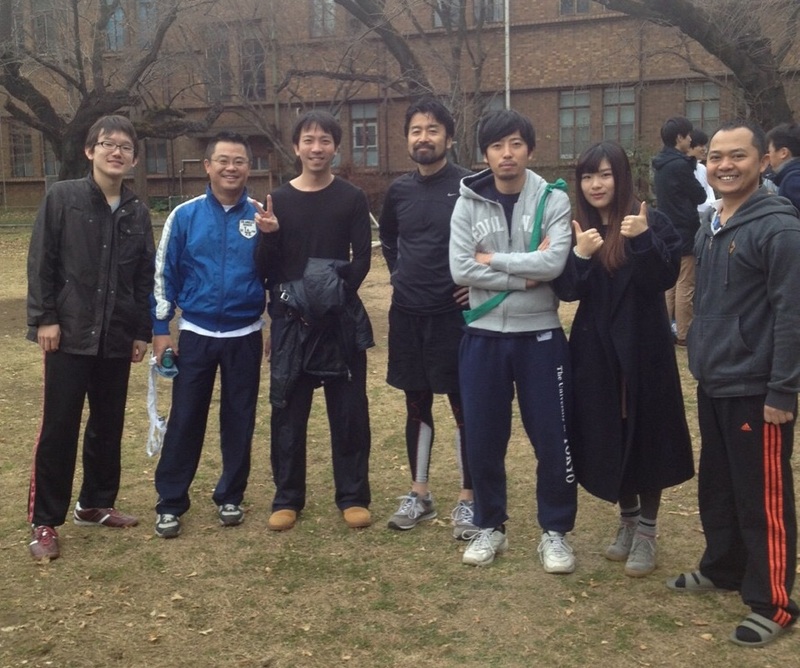 About 4 under graduate students and a few lab members attended it. Before making computer learn data, we had to make train data, which computer learn what each signature means. 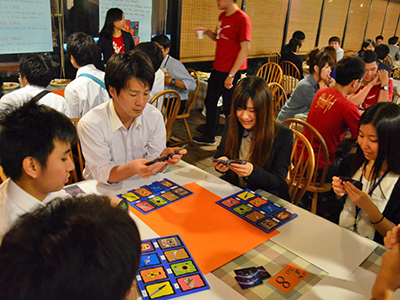 We made poligons which surrounding the same signs a lot and enjoyed it a lot. The training data showed the personality very well. One categorized small area precisely. Other one made rough poligons in a short time... The outcome was so so. 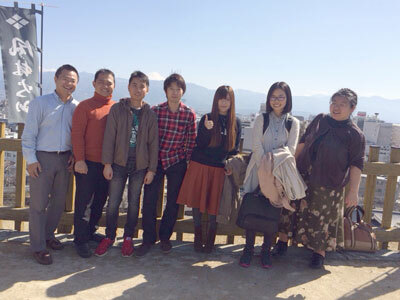 We considered the reasons and discussed with Prof. Takeuchi. I believe it was not my fault. We should also duscuss how to improve the quality from now on. Any way we completed our mission. 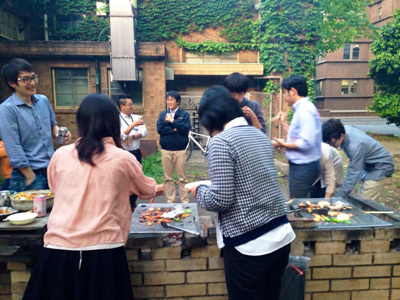 We also had BBQ party in August 10. 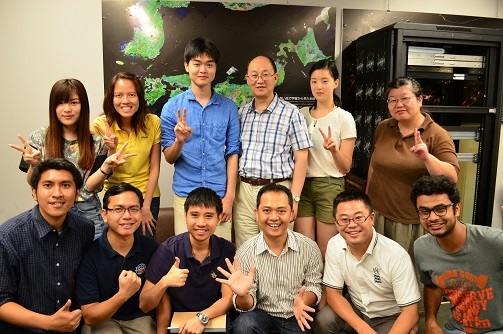 All of the lab members, some former members and some undergraduate students who took the course in this lab joined. 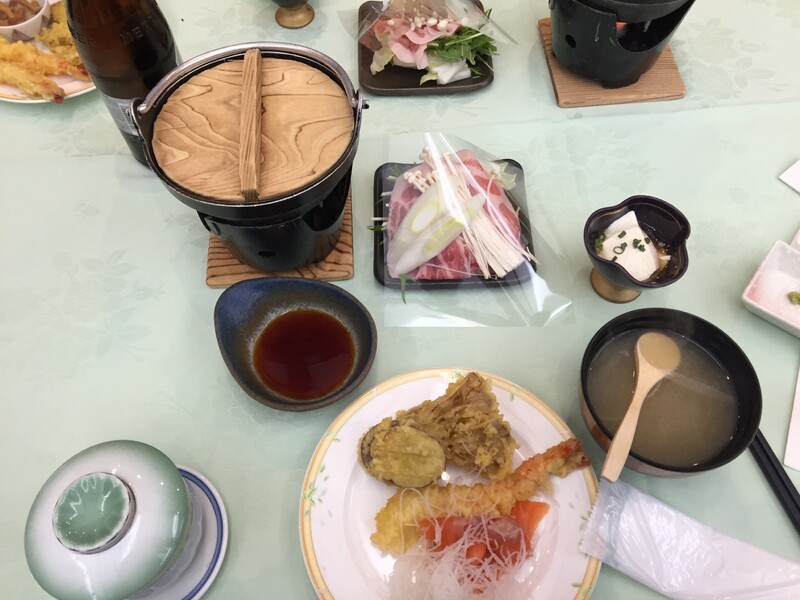 We enjoyed eating meat, drinking sake and talking a lot. 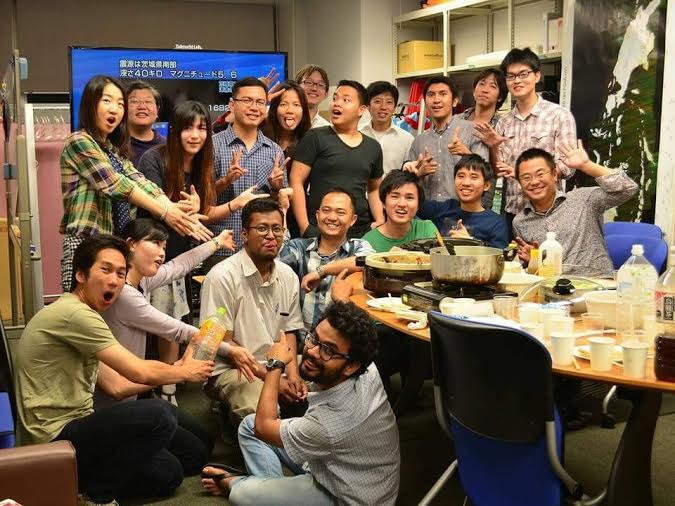 In our lab, we have the opportunity to travel so many countries during our studies. 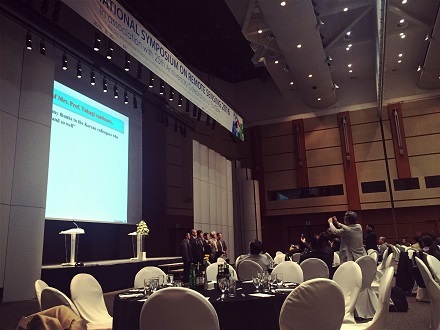 May was full of travel for all of lab members, some people went to ISRS conference in Korea and some did internship program. 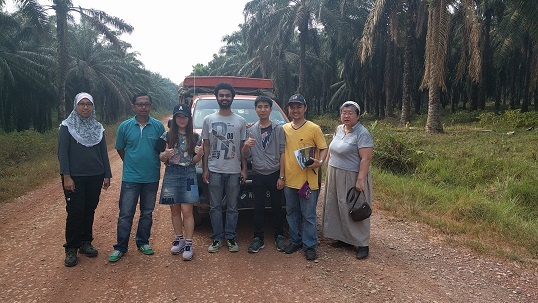 Pegah is D2 Ph.D. student working on palm oil sustainable plantation, who is in Malaysia for 2 months doing her research. 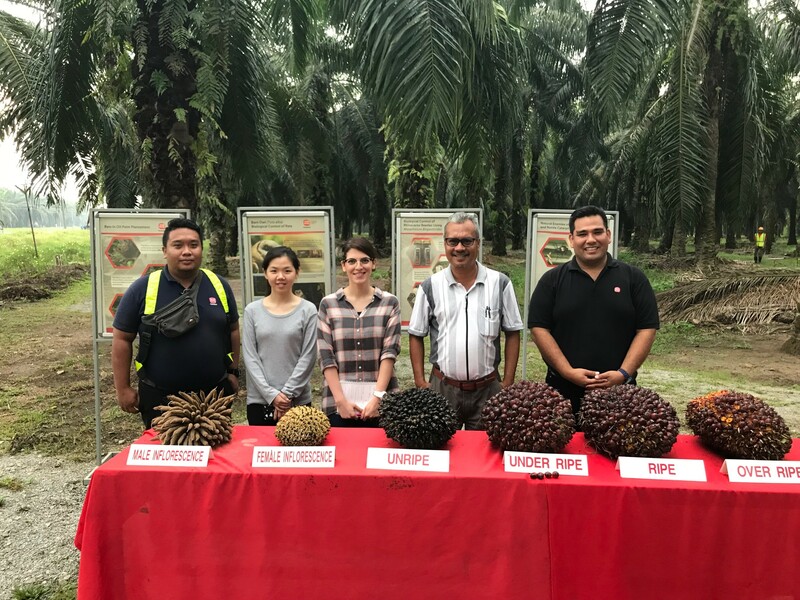 As Malaysia is one of the main countries in terms of oil palm production, it is very good opportunity for the people working on oil palm to go on field and see real industry challenges and get some insights. 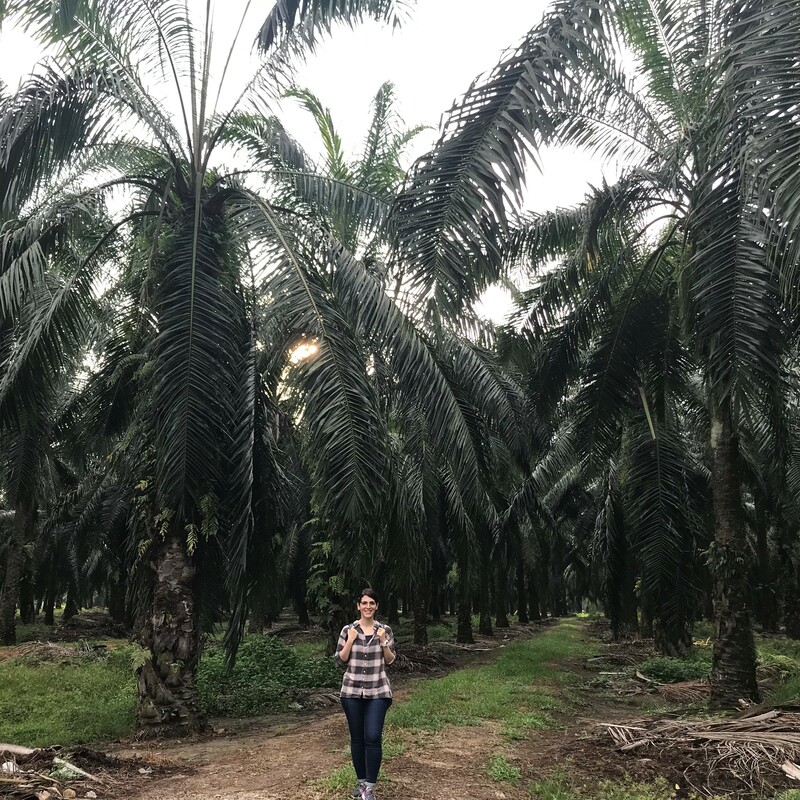 She is doing her research in the University of Putra Malaysia and in meanwhile she got some chance to go on field and discuss with palm oil expert people. 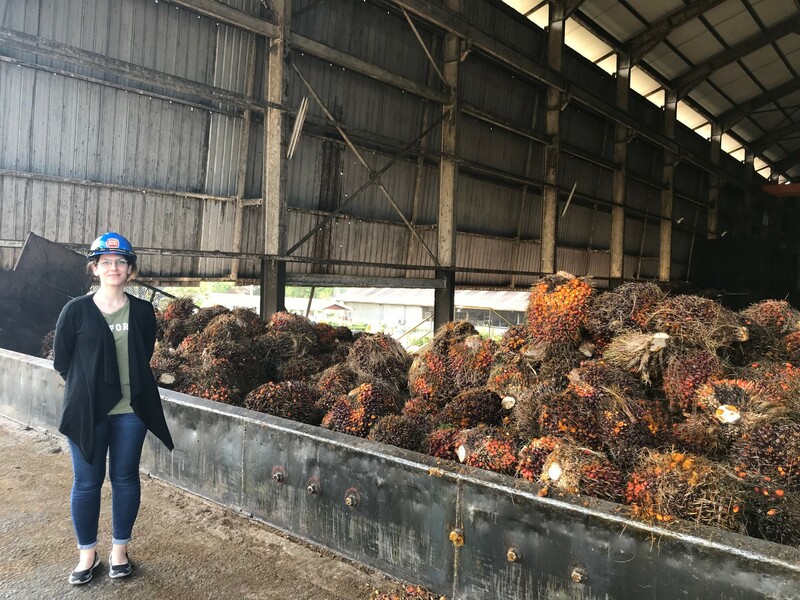 Here is some photos of her field visit and her experiences. 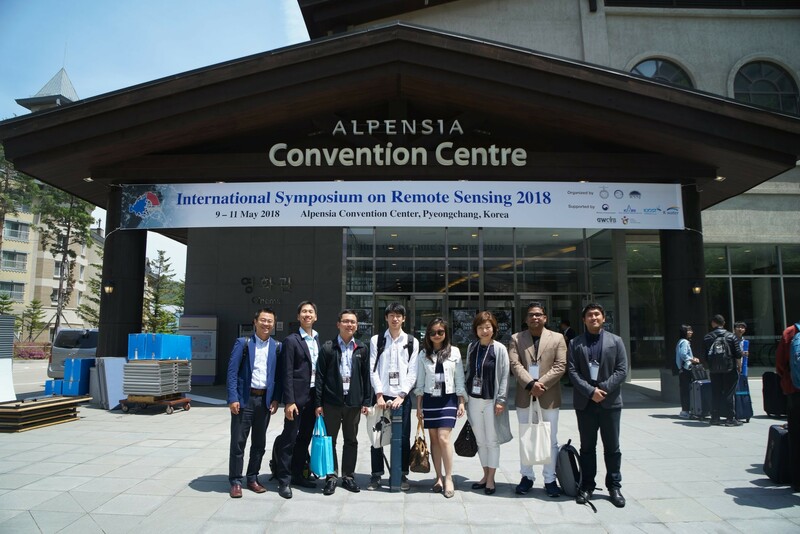 From May 9, 2018 - May 11, 2018, Takeuchi lab members took part in the International Symposium of Remote Sensing 2018 (ISRS 2018) held in Pyeongchang, South Korea. 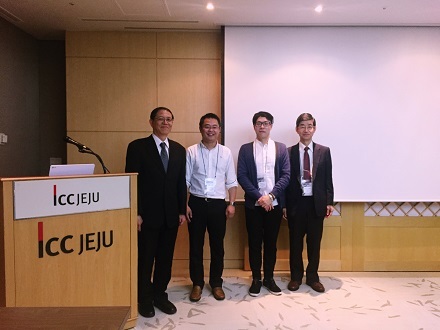 The event was organized in conjunction by the Korean Society of Remote Sensing (KSRS), Chinese (Taipei) Society of Photogrammetry and Remote Sensing (CSPRS) and the Remote Sensing Society of Japan (RSSJ). 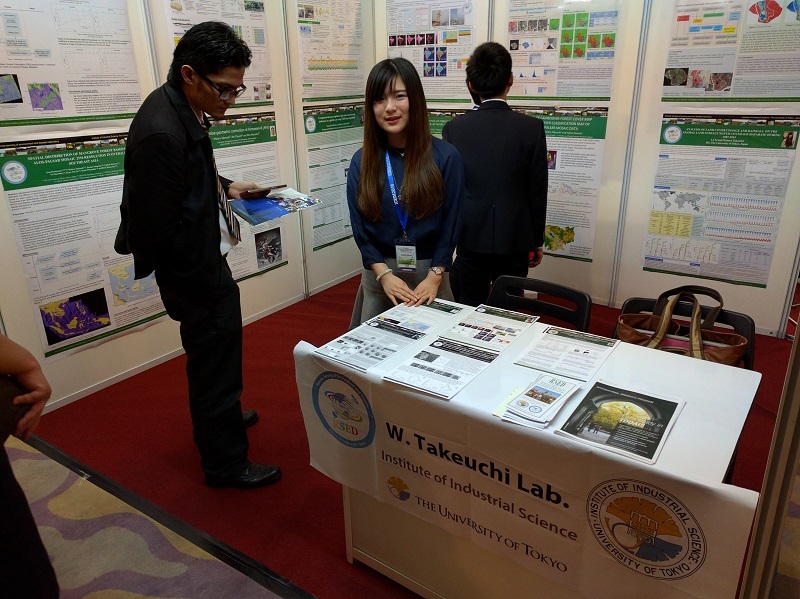 Takeuchi lab had a booth throughout the duration of the event, displaying research posters of present students and recent graduates, while offering further explanations when necessary. 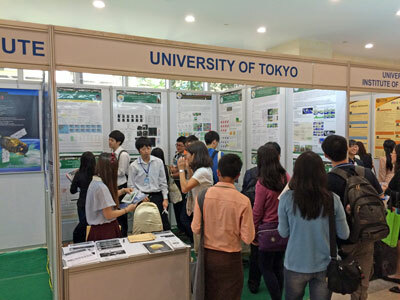 The booth also served to provide information on the Institute of Industrial Science at the University of Tokyo, and its current activities and initiatives. Booklets and pamphlets were made available to those interested. 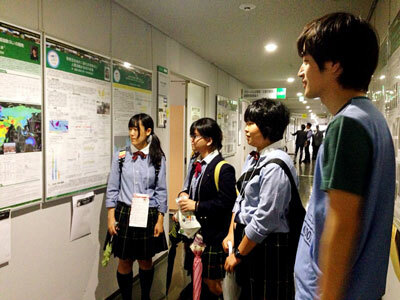 Furthermore, during the symposium, four students made oral presentations, while a further 2 made poster presentations. These are outlined as below: Oral Presentation Anjar - Estimation of Global Crop Calendar and Intensity using the MODIS NDVI time series from 2001 to 2015 Rahe - Crop calendar mapping for AWD assessment over Bangladesh with MODIS time series from 2001 - 2016 Jeark - Assessment of Solar PV Power Potential over Asia Pacific region with AHI8 Truong - Seagrass mapping in Khanh Hoa province, Vietnam using Satellite Imagery and UAV Poster Presentation Trang - Dynamic Air Pollution Mapping For Ho Chi Minh City using Portable Sensors Arthur - Combining Nighttime Lights analysis with urban analysis in 2D and 3D on a multi-city scale Through such presentation sessions, students were able to exchange knowledge and opinions on their research topics, and were able to gain new hints for improving their current works. 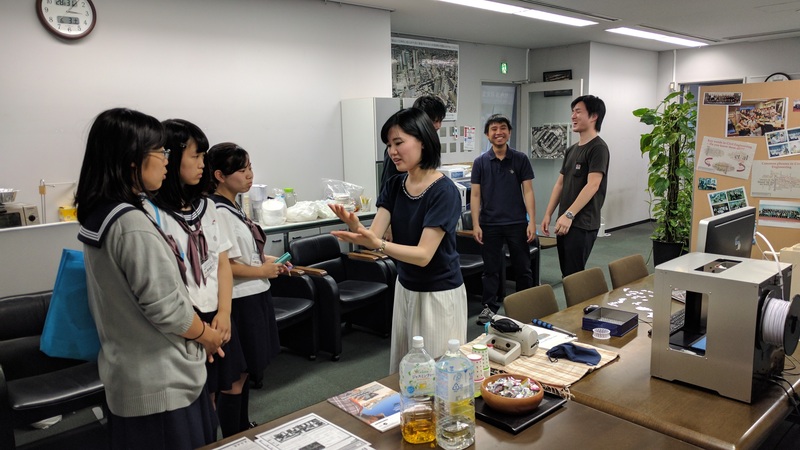 Aside from such presentation sessions, the Young Scholar’s Night also provided a fantastic opportunity for laboratory members to build rapport and connections with students from various overseas institutions. 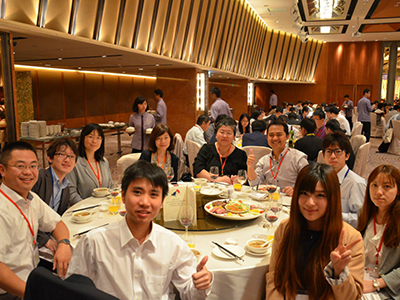 We look forward to next year’s event to be held in Taiwan. 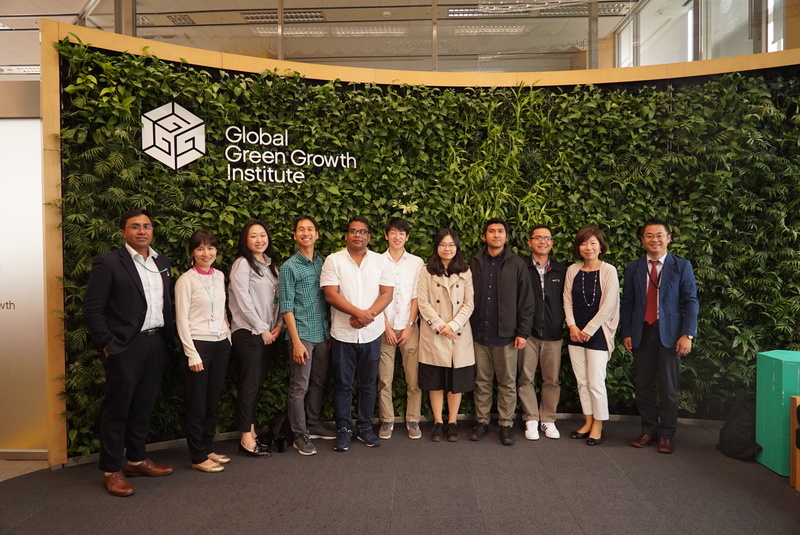 On May 8, 2018, at Takeuchi lab members presented at a workshop organized by the Global Green Growth Institute at their office in Seoul, Korea. 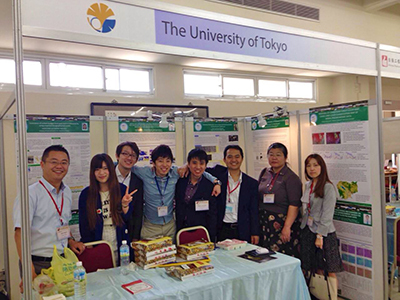 Six students from the lab, as well as an alumnus, Dr. Haemi Park, participated from Takeuchi Lab side. 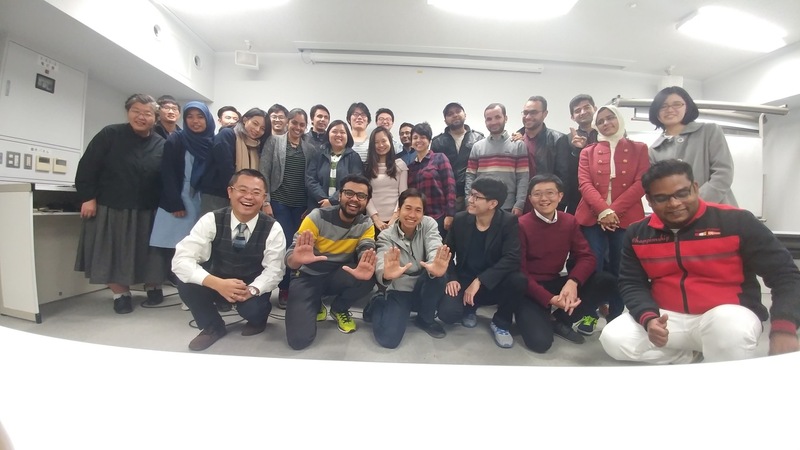 From GGGI side, we were host by Dr. Pranab Baruah, Senior Knowledge Manager, who also used to work at Takeuchi lab in a post-doctoral position. 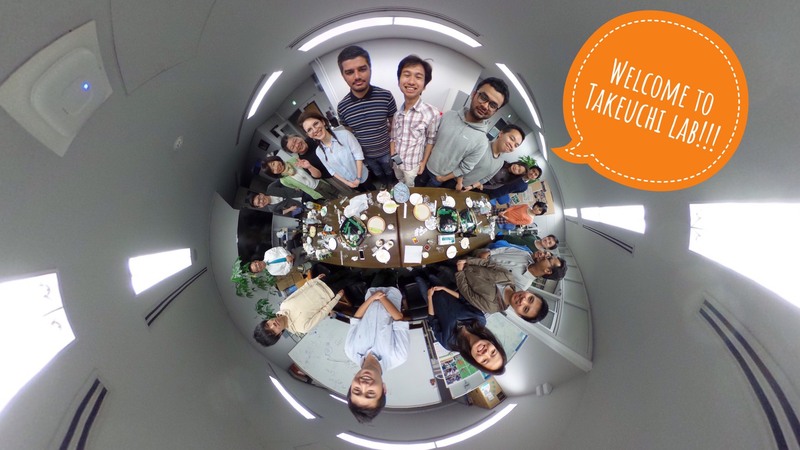 Members of GGGI at the office took part in the workshop, as well as country representatives from overseas who participated through Skype. 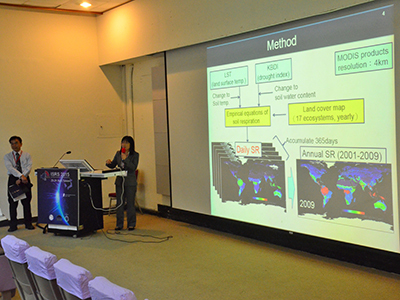 Professor Takeuchi introduced Peatland carbon modeling research in Kalimantan, Indonesia, using remote sensing data. He emphasized on the carbon emission estimation from forest fire because its amount is comparable to that of industrially produced emissions. 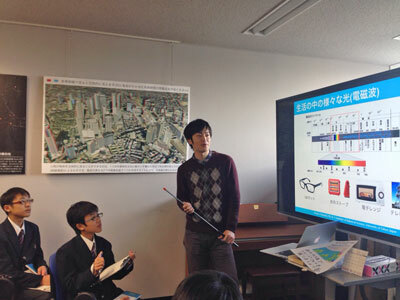 Jeark, PhD candidate from Takeuchi lab, presented about patterns in solar photovoltaic power generation under the effects of meteorological factors. 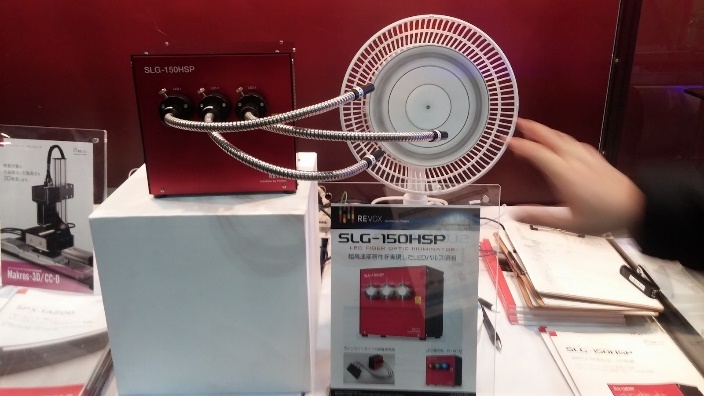 He discussed the effects of dust on power generation efficiency, which suggested that being able to control the dust level would increase the PV generation in urban area. 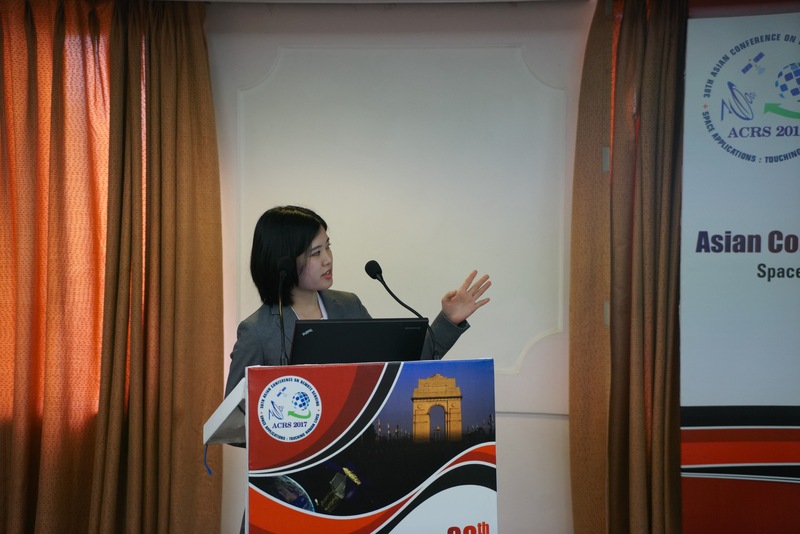 Trang, PhD candidate from Takeuchi lab, presented about measurement of personal exposure to PM2.5 in Tokyo, HoChiMinhCity and New Delhi using portable sensors. 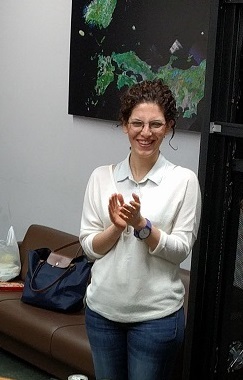 She is exploring new insights that the unique method could provide about quality of life in urban settings. 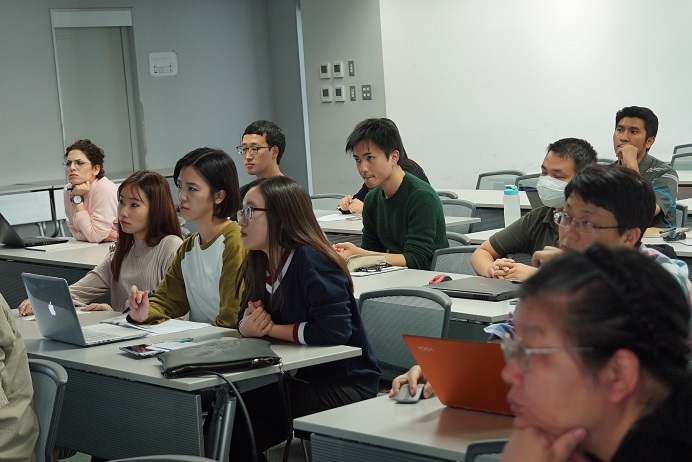 After the presentations, we had a lively discussion with participants online, as well as members of GGGI presented at the workshop. 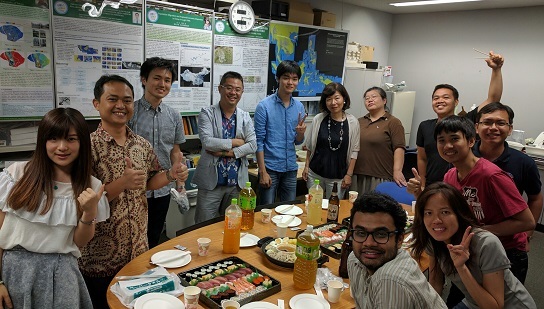 We established some research connection and data exchange with collaborators from Indonesia. 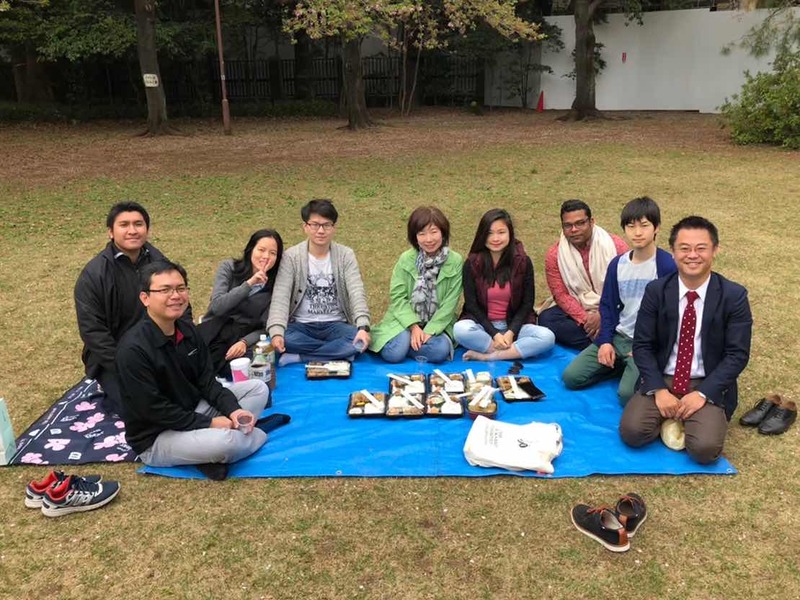 On April 5, 2018, Takeuchi lab went to Komaba Park for a picnic. 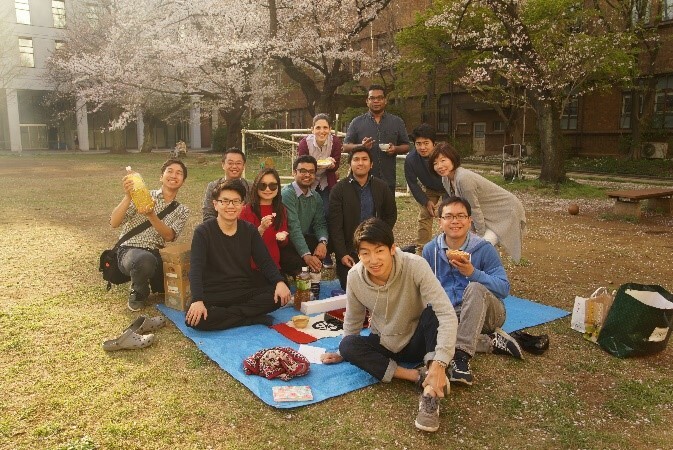 Although no more cherry blossoms could be seen, the trees and grasses welcomed the group with cool air that made it a perfect day for lunch together in the park. 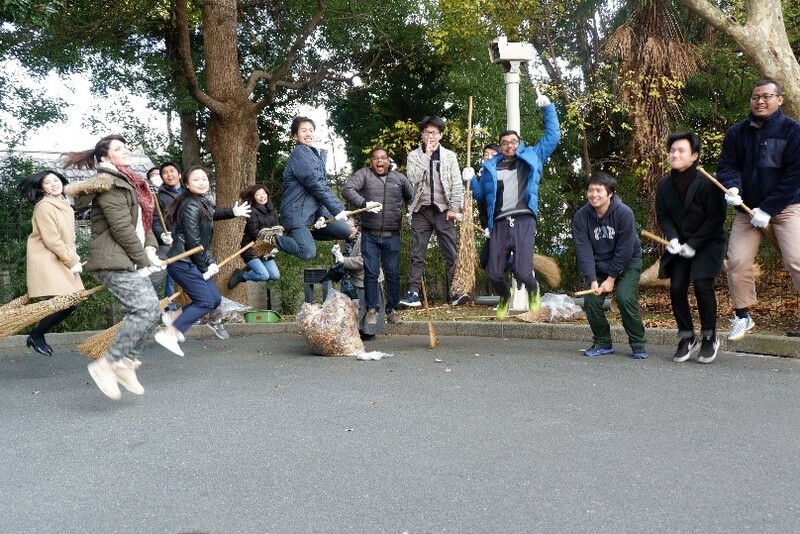 Right after the picnic, the group also went to the old Maeda Family’s house located within the park itself. This was not part of the plan that day, but it’s as if the house is attracting the group to come inside. We were privileged to explore not only the rooms allowed for visitors but also to some rooms which were restricted from ordinary visitors. The house was unique because tatami floors can be seen everywhere in the house, not only inside the rooms. The garden was also fascinating. 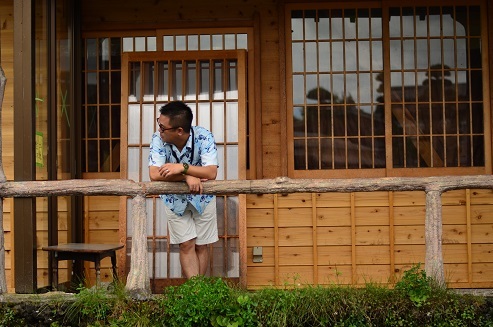 You can imagine sitting in the veranda and sipping a cup of coffee or tea while enjoying the relaxing feel of the garden in Maeda family’s house. 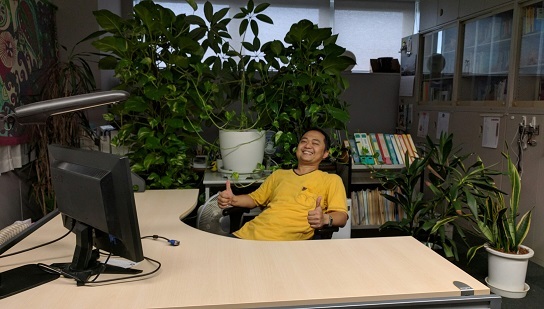 It’s interesting to know that in the busyness of research work, we can go outside and in around 10 mins by foot, we can be refreshed in a nearby park and a well-maintained family house and garden. 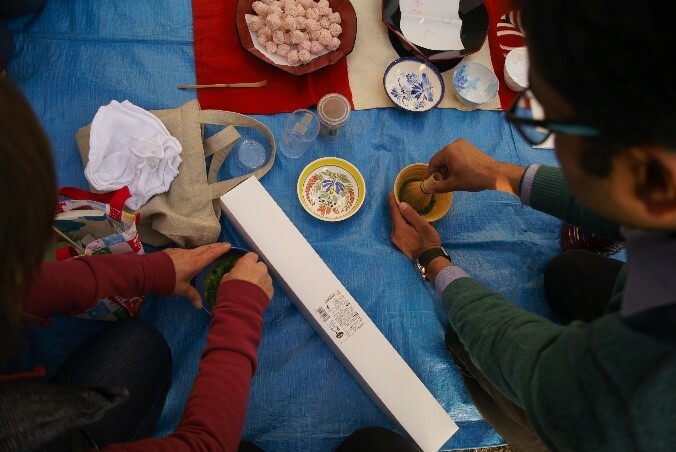 In Takeuchi lab hanami party this year we had enjoyable moment when practicing traditional green tea ceremony in the university square. 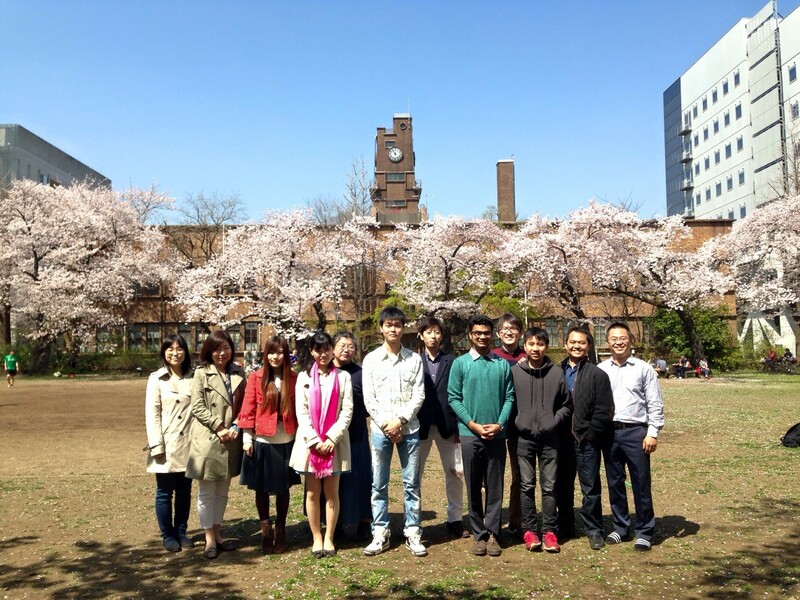 This Sakura season let us take a pause to reflect on our achievements and think about the future. The blooming flowers also symbolize the transience nature of life and preciousness of time in hand. 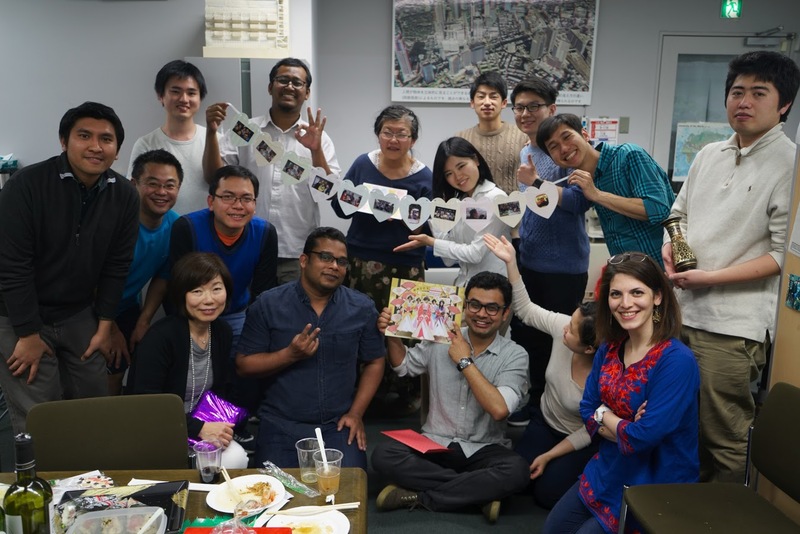 On a peaceful yet melancholy Monday evening, we held the farewell party for our parting lab members: Etsuko Nakazono, Arif Aditya, Prakhar Misra, Kazuki Inoue and Seina Uchida. 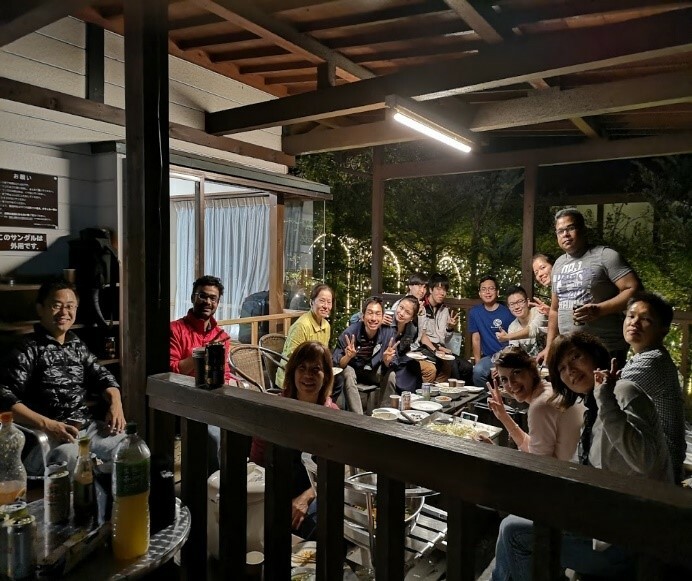 Sushi, yakisoba and Kirin beers, we enjoyed those commonly seen yet very representative Japanese cuisine and beverages, hoping those taste can be the most befitting Sayonara for those who’ll leave Japan soon. 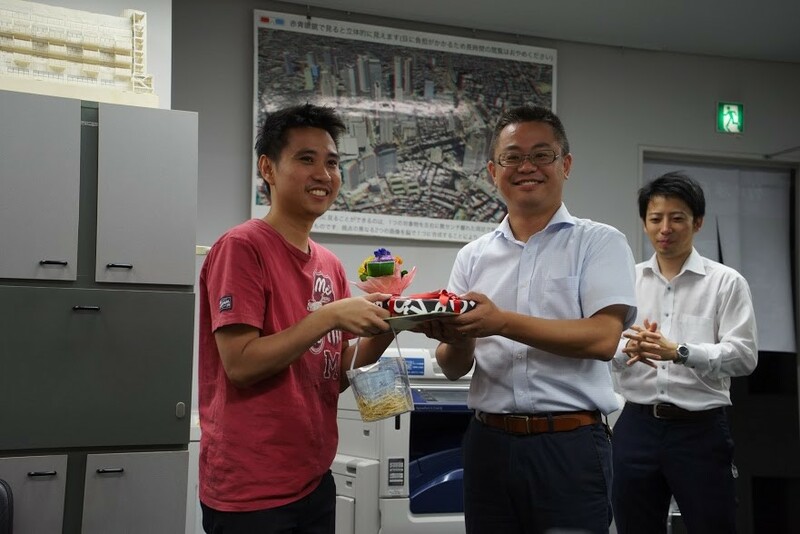 This heart warming, taste satisfying party ended in exchanging parting gifts and farewell speech. 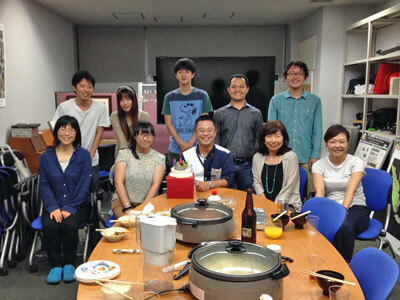 We Takeuchi lab wishes all of parting members bright future and happy life. 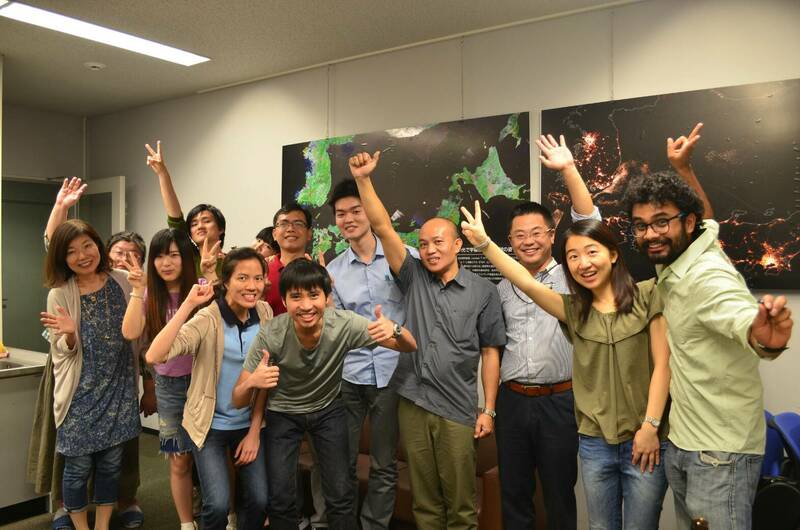 Takeuchi lab hosted the 26th IIS Forum about Earth Observation and Remote Sensing. 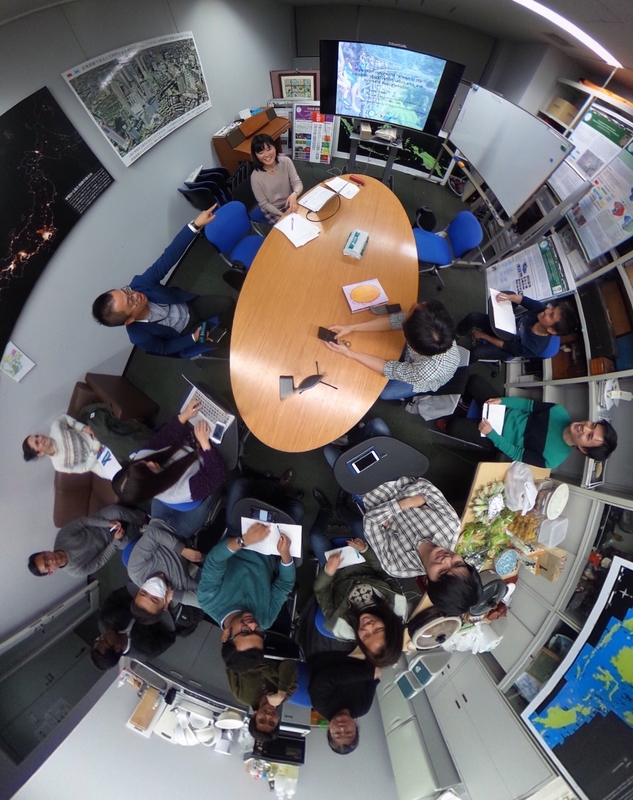 For the first time, we also held a Google Earth Engine (GEE) workshop where we introduced GEE as a powerful platform for remote sensing analysis, and did a small project where we collaboratively created training data for land cover classifying of whole Japan. 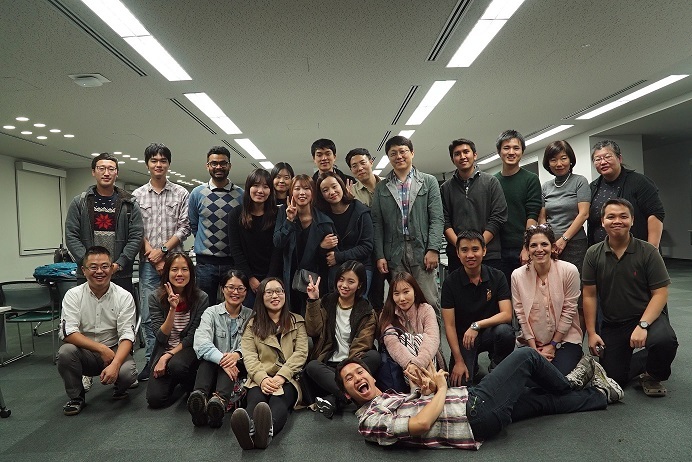 Forty scientists and students joined the workshop, and on the third session, we did a project: "Collaboratively create training data set and merge them to classify for whole Japan using three years composite of Landsat images”. 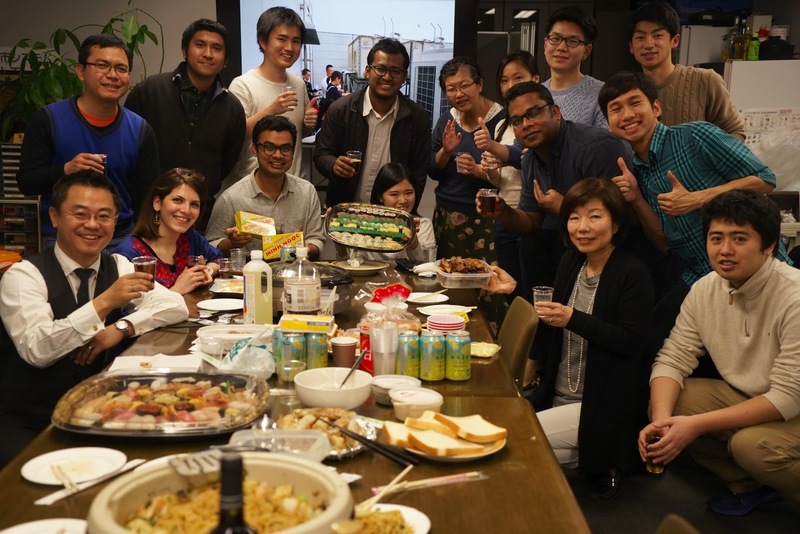 Through hours of building the infrastructure on Google's platform, discussing ideas and sharing codes around, we successfully completed the project. Each group gave a small talk of their results and shared their experience about the workshop. 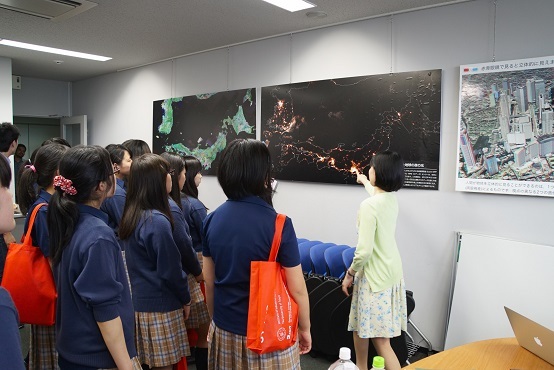 A high school student shared that she was very excited to be introduced to Remote sensing tool, and she would be looking forward to applying the skill in the future. 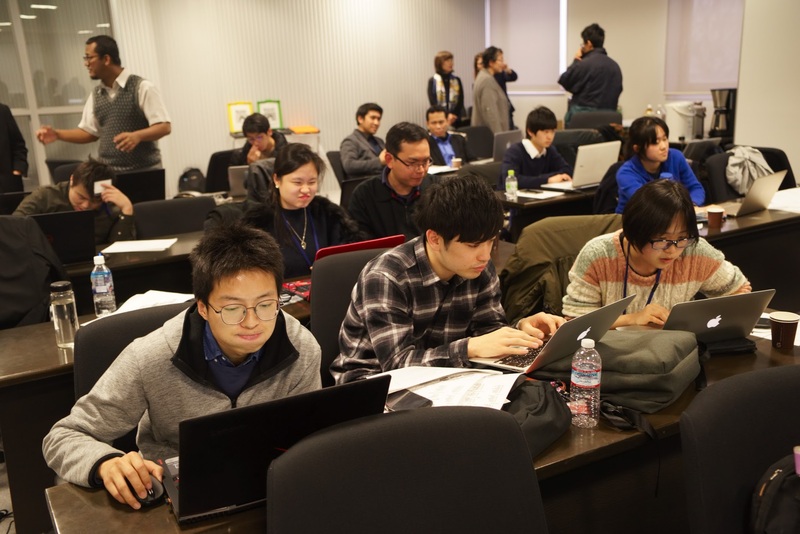 Many professors who participated in the workshop exclaimed that the tool would be potential for education. 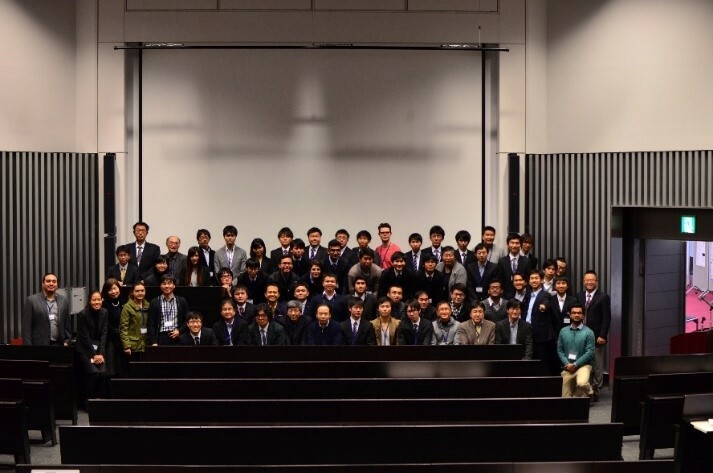 The 26th Institute of Industrial Science (IIS) Forum conference held on 6th to 8th March 2018, hosted by Remote Sensing of Environment and Disaster (Wataru Takeuchi) Laboratory. 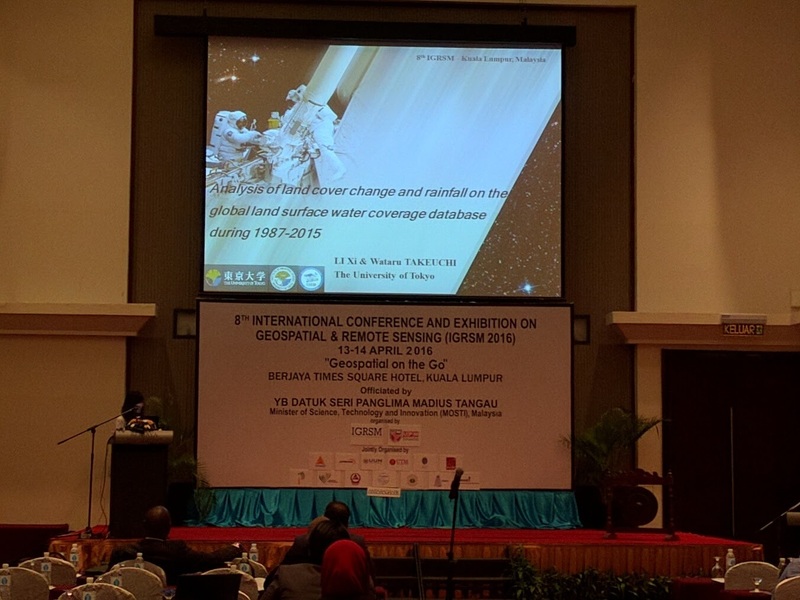 The earth observation, disaster monitoring and risk management from space is the main theme of the conference. 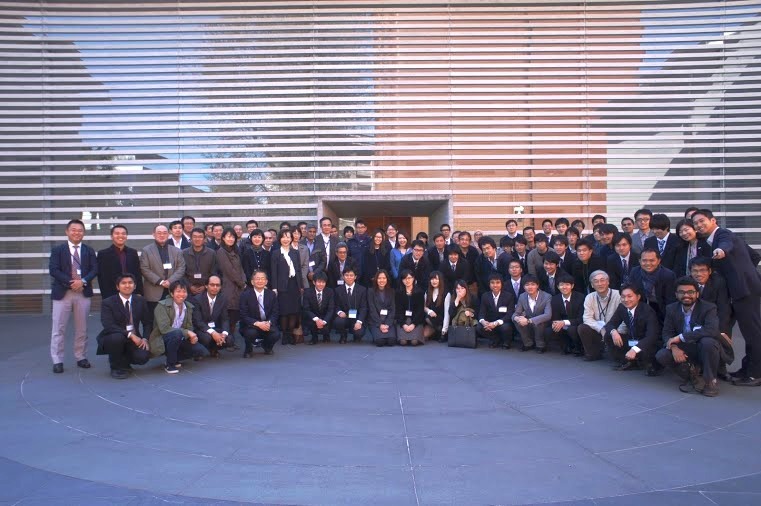 The participants from national and international area attend the conference. 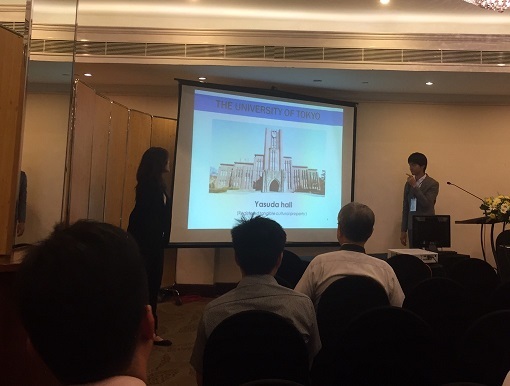 In the conference, Nineteen (19) oral presentation and thirty-two (32) poster presented by the national and international researcher from distinguishing Universities and Organization on the various aspects of remote sensing application of environment and disaster. 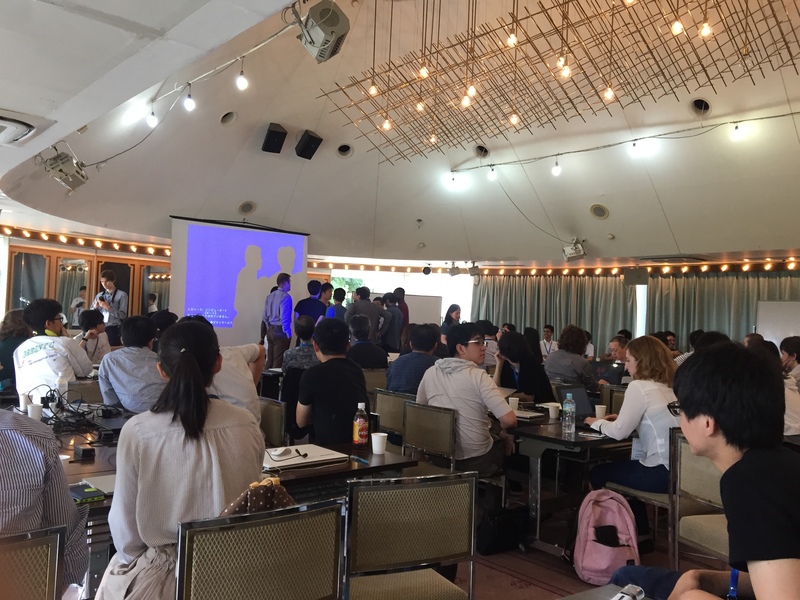 The conference started with the welcome speech of the Convenor of the organizing committee, Wataru Takeuchi, Associate Professor, IIS, University of Tokyo. 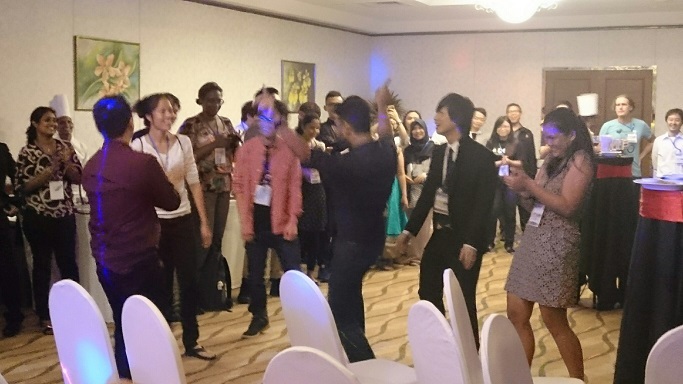 The ice-breaking party, Tea circle, Dinner party are the special attraction the participants and creates a visitants environment for the young and experienced researchers. 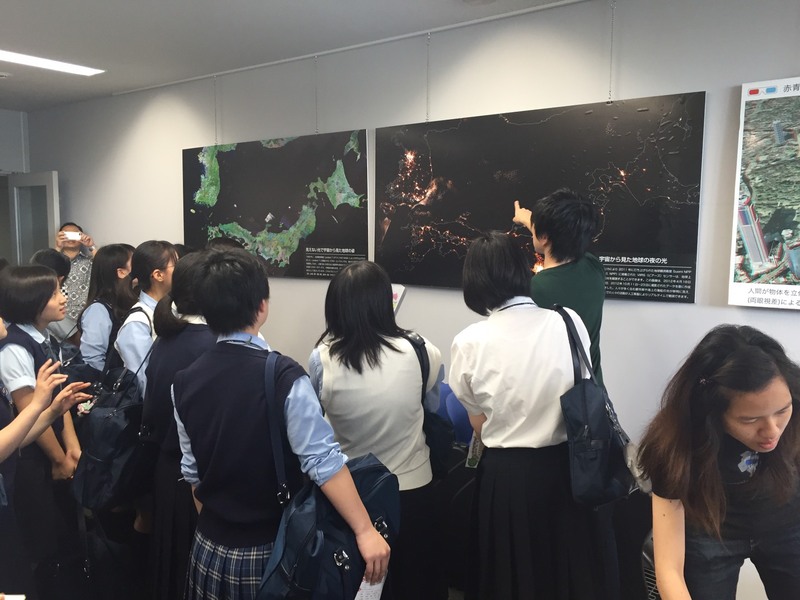 Along with the presentation, the main attraction of this forum was hands-on training on Google Earth Engine. The participants enjoy, share and learn a lot from this forum and appreciates the organizers. 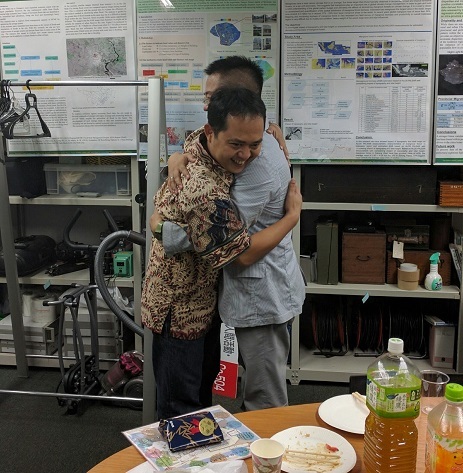 On behalf of the organizer, Associate Professor Wataru Takeuchi express his thankfulness to the participant and the organizer, and he hopes to organized better program in next time. 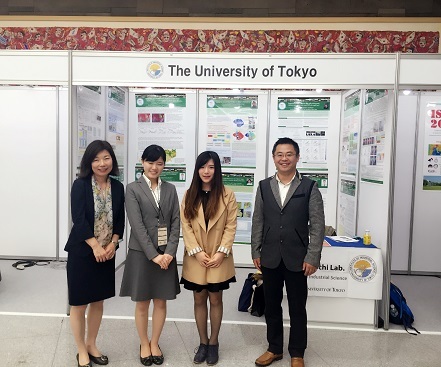 As our laboratory is hosting 26th IIS forum "Earth observation, disaster monitoring and risk assessment from space" on March 6th-8th, this month all the lab members were quite busy by preparation in order to have warm welcome and well organized forum meanwhile students also prepared themselves to present their researches in IIS forum, ISRS 2018 on May and 9th IGRSM on April. 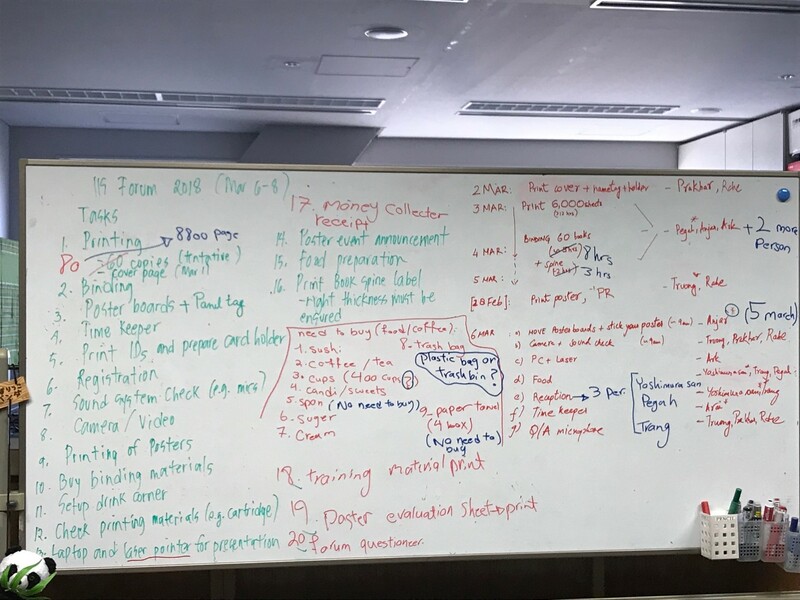 However, this month was quite busy for all of us but we enjoyed from Japanese attitude of team-working and inspired by our beloved Japan, we prepared our huge checklist to be well-prepared. 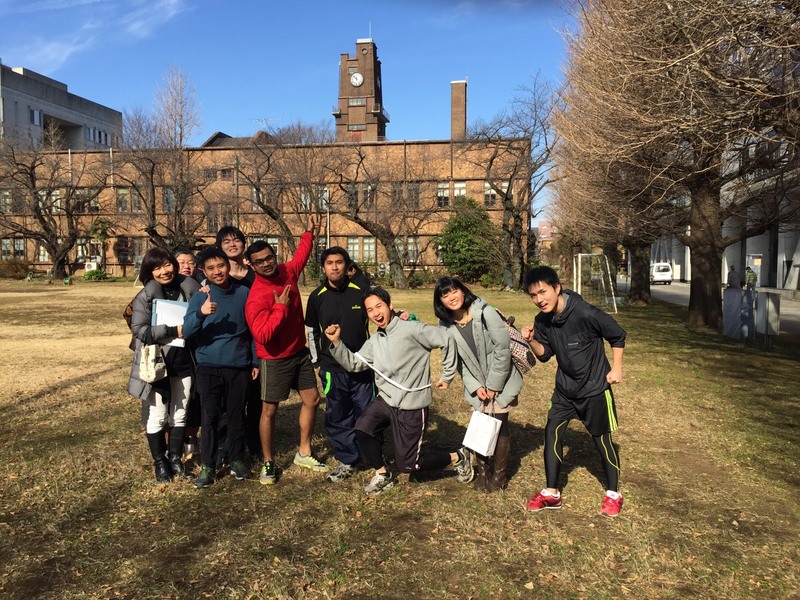 We are looking forward to welcoming so many applicants in going IIS forum at UTokyo. 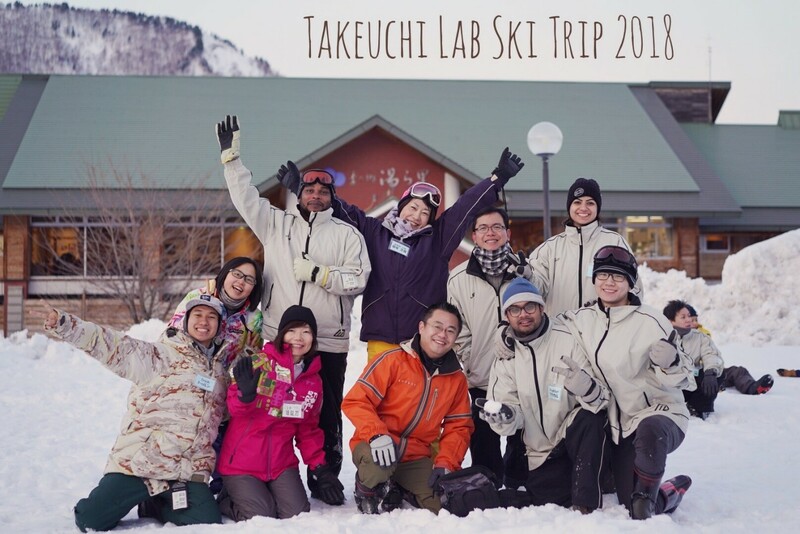 On Feb 23-24, 2018, Takeuchi lab joined with Kuwano Lab in ski tour in Aizu Daikura Skiing .We enjoyed snowboarding and had very good time together! 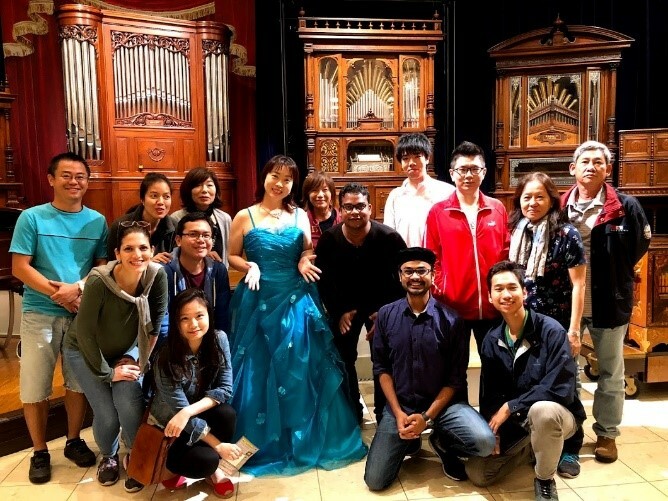 It is the best way to spend 2 days away from city and this tour allows us to create memorable winter wonderland experiences that will surely last a lifetime, especially for lab members who come from tropical countries. 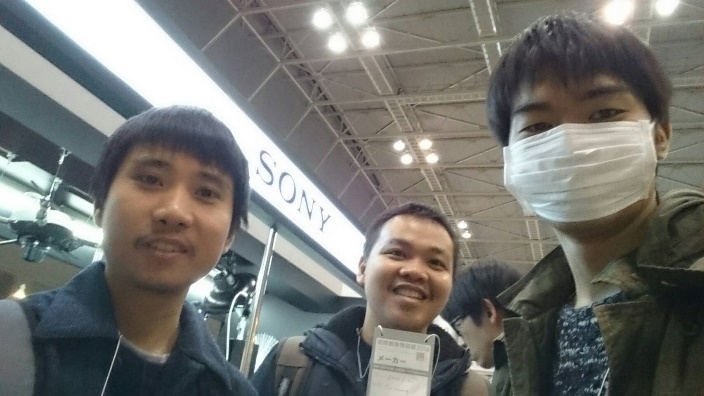 All of us are waiting for the trip next year! 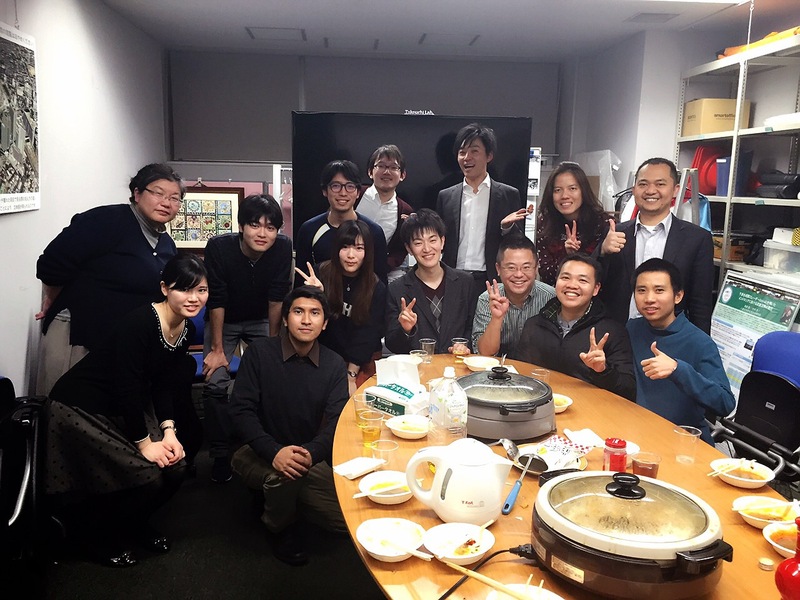 On January 15, 2018, we invited Prof. Kazuyuki Inubushi from Graduate School of Horticulture, Chiba University, Prof. Towa Tachibana from Faculty of Law, Politics and Economics, Chiba University, and Dr. Kei Oyoshi, EORC, JAXA. 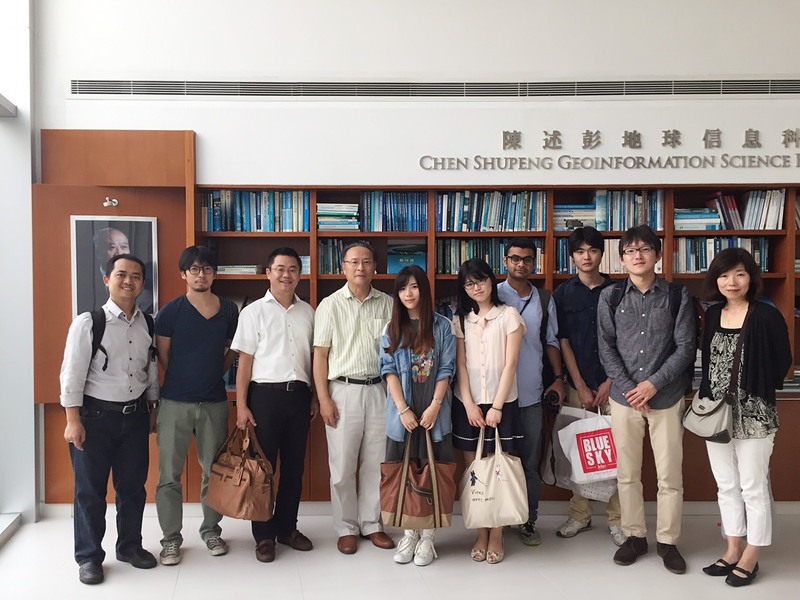 They talked us about their research topics which are not only remote sensing but also environmental economics. 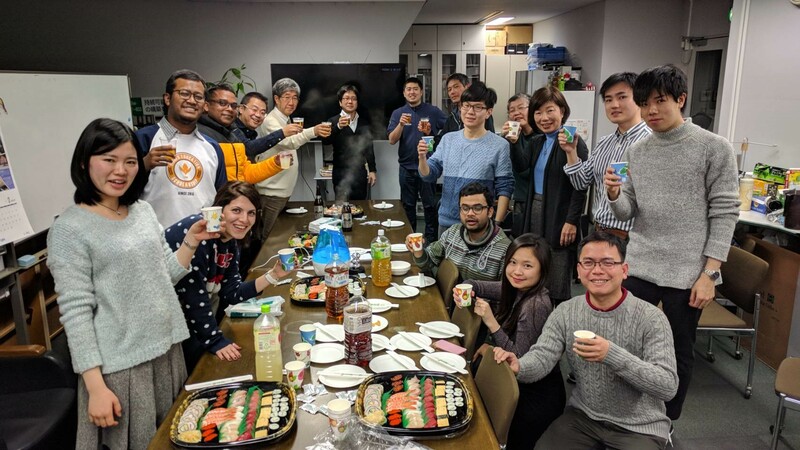 After a lively discussion, we had the new year Sushi-party. 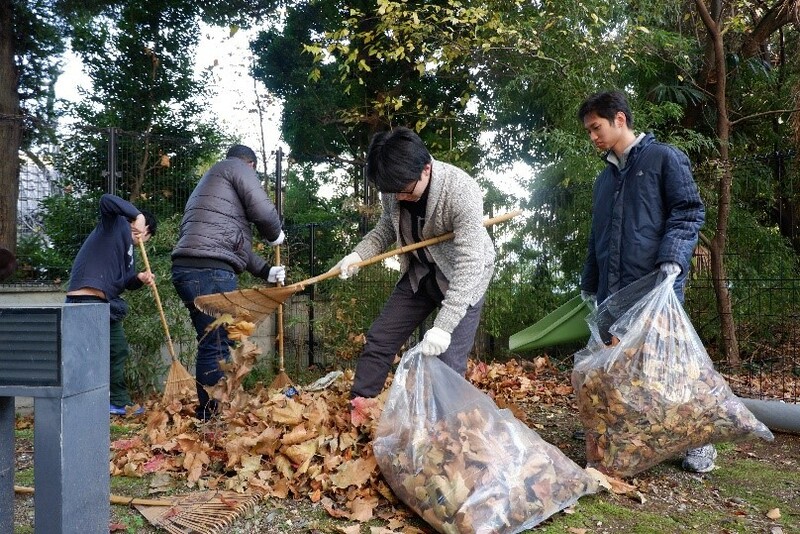 Rahe, Yan, Truong and Arai san from Takeuchi laboratory tried to clean dry leaves in one of IIS corner side. 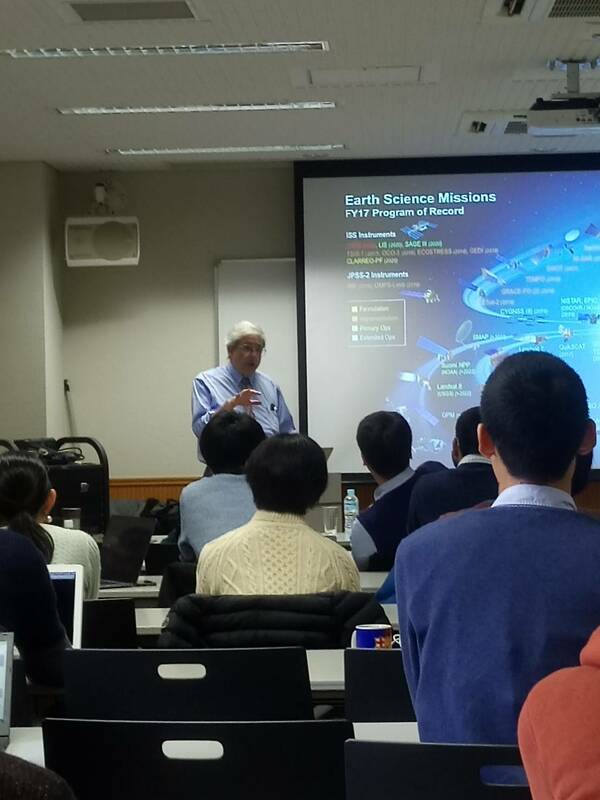 On December 1st, 2017, Takeuchi lab members attended a lecture delivered by Dr Michael Freilich, Head of NASA’s Earth Sciences Division at Kashiwa Research Complex, Kashiwa Campus of The University of Tokyo. 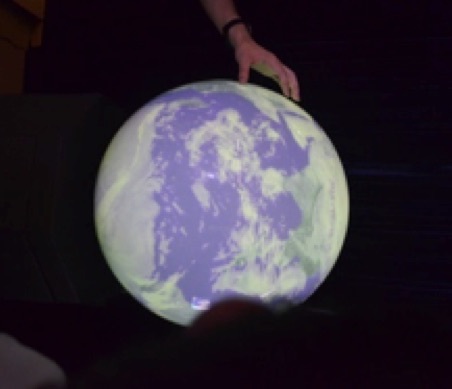 Dr. Freilich gave a comprehensive over of the NASA’s Earth Science Division and its missions. The attendants were amazed by the extensive coverage of the satellite fleets, in aspects of quantity and quality of data, as well the vast variety of application. 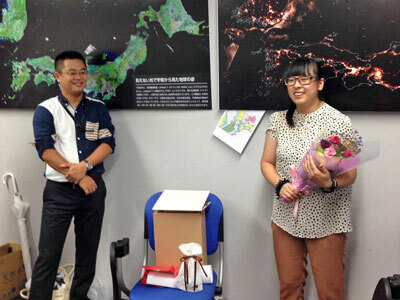 The lecturer stressed on the importance of understanding Earth as an integrated system, rather than isolated components. We took a close look at the hydrological cycles, and how the analysis of arctic sea-ice loss, changes in amount of groundwater, precipitation and soil moisture, contributes to explaining the changes in sea level. 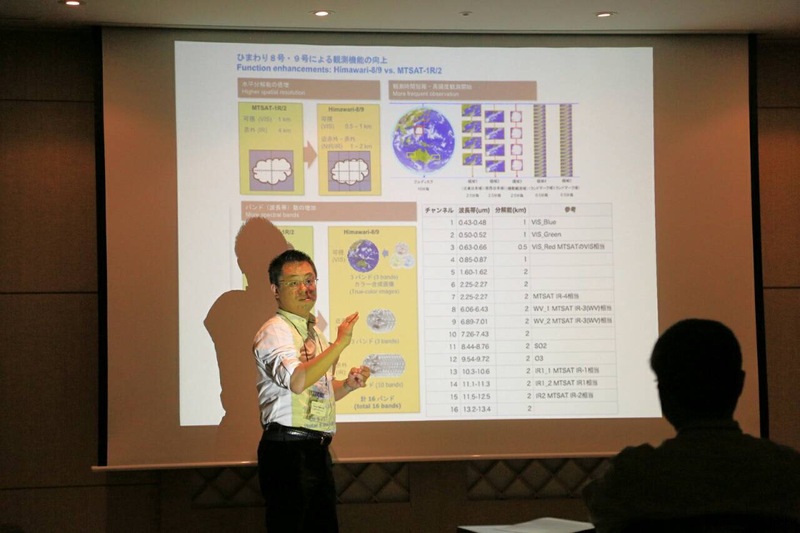 Dr. Freilich highlighted the contribution of the GPM constellation, in which JAXA plays an important role, in collecting crucial data on global precipitation. 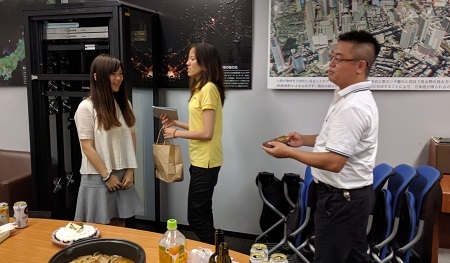 The talk was followed by a question and answer session, where Takeuchi lab members passionately raised discussion about the usage of satellite data and prospects for future research. 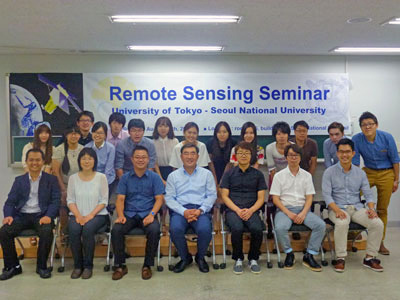 We completed a training course of Remote sensing. 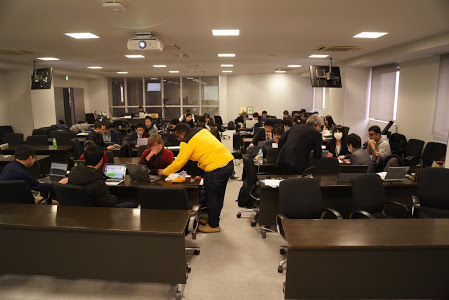 In this course, we hold hands-on training of land use classification & land use detection with google earth engine, future prediction of land-use with cellular automaton, machine-larning application for presize mapping with pix2pix module of python. 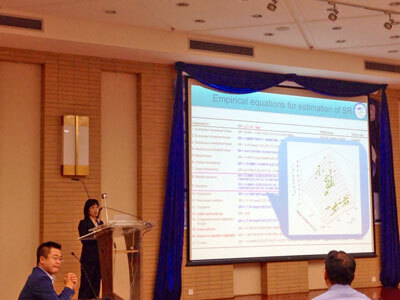 at the final course, we could see very nice data interpretation from each student's presentations. 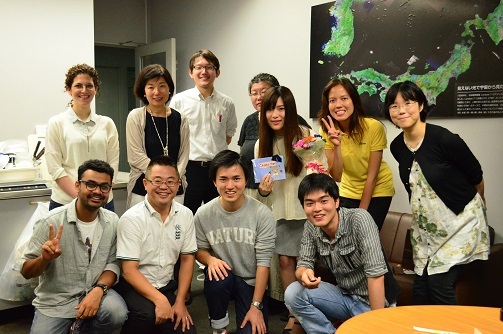 Thank you very much for your great lecture, Takeuchi-sensei and Prakhar-san, and Thank you so much for all of your active participation! 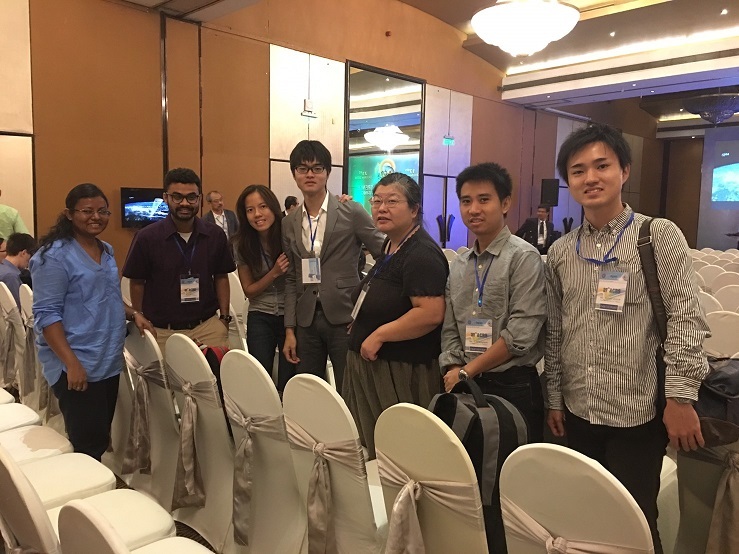 From October 24 to Oct 27, members of Takeuchi lab participated in the 38 th Asian conference in remote sensing held at hotel the Ashok, new Delhi, India. 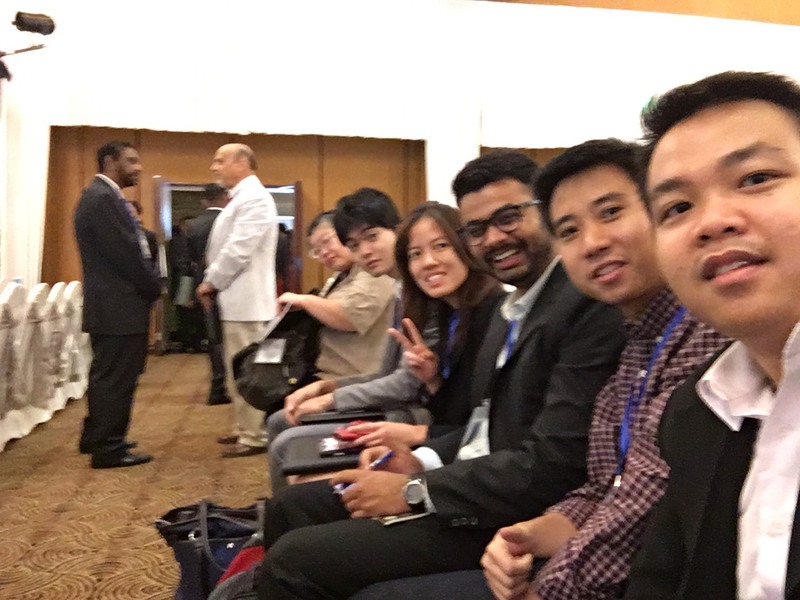 The conference gave invaluable opportunities for members to present our research and hold discussion with other researchers in the field. 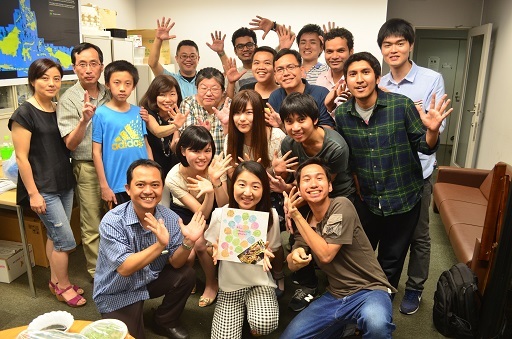 All members in the lab presented their research either orally or via a poster. 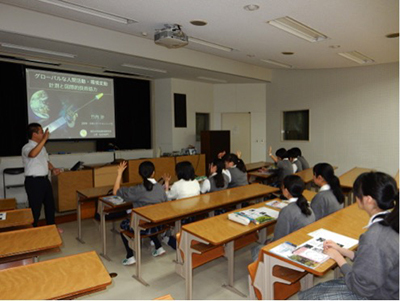 The themes of presentation are about utilizing Remote sensing techniques for earth observation purpose. 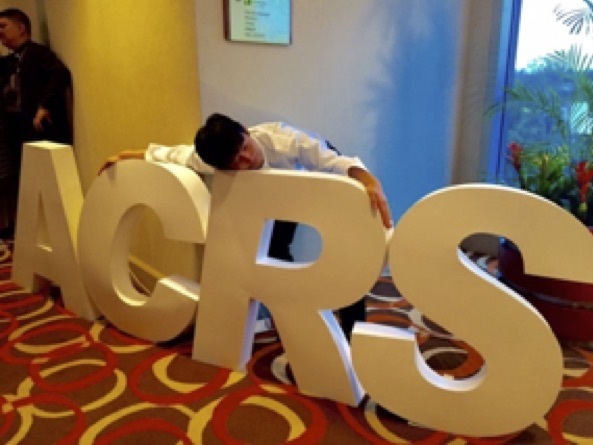 The details can be found at the ACRS 2017 ‘s homepage, URL here. 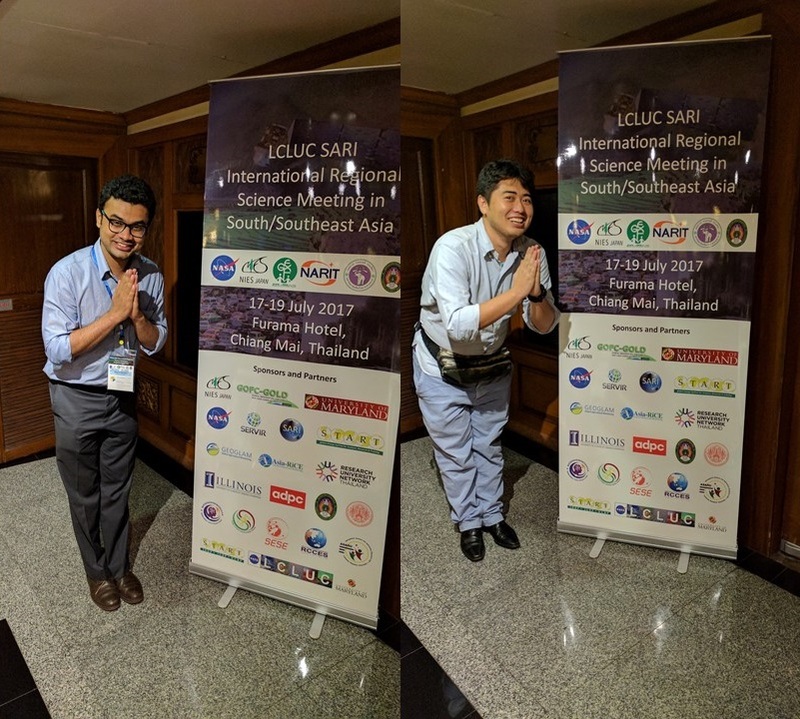 http://www.acrs2017.org/ We were also able to attend several plenary sessions, with many impressive speakers presenting the latest development in the field remote sensing. 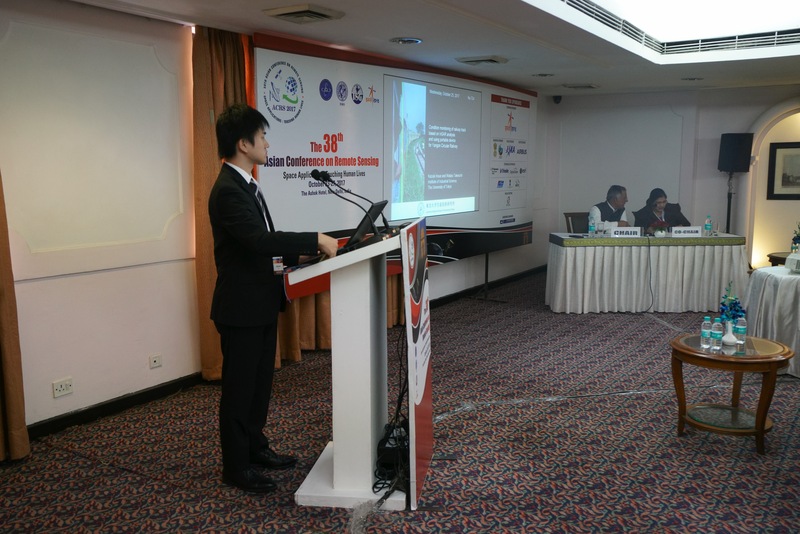 For example the session about ISRO, China, JAXA,... 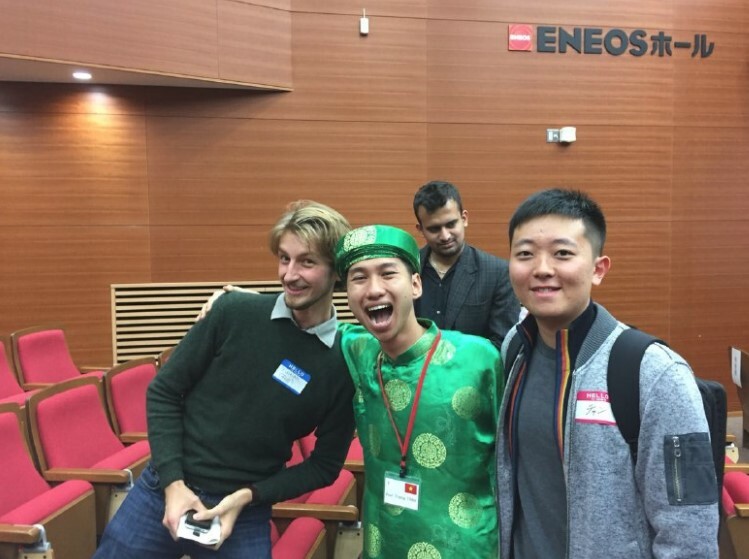 Besides academic discussion, the conference was also an invaluable opportunity to create networks with other researchers. There were usually plenty of time after each sessions to have further discussion, to follow up on a question if there is still room for development. 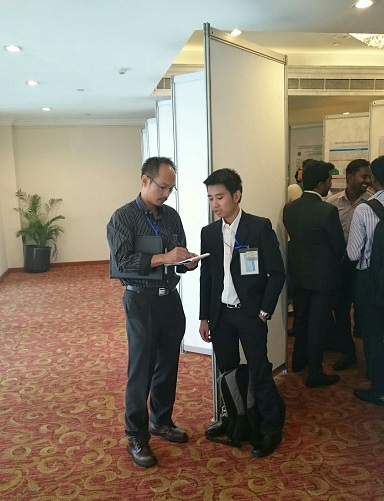 After the conference, all members made many new contacts with scientists in the same field, and expanded their academic networks. 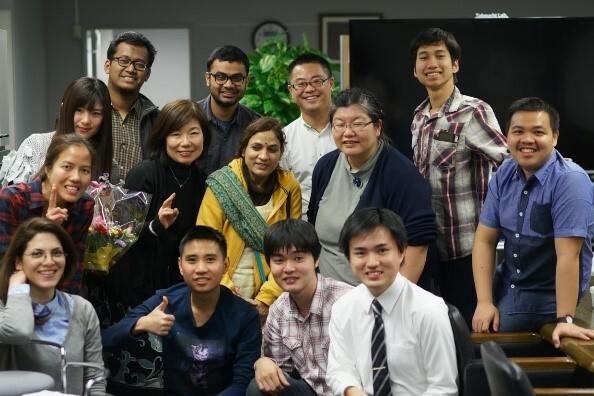 Takeuchi lab members also got to meet with an alumnus who is having business in New Delhi. 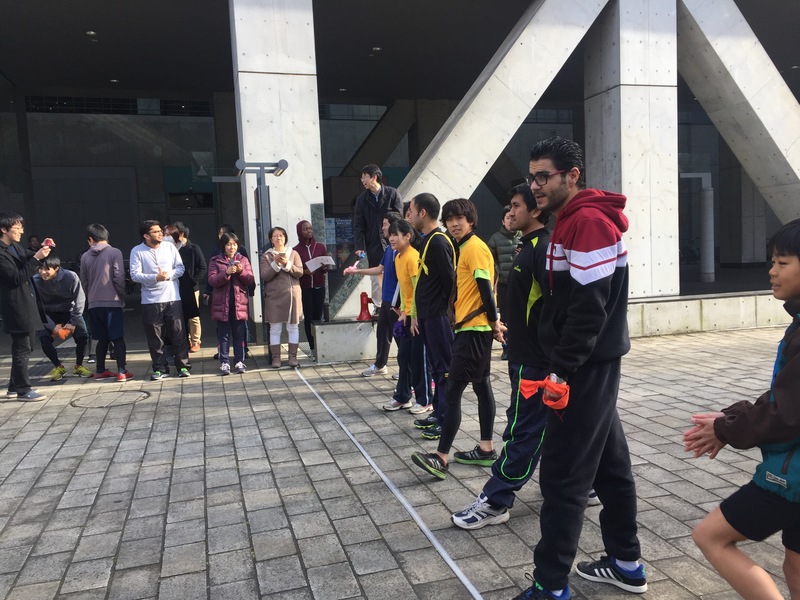 Today the Komaba Research Campus International Day 2017 was held at ENEOS Hall. 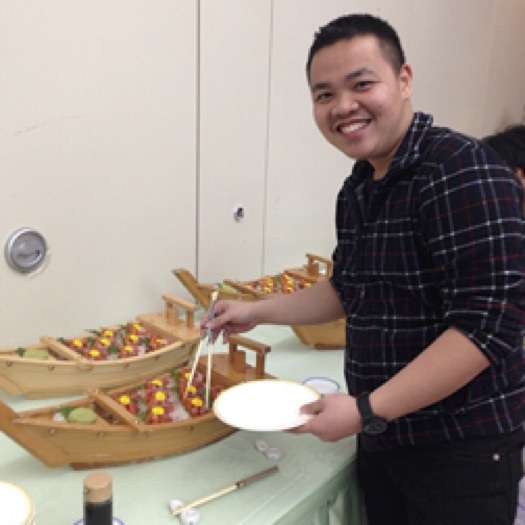 Our lab member Truong participated in this event representing Vietnam. 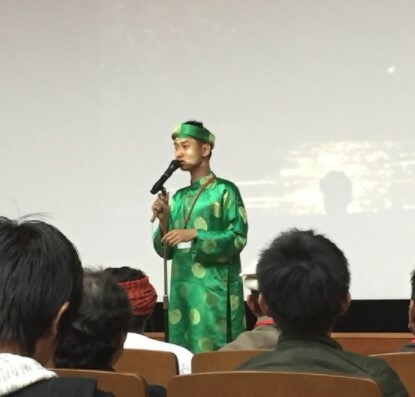 Through his impressive performance of beatbox, audiences were introduced to the buzzing life of modern life in Vietnam. The latter half of his performance-- The Jungle Adventure is what separates his show from others, drop by at our lab to know more! 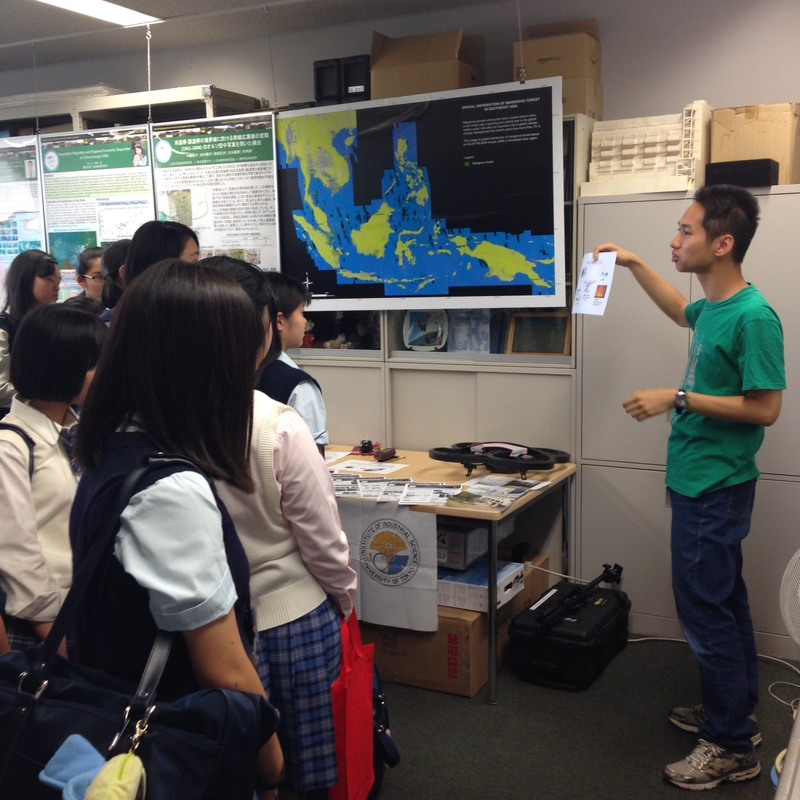 Around 40 school children from Nanao High School, Ishikawa prefecture paid a visit to IIS. 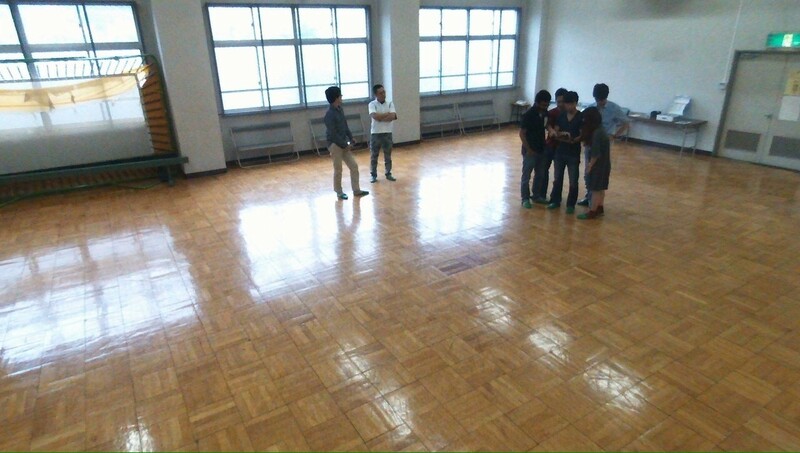 This was a part of their visit to several universities. 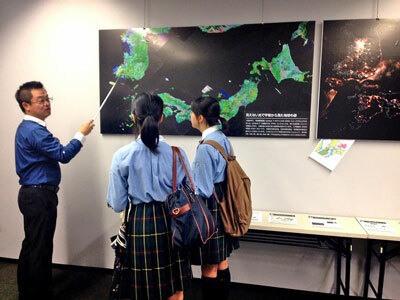 Takeuchi sensei explained about the use of remote sensing and GIS to the society. He also discussed what other labs in IIS are doing, through a video. 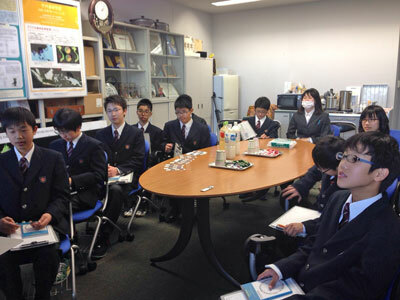 Ms Seina inspired the students by talking about Todai life and her own personal journey. Mr. Arthur also encouraged the students along similar lines. The day ended with a group picture. P.S. 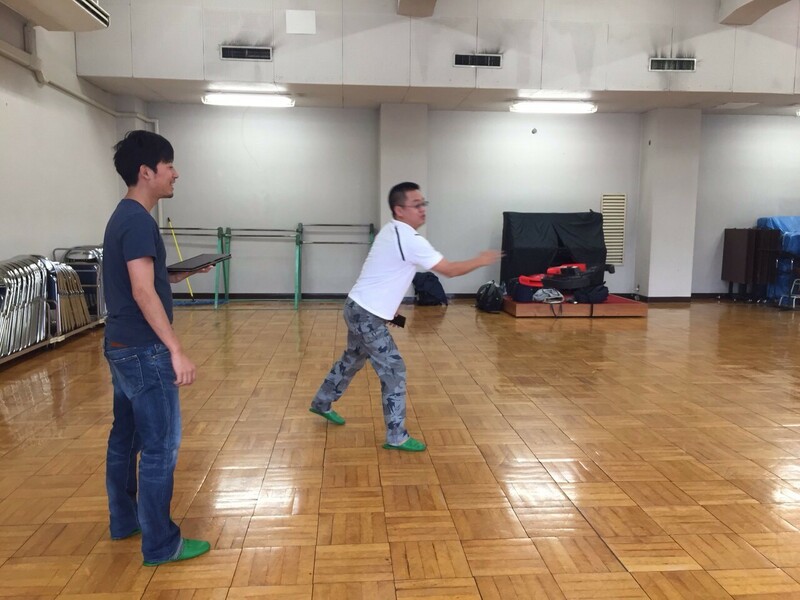 Takeuchi sensei also studied at the same school during his childhood days. 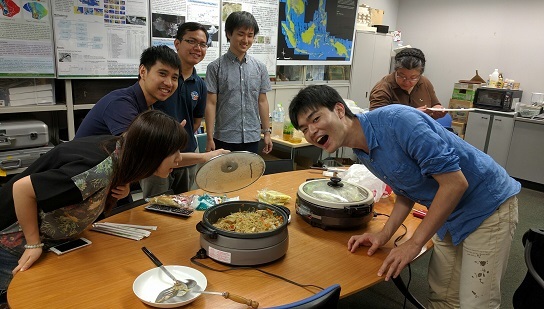 Takeuchi Lab had the farewell party for Doctoral student – Tanakorn Sritarapipat and two Master students – Nuntikorn Kitratporn and Arliandy P. Arbad. 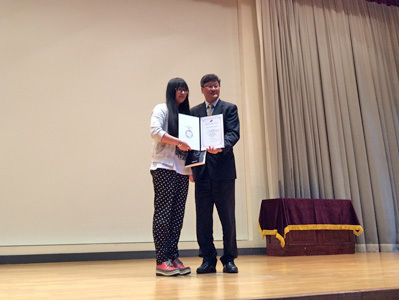 In Tanakorn’s speech, he sent an impressive message to other students “Do not give up and keep fighting, you will be paid. 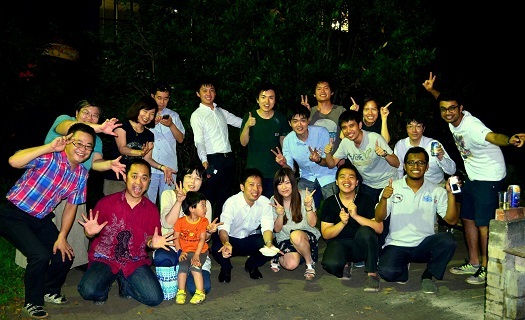 Sensei and other lab-mates always support you!” Such an evening for memories and friendship!!! 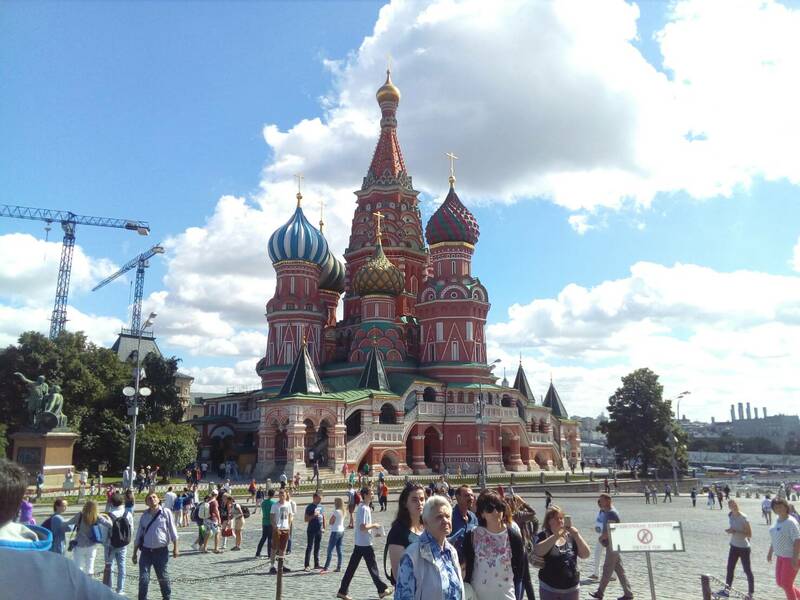 Sep 3th to Sep 9th, Seina's visit to Vladivostok, joining student forum. 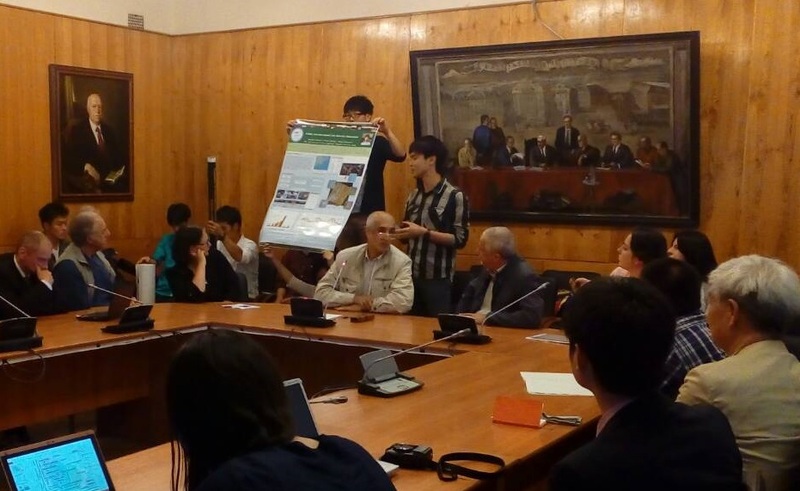 I have visited Vladivostok from 3rd Sep to 9th Sep to join a student symposium. 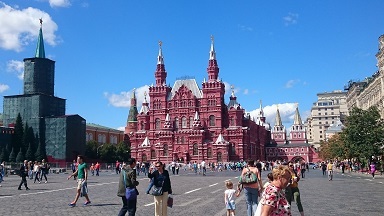 Prime Minister Abe and President Putin had a Japan-Russia Summit Meeting last year (2016 May), and they agreed on improving 8 areas to benefit both countries. 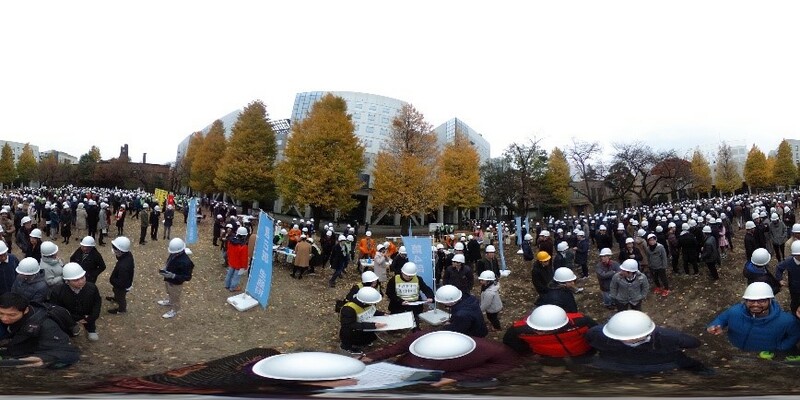 One of the 8 agreement, it says, "Fundamentally expansion of people- to people interaction". 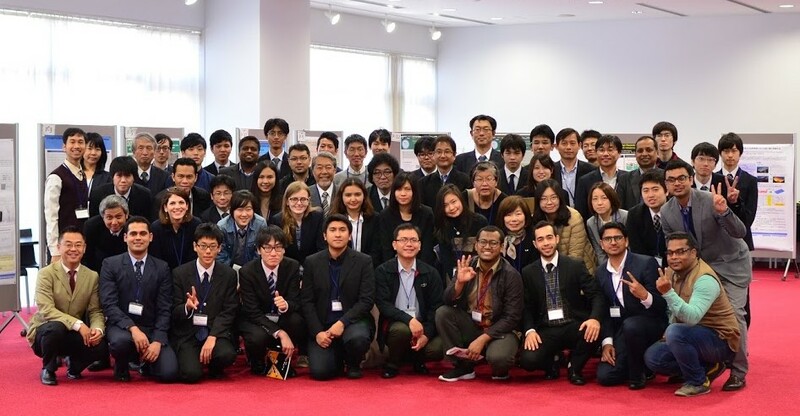 This student symposium was held for the first time to realize the 8th topic by encouraging university students to interact with each other. 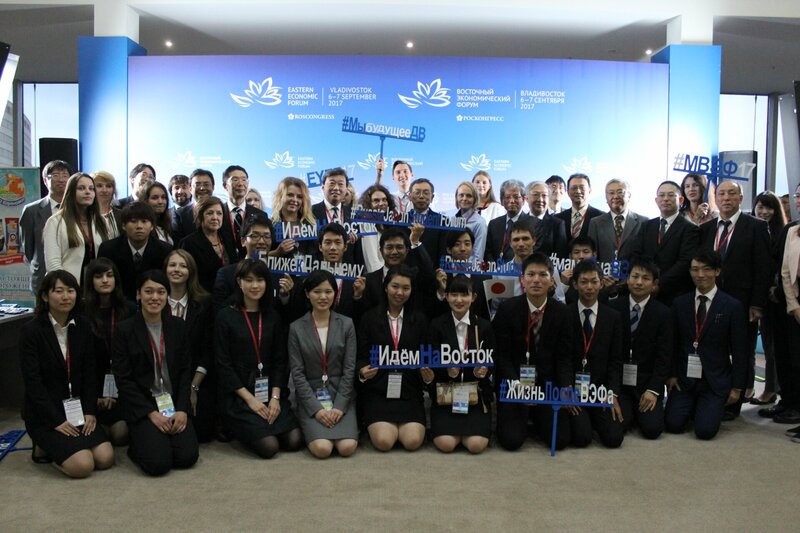 26 students from Japan and Russia have joined the forum and discussed about Japan-Russia relationship and how we can improve our relation in the future. In addition to the discussion, we had cultural activity including visiting summer camp site and historical museum of war etc. 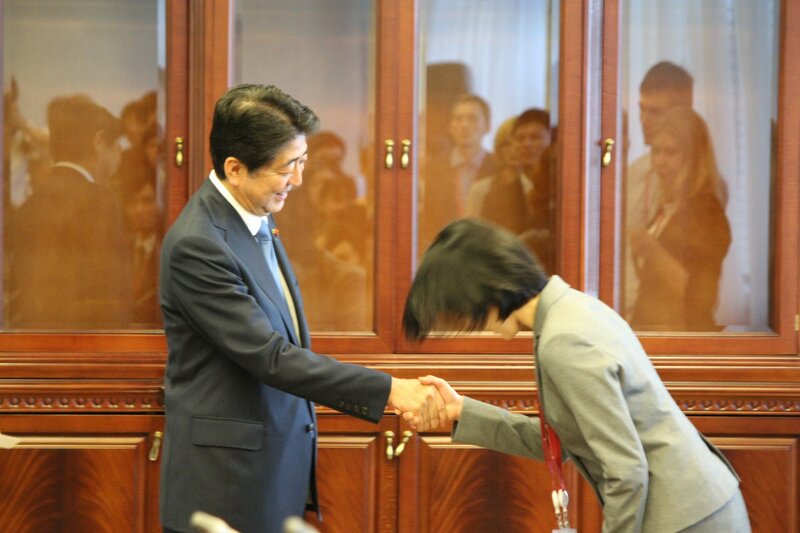 We also had a chance to audience Prime Minister Abe and President Putin during the forum, and also had a small chat with well- known Judo player Yasuhiro Yamashita. This experience was such an insightful event for me that it definitely changed my life to some extent for sure. Witnessing the scene of politics move and being fitted in for a project which was directly decided by leaders made me to feel more engaged in about the movements of the society, of the world, and I realized I have to be more aware of me being a responsible person who might be able to change the world. 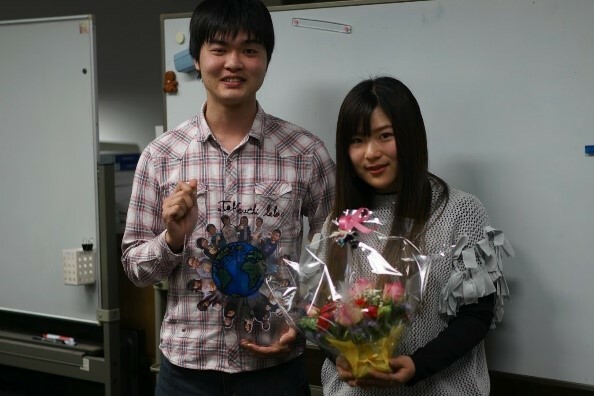 I've been always wanted to change the world a better place to live in and make Japan a better country, but it was always a big dream without any realistic feeling of achieving it. But now I am aware that I need to think of it as my realistic dream, otherwise, it will end up just being a dream. 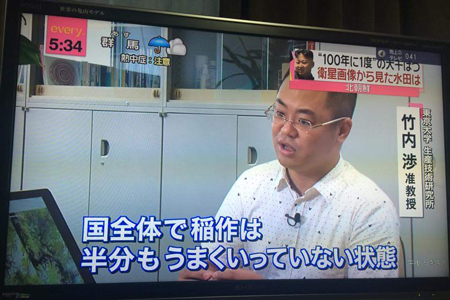 I know I cannot do anything big enough to change the world today or tomorrow, but having this perspective of making Japan a better country always in mind will surely help me to head towards the dream in the long run. 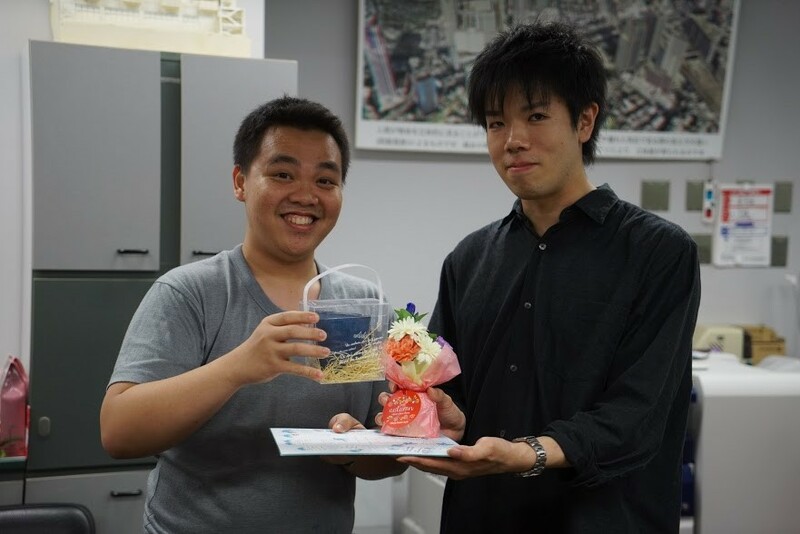 I really appreciate all the support of Takeuchi sensei even though it was just before the submission of ACRS, and all the support of core universities' professors and government side support and lab members and family member's support for letting me have this incredible experience. 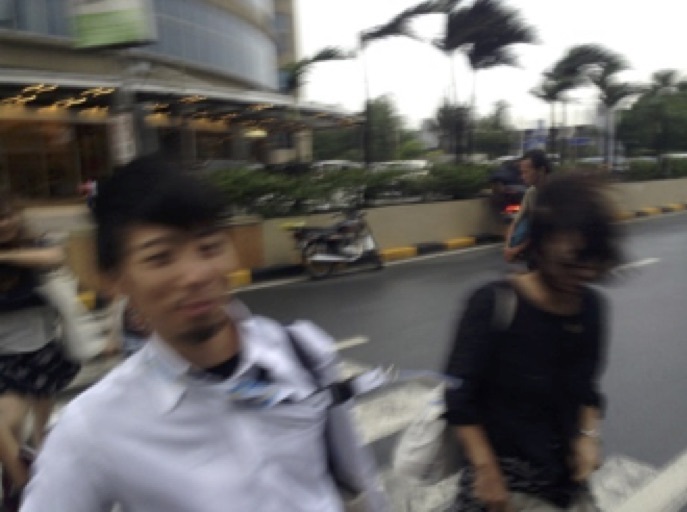 Kazuki Inoue’s visit to Yangon, Myanmar. 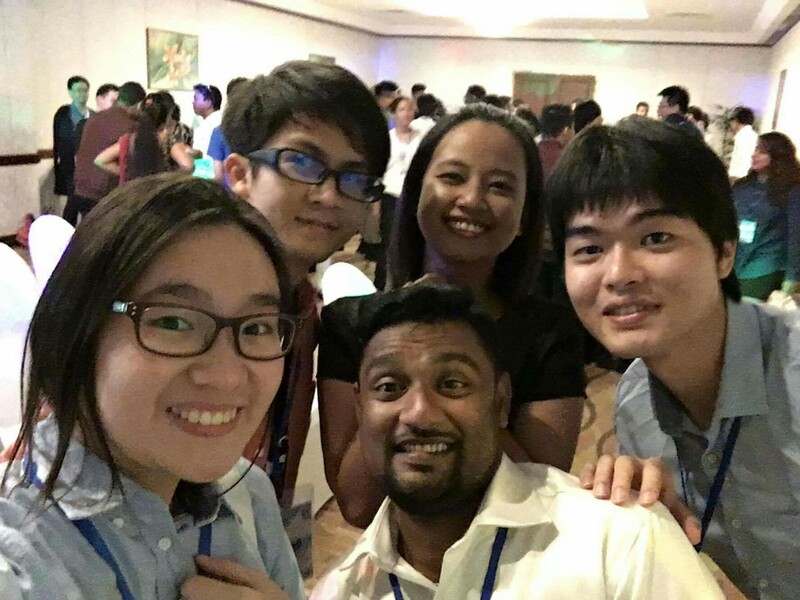 I studied in Myanmar for 15 days from August 19th to September 2nd with an overseas study abroad scholarship which UTokyo provides and aims to encourage students to deepen their international understanding and to contribute to nurturing human resources who act on the world stage. I am currently studying the railway condition monitoring using the portable device for Myanma Railways (MR). 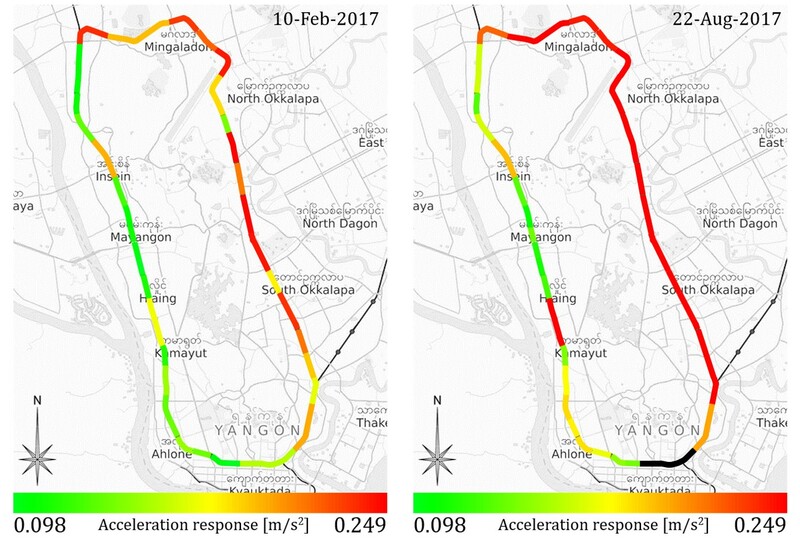 When conducting the first field survey in February 2017, we measured the acceleration of the car body using a smart phone based accelerometer for the Yangon Circular Railway Line (YCR). This time is second visit to Yangon for me. 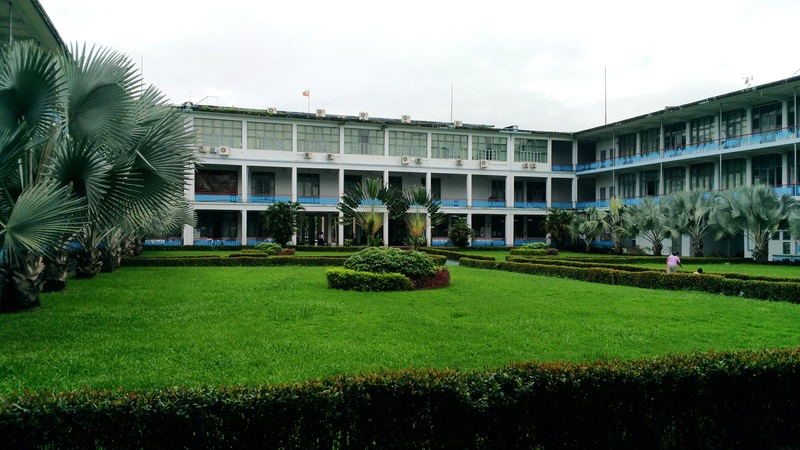 During the first half of the week, I stayed in Yangon city, joined a discussion with students at Yangon Technological University (YTU) and conducted a field survey of the YCR Train. 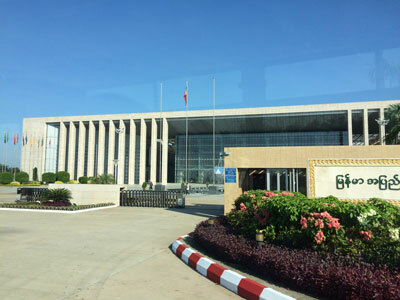 In the latter half of the week, we took an express train to Mandalay station approximately 550 km from Yangon station to measure the train acceleration for the intercity railway. 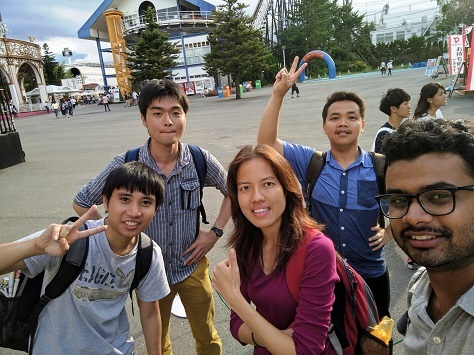 Also, fortunately, I got the opportunity to talk with the professor at Mandalay Technological University. I got an explanation from an expert about the difference of traffic situation among cities in Myanmar and the current situation of MR. YCR timetable in Burmese. I don’t understand but MR staff kindly explained me. The YCR is currently being implemented with technical assistance by the JICA expert team and an improvement plan with ODA loan. Currently operated at a speed of about 20 km / h, the MR improves it to about 40 km / h, and increases the operation interval at commuting rush hour from about 2 per hour to about 5. At that time, more advanced and precise maintenance is required, but at present there are 600 derailment accidents per year on all railway lines operated by MR. Based on these backgrounds, we conduct field surveys as research subjects to conduct efficient railway condition monitoring using simple measuring equipment and satellite images, and conduct analysis. 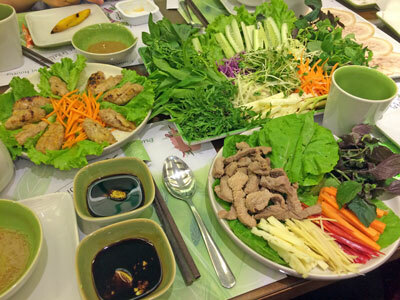 While staying in Yangon, I stayed at YTU 's guest house. In Yangon, blackouts occurred frequently. There was a power outage of several hours once every two days. In the night darkness, I stayed in the room while relying on the lights of the smart phone. 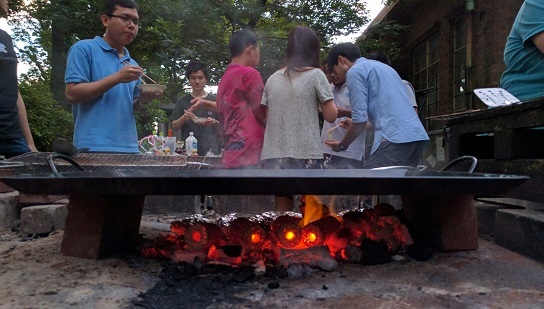 As I was born and raised in Japan, I have never experienced a blackout, so these new experiences broke my conventional sense and trained me. I learned that "I should do while I can." I am sincerely thankful to YTU members who helped me during my stay and my university and laboratory who gave me valuable opportunities. 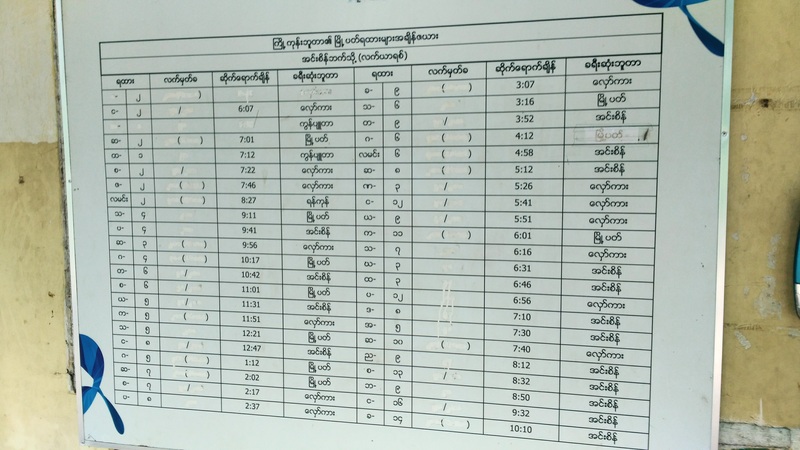 YCR timetable in Burmese. I don’t understand but MR staff kindly explained me. The car-body vertical acceleration response mapping I estimated (Left: February 2017; Right: August 2017). The eastern section tends to have greater acceleration than the west section. 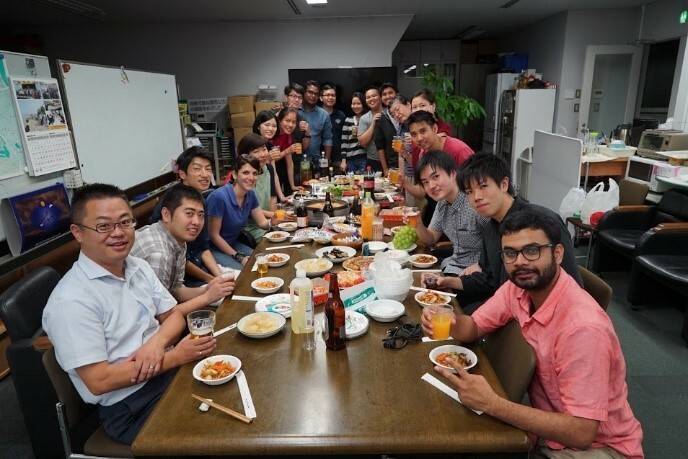 Global Leader program for Social Design and Management (GSDM) and the Graduate Program for Mechanical Systems Innovation (GMSI) at The University of Tokyo (UT) held a collaborative program on July 28 to Monday, July 31, 2017 by gathering together 67 PhD students from 23 universities such as Berkeley, MIT, Colombia, Cambridge, Oxford and …. 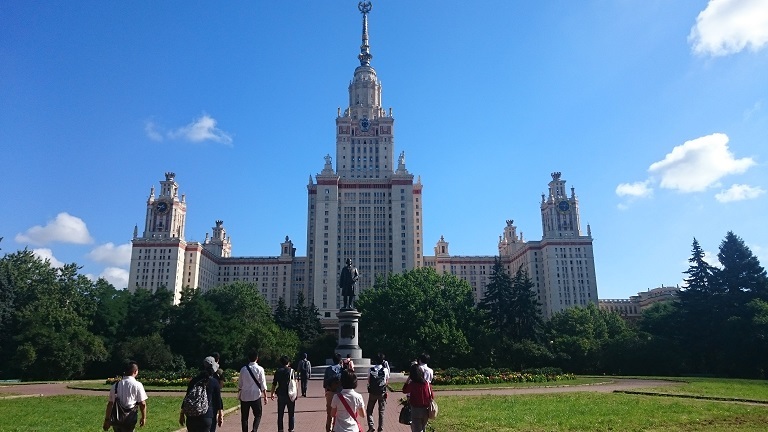 the program aimed to widen the research perspective of the participants and facilitate international communication by developing international networks among young researchers. 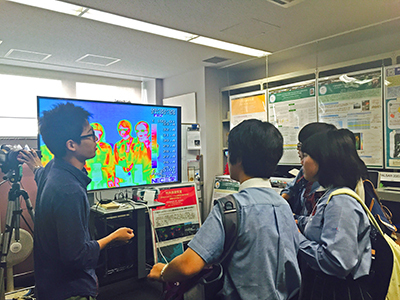 In the first day of the program all student had a chance to visit different laboratories in UTokyo based on their interest in the evening of the same they all the members were moved to the program site in Saitama, to help everyone to get to know each other, there was a ‘Self-introduction Session’ and a ‘Technical Session’. 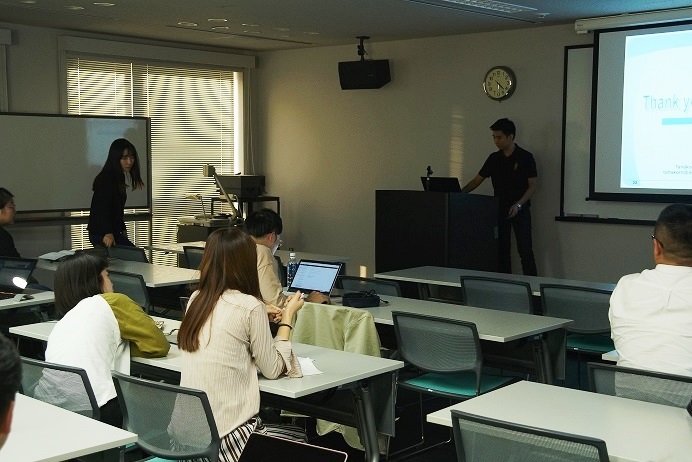 Everyone was requested to introduce himself/herself in a 1-minute presentation and research in a 5-minute presentation. 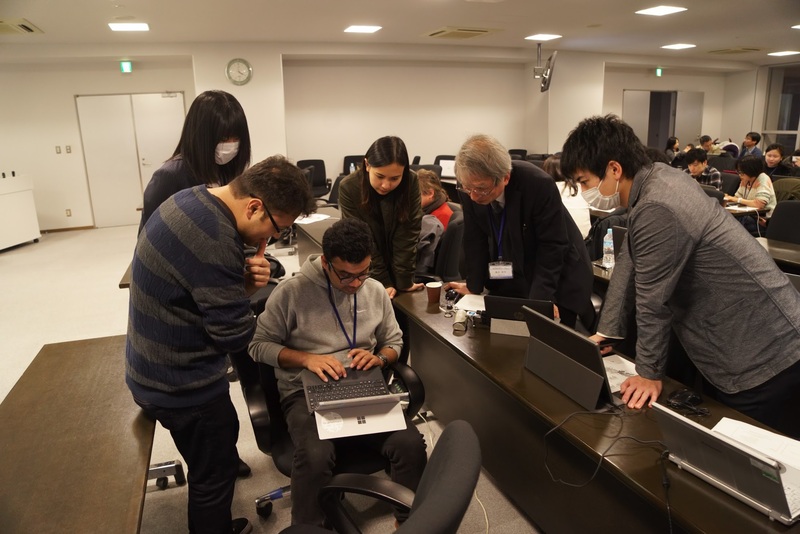 In the second day of the program, all the members were divided into different teams where all teams were asked to prepare a project plan for a new device based on what japan society needs within 24 hours. The mentioned device should be based on the different criteria and capable to build and develop with specific limited budget. In the project plan, all national and international collaborations needed to be clearly mentioned, also each team member asked to have contribution based on their specialties. In the third day of program, all the teams were asked to present their devices with in 10 mins in fort of committees to evaluate their project in terms of reliability, budget managements and other different criteria. 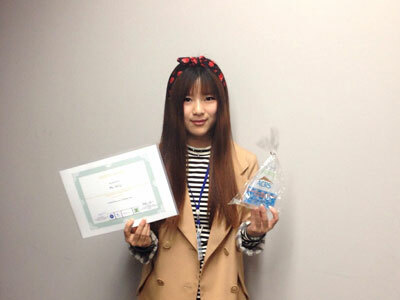 In the evening parts the best proposal got the award and each team received comments from the committees. 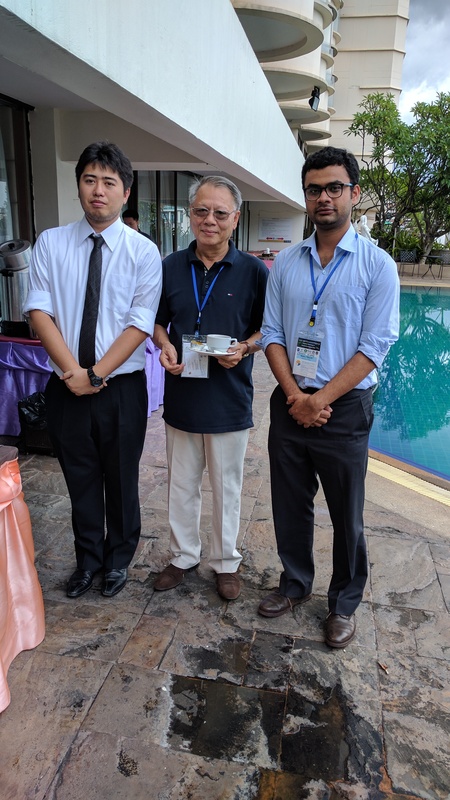 On 17-19 Dr Hironori Arai and Mr Prakhar Misra attended the ‘LCLUC SARI International Regional Science Meeting in South/Southeast Asia’ at ChiangMai, Thailand (http://lcluc.umd.edu/meetings/lcluc-sari-international-regional-science-meeting-southsoutheast-asia). 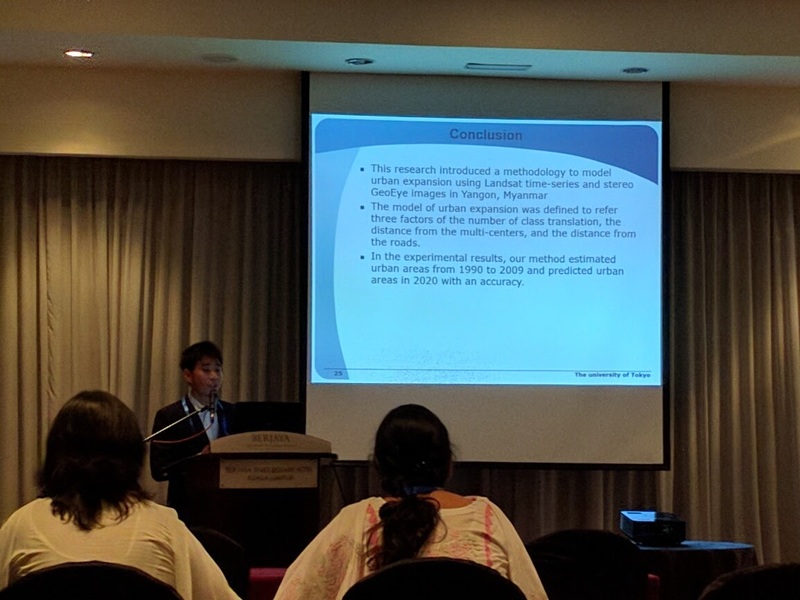 Mr Prakhar Misra presented some of the work from his PhD research titled “Impact Assessment of socio-economic development on urban air quality in Indian megacities” while Dr. Arai presented about his latest research work on “A multidisciplinary approach of the global warming potential evaluation on the Mekong delta”. Both received several comments and directions for future steps. 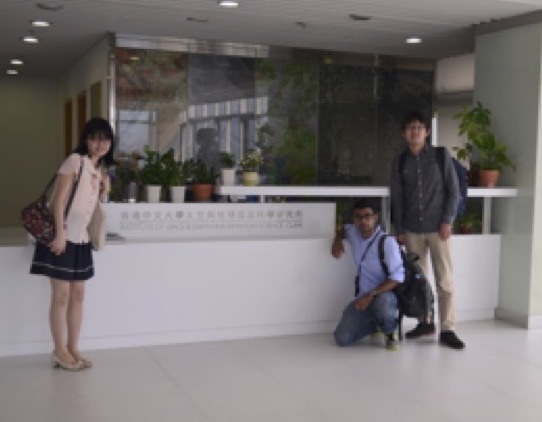 There were several opportunities to interact with eminent researchers working in the field of LCLUC and emissions. 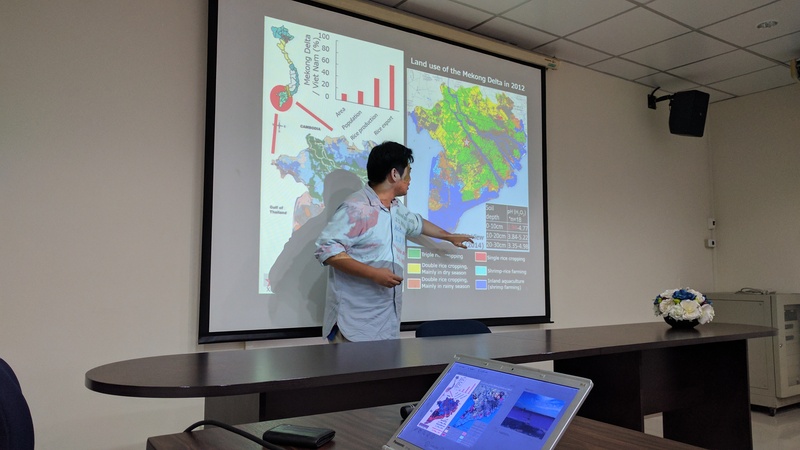 There were several discussions regarding involving socioeconomic data at different scales to interpret and better leverage results from remote sensing. Another stress was on growing need of more complex emission models to accurately represent emissions. Armed with this experience, overall the meeting provided several points to work upon and further enhance research for the society. 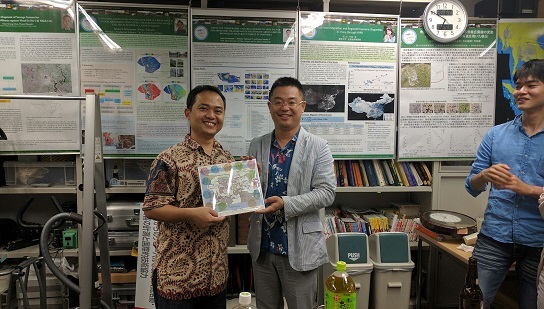 After attending the meeting, Dr Arai and Mr Misra also visited Geoinformatics Center IC Asian Institute of Technology, Bangkok (http://www.geoinfo.ait.asia/). 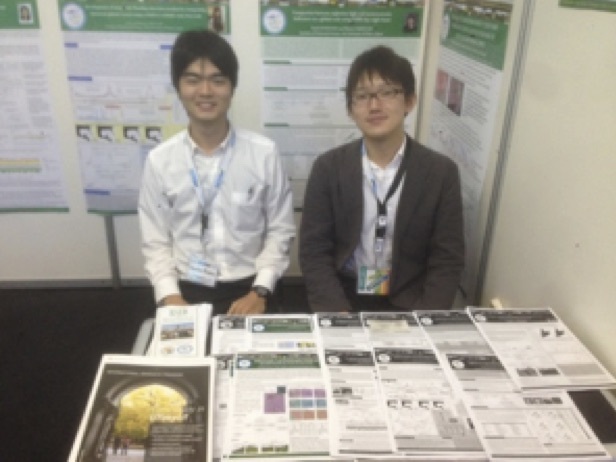 They presented their research and discussed it with researchers from GIC. 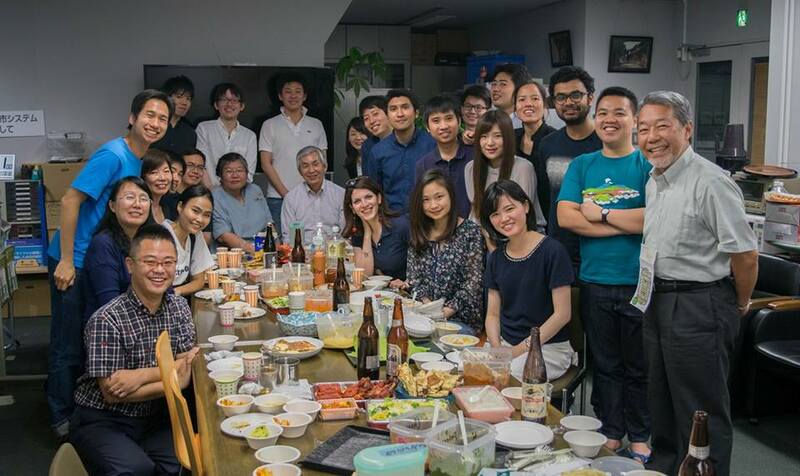 The PhD Student Live 2017 which has been held on 10th July 2017. 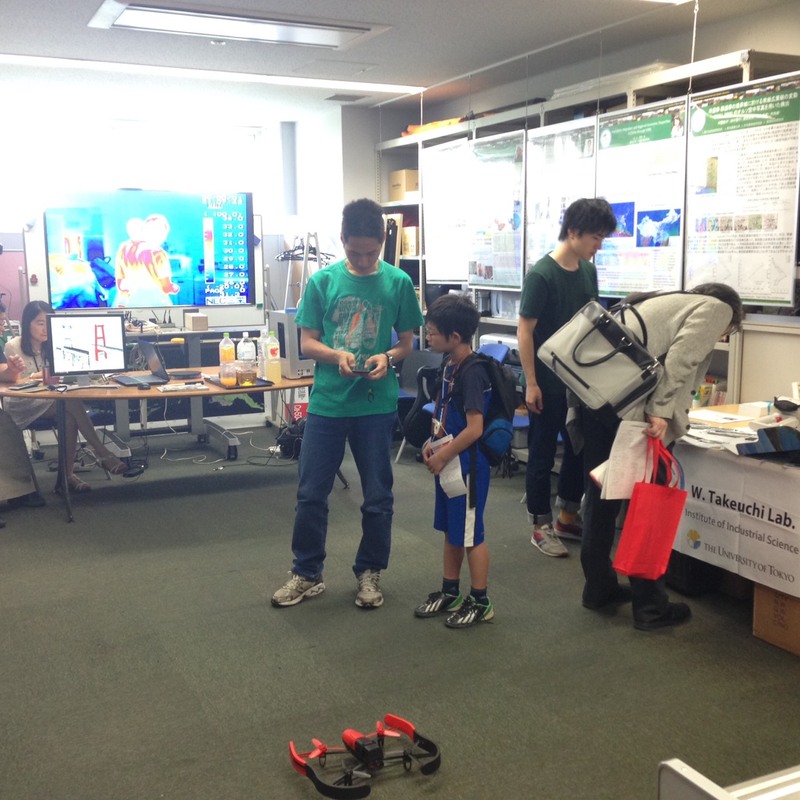 This annual event was held at Convention Hall, Komaba campus, Institute of Industrial Science, The University of Tokyo. This is the precious opportunity to know the research achievements of the 2nd year doctoral student. 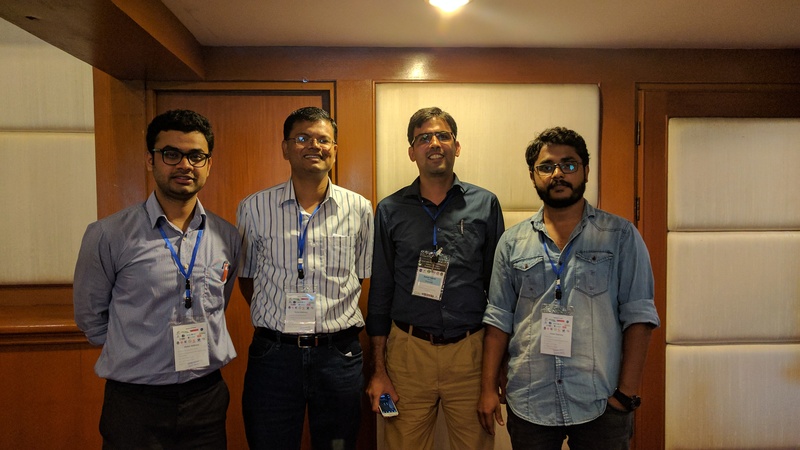 Our lab member, Prakhar (D3), Anjar (D2), and Ark (D2) were contributed to give either oral and poster presentation. 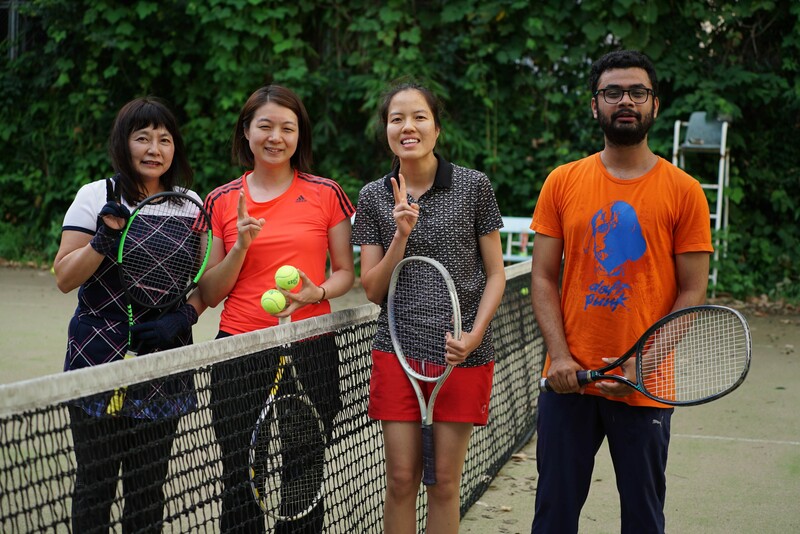 The IIS Tennis tournament 2017 was held on Thursday, 6th July 2017 in Komaba Campus, The University of Tokyo. 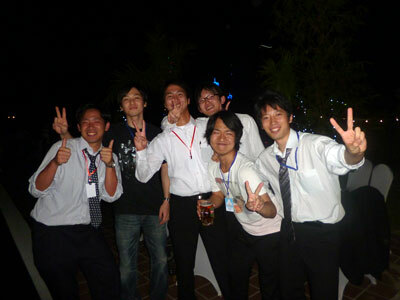 There are many students and staffs join this annual event. 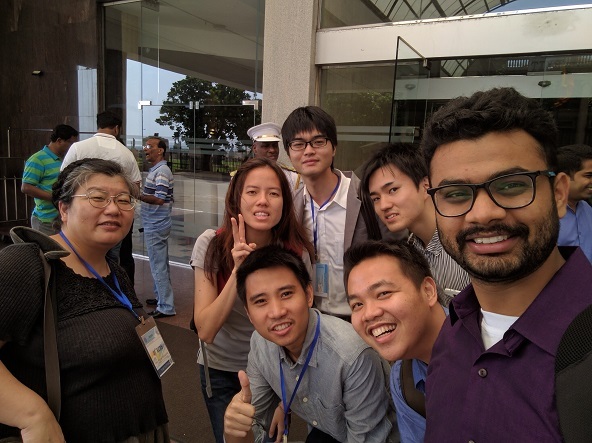 Tita (M2), Tashiro (M1), and Prakhar (D3), have participated as representative our lab. 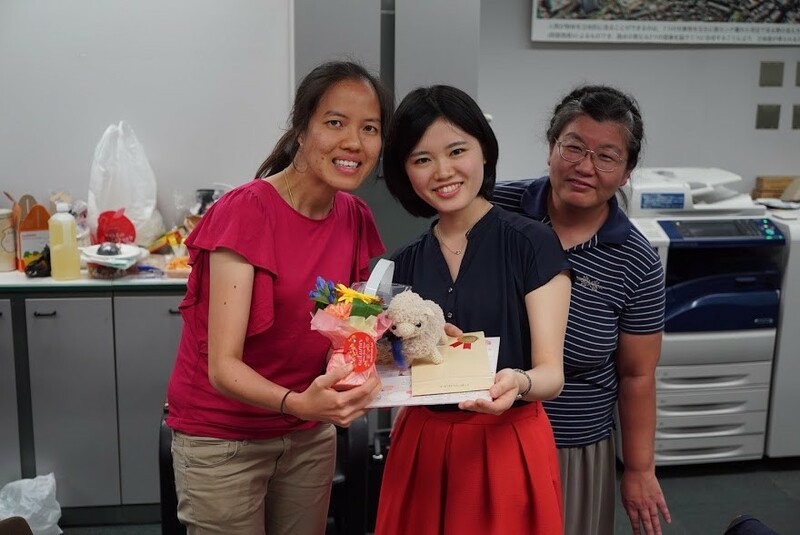 Heartiest welcome to Prof. Xiangming Xiao from the University of Oklahoma. 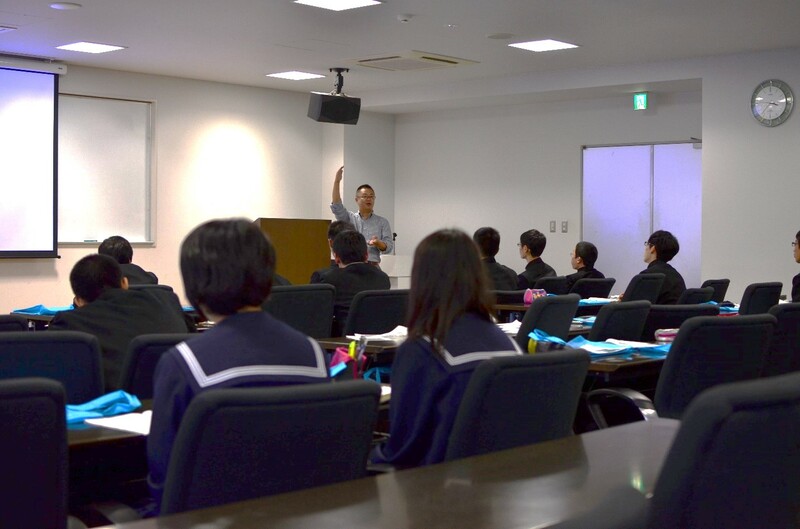 Each participant received his encouraging and/or constructive comment(s) through his/her presentation. 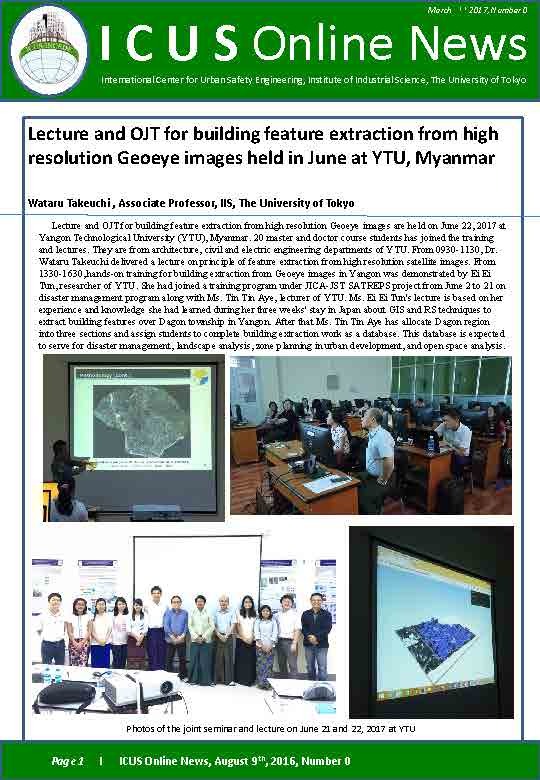 Takeuchi-sensei gave a lecture for building feature extraction from high resolution Geoeye images on Yangon Technological University. 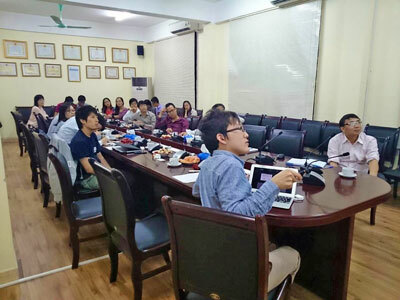 Simultaneously, related training were held with 20 master and doctor course students. 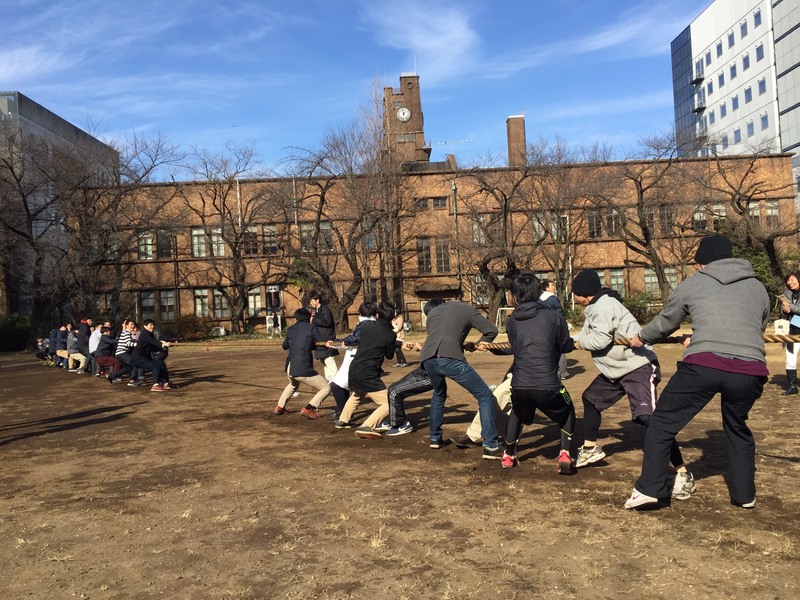 Open campus 2017! 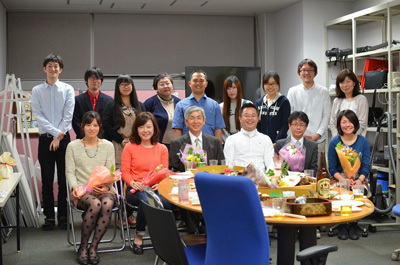 We spent a wondeful moment with our grand father(Prof. Sawada-sensei), great-grand father (Prof. Yasuoka-sensei) and OB/OGs. 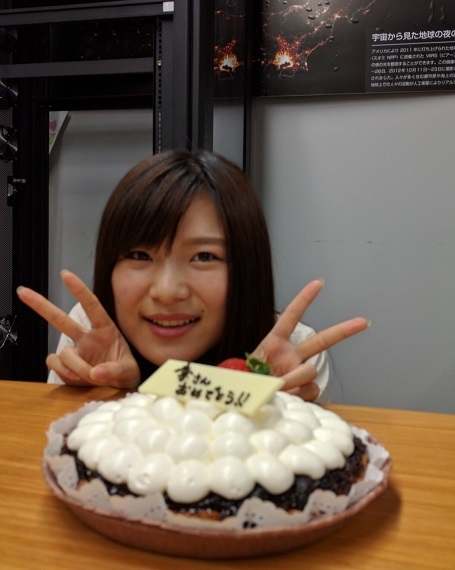 Uchida-san's kind guidance to future-scientists. 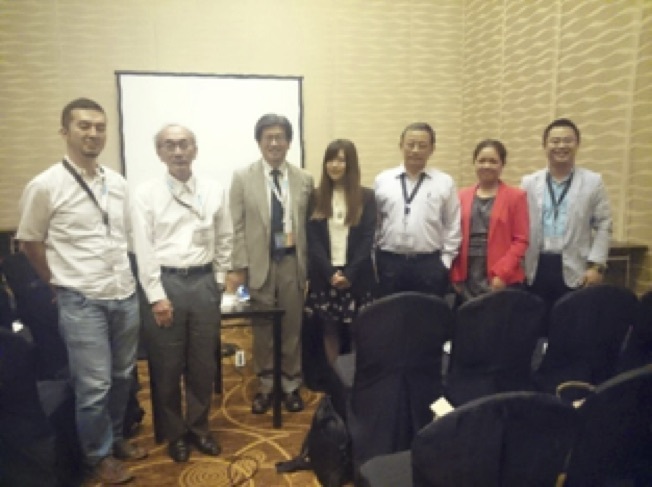 We attended International Symposium on Remote Sensing 2017@Nagoya. 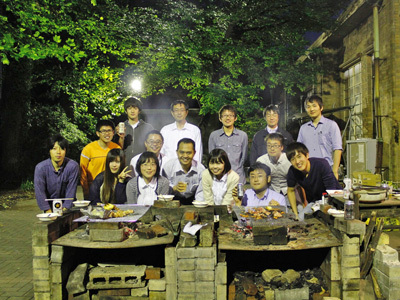 All our lab members paper were highly evaluated here. 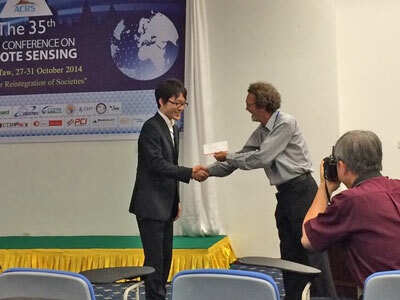 Congraturation on Arbad-san's winning of the best paper award! 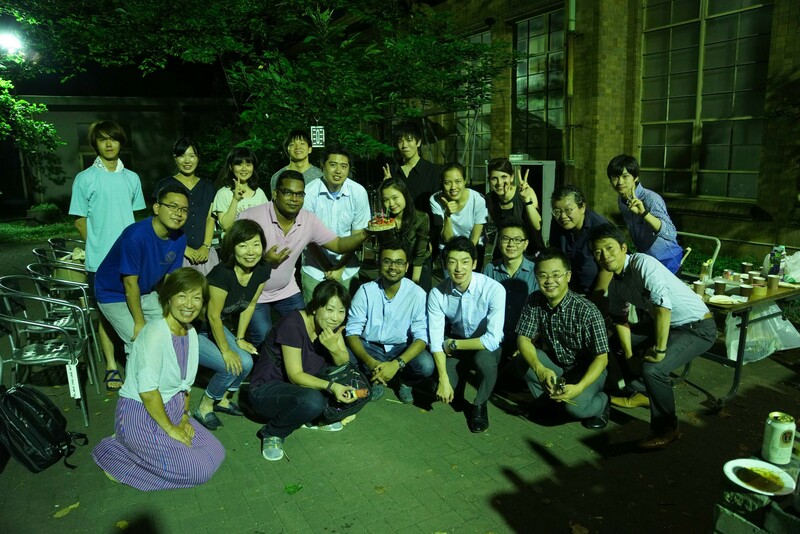 Thank you Prakhar-san for your excellent coorination of the joyful young scientists' party! 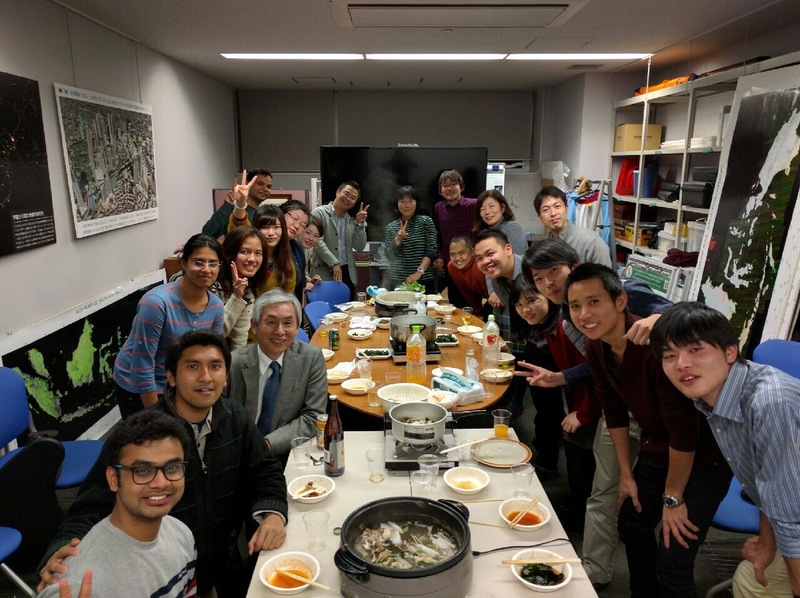 Our lab’s farewell party for Li-san and Mizutani-san was held in the new lab room (Bw-603) on 30 March 2017. 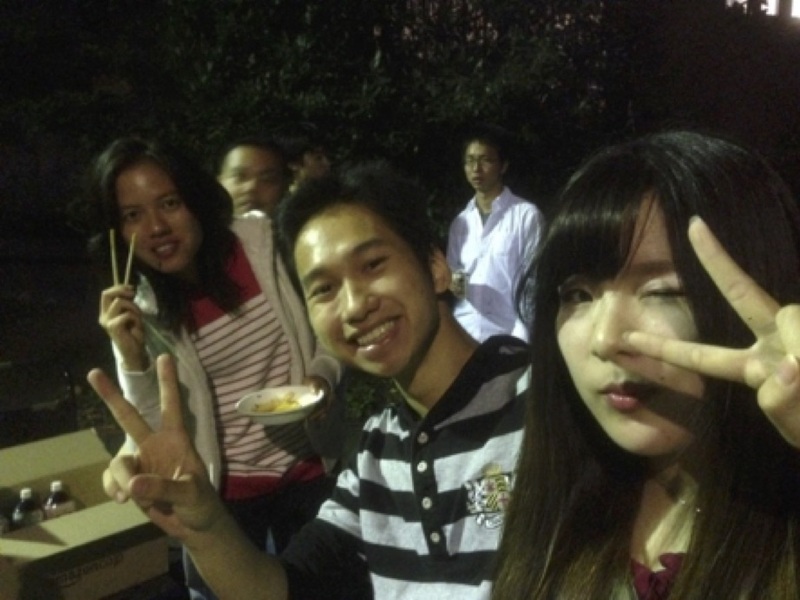 During the party, we had very delicious Nepalese foods with various kinds of curry and naan bread. 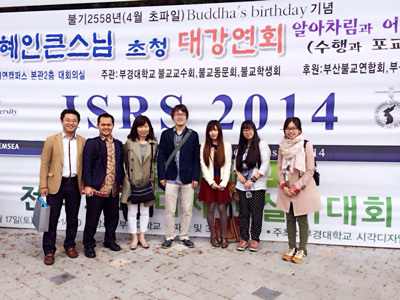 The IIS Forum which has been held annually marked its twenty-fifth year on March 2 – 3, 2017. 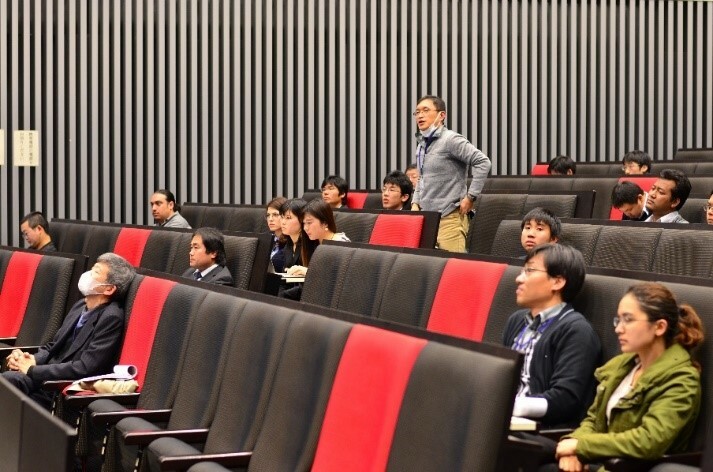 The forum was held at Convention Hall, Komaba research campus, The University of Tokyo. 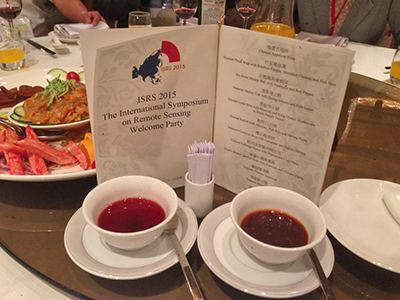 The theme of this 25th IIS forum was "Earth Observation, Disaster Monitoring and Risk Assessment From Space". 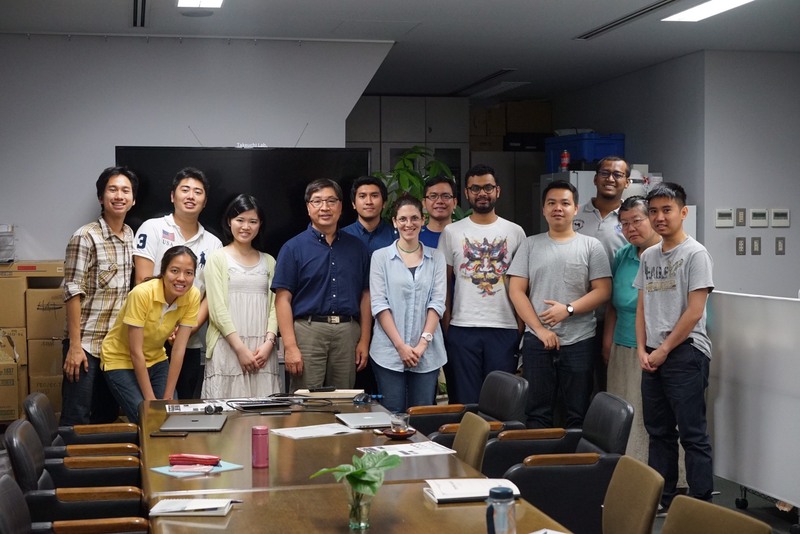 Various researchers attended this event with about 18 participants involved in oral presentation session, and 36 participants took part in student poster session. 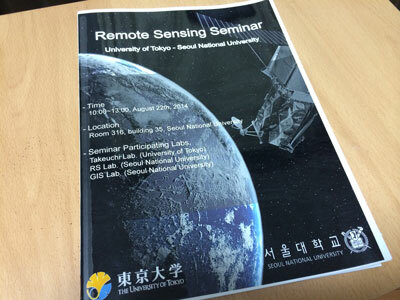 This event gave remote sensing researchers a valuable opportunity to interact with each other directly. 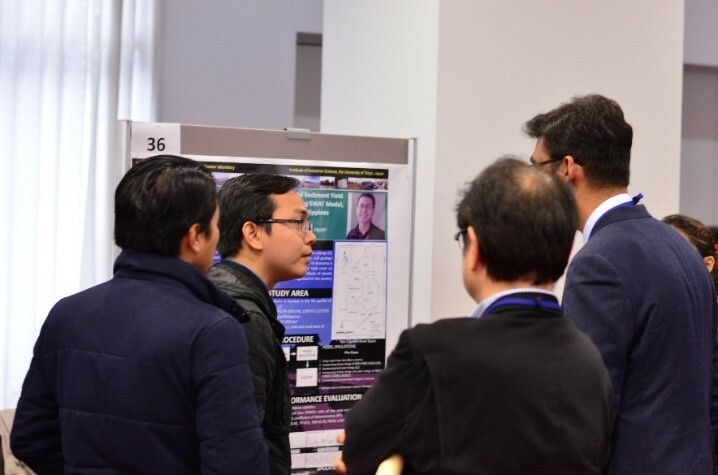 In the poster session, each participant was given the opportunity to introduce their research to all participant. 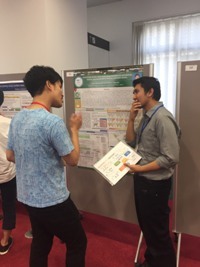 Then the presentation was followed by a small discussion in front of each poster. 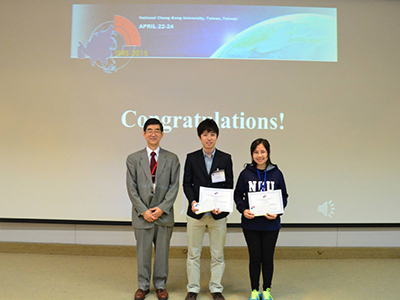 Through the voting system, Fujiwara Takumi and Mario Rodriguez selected as the best student poster award. 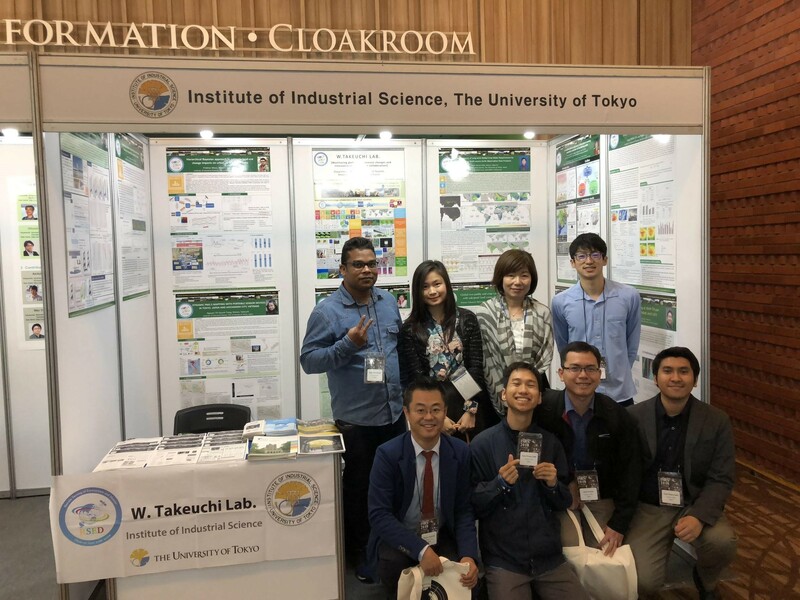 Takeuchi laboratory as the executor of this forum gladly giving thanks to all participate who made this IIS forum 2017 conducted well. We are waiting for your active participation in next IIS forum. 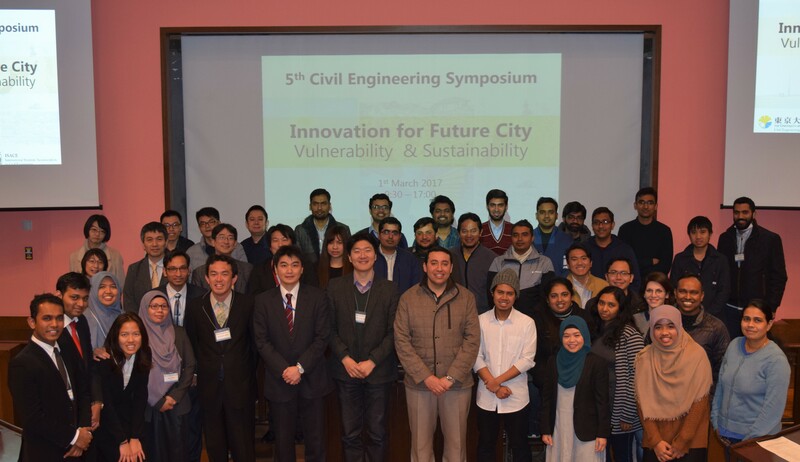 Takeuchi Lab members attended the 5th Civil Engineering Symposium titled “Innovation for Future City: Vulnerability and Sustainability” which was held annually by International Student Association in Civil Engineering and Foreign Student Office at the University of Tokyo. 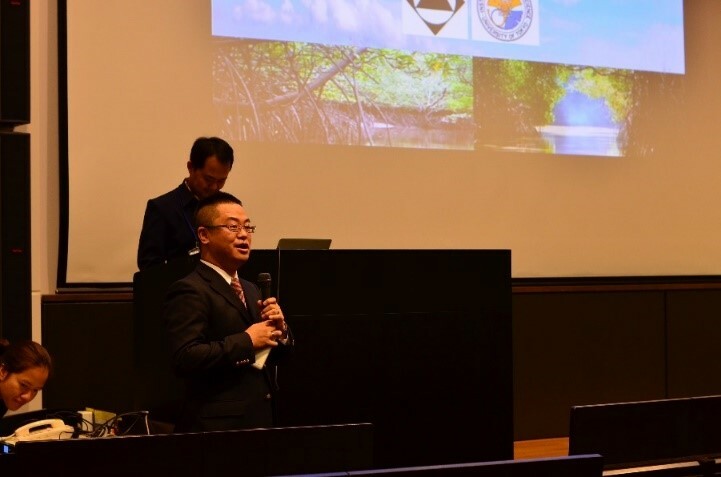 The symposium addressed inter-disciplinary topics and offered a look into cutting-edge researches from our own faculty, as well as government and private company. 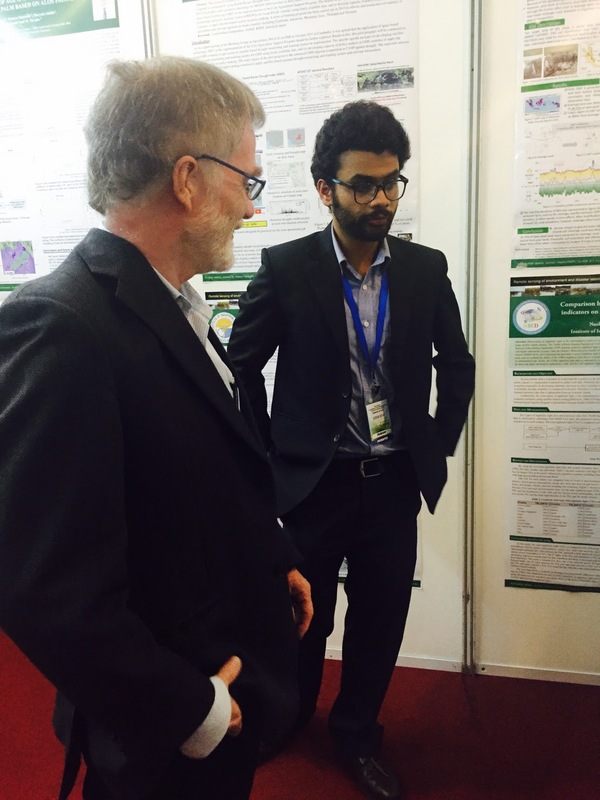 Mr. Prakhar, our D2 student, also participated in the student presentation. 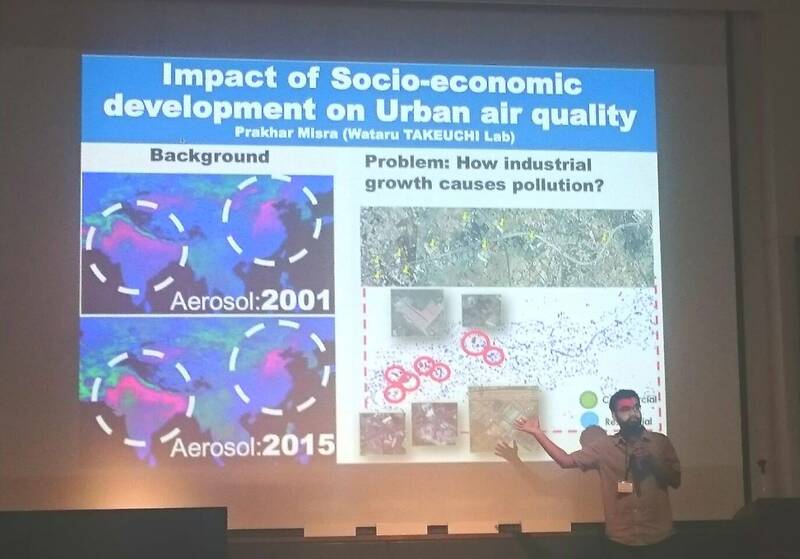 He delivered an overview of his on-going research on the application of remote sensing for air quality in India. Mr. Prakhar delivered an overview of his on-going research. 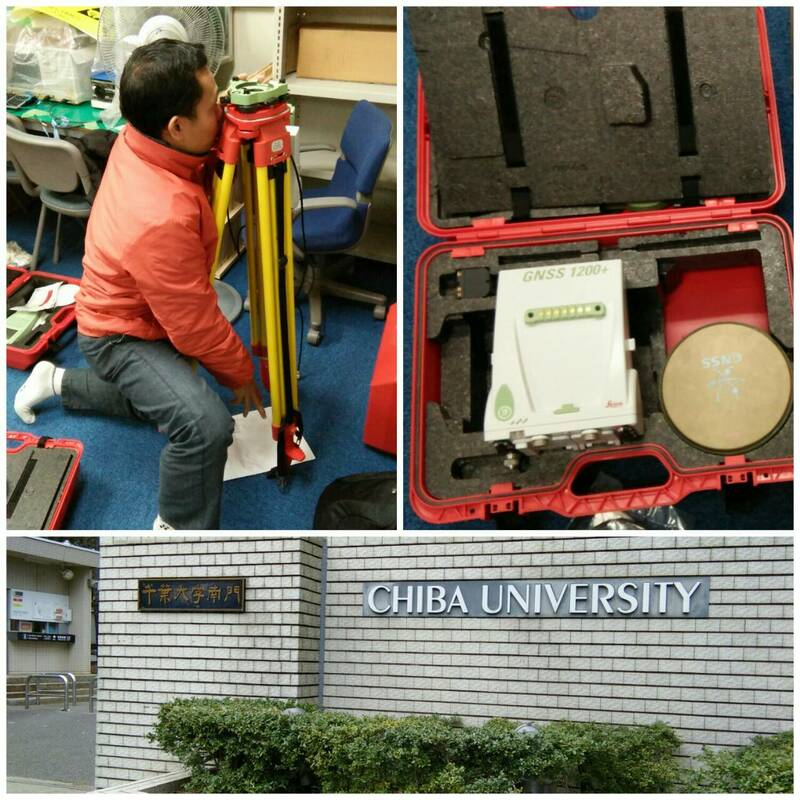 Mr.Arif and JMRSL member were preparing GPS equipment. Member of JMRSL was trying how to use tripod for GPS antenna stands. 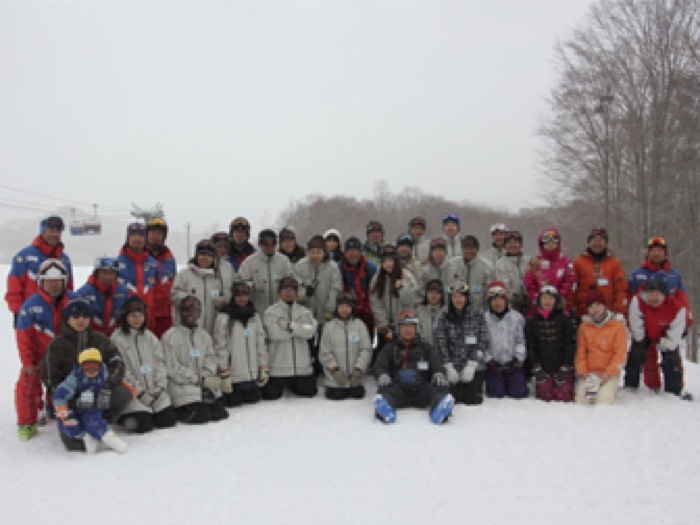 On February 19th and 20th ,during the winter break, our laboratory with accompanied of Kuwano laboratory and Saitama University had a ski trip at Aizu Daikura ski resort in Fukushima Prefecture. 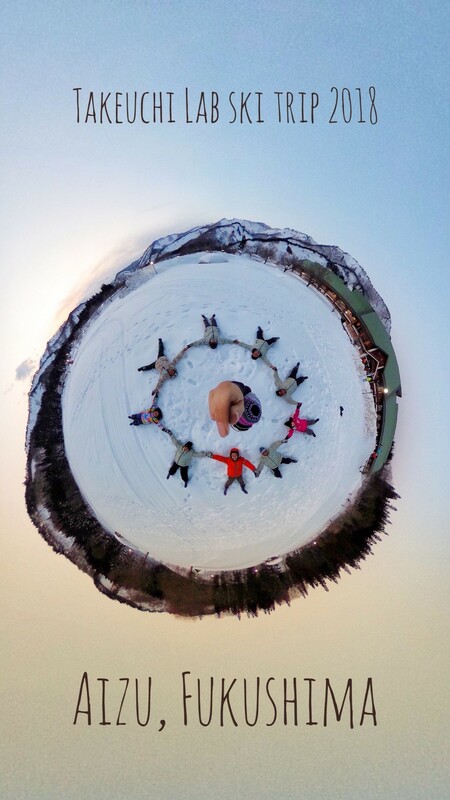 In the first day of trip some of the members toke ski training and in the afternoon instructors arranged some battle such as snowman making , snowball fighting and relaying with sleigh which our Laboratory group got the first prize of snowman battle. 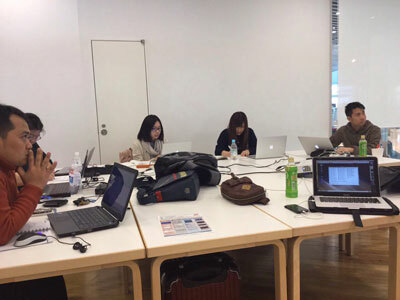 After arriving at the designated hotel, all members rested for a while in Japanese style hotel. 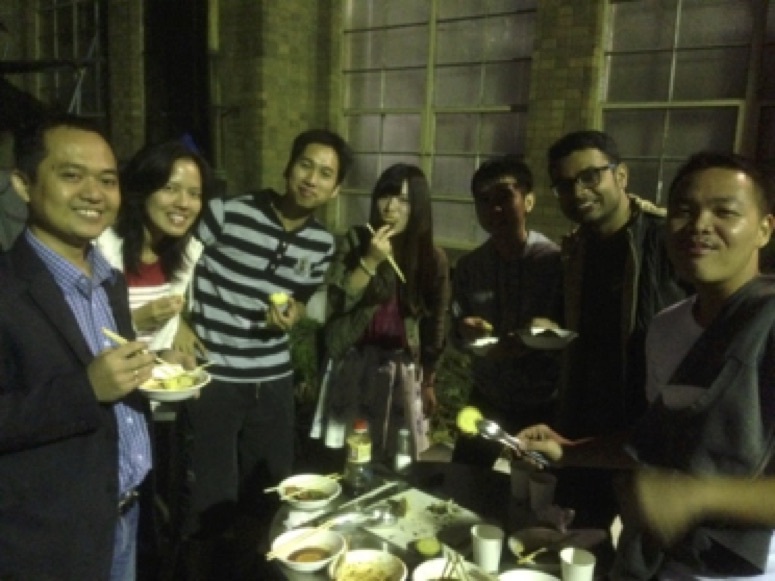 At the night all grouped received their battle prizes while enjoying from various Japanese food in the dinner. 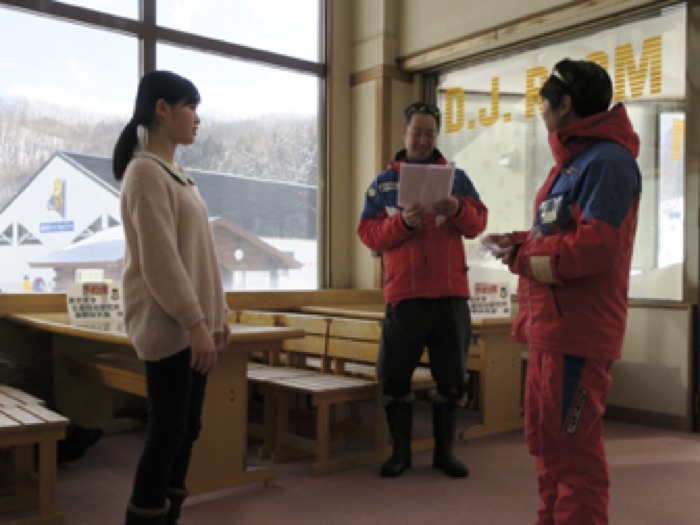 In the next morning, members had the training on making Japanese sweets in hotel and after having breakfast all members returned back to the ski resort place. 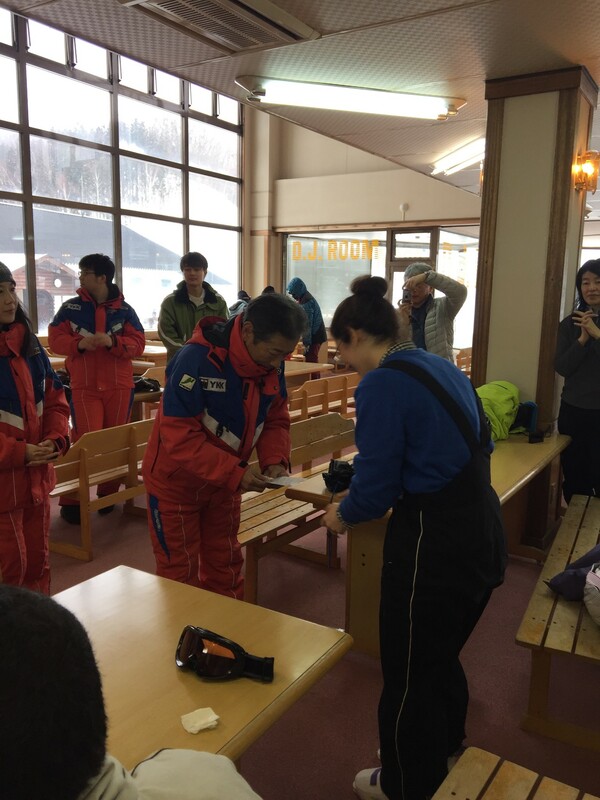 In the second day of ski training, instructors toke test from students and finally all the students received the international training certificate with respect of their performance and returned back to Tokyo with lots of pleasure memories. 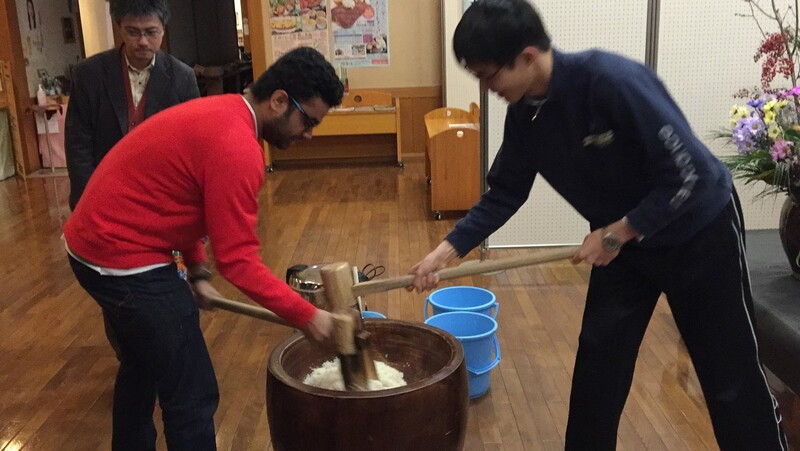 Prakhar san while trying to make Japanese sweet. 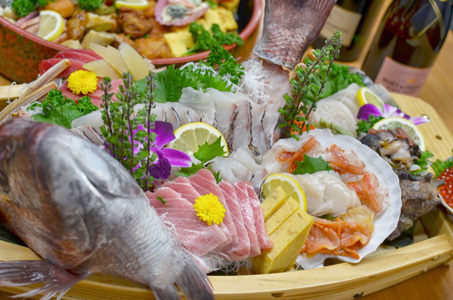 Japanese cuisine which was given in the night gathering. 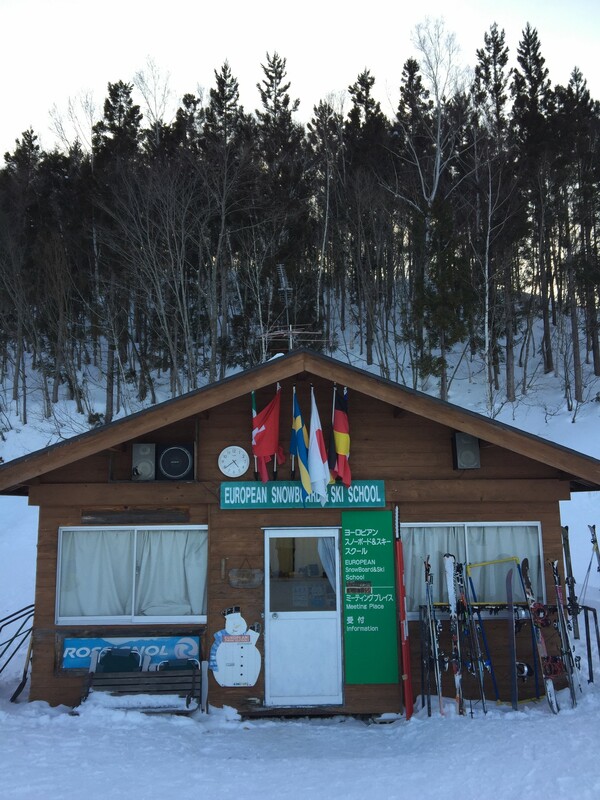 Ski school in the Aizu Daikura ski resort. Pegah san who got a prize in final ski test from the beginner group. The 2 videos below is a recap of a recent field survey at Twantay Bridge and Pathein Bridge in Myanmar with an aim to capture current stage of the bridge and reconstruct 3D information. The ultimate goal is to evaluate optimal solution of these technologies for bridge deformation inspection and monitoring of infrastructure. 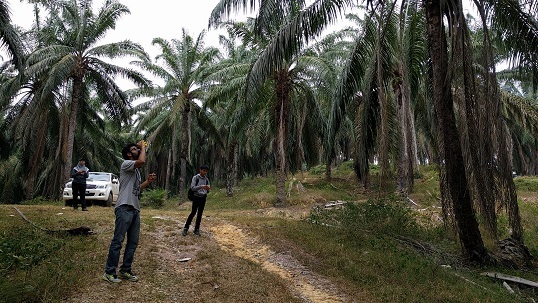 The survey was completed using Terrestrial Laser Scanner and different optical camera (DSLR camera, Wearable camera, and 360-degree camera). 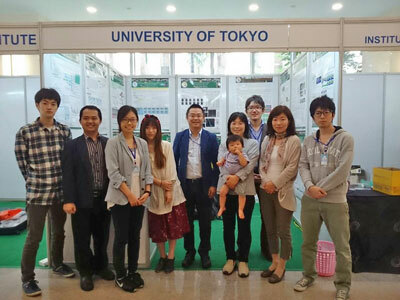 Visiting the exhibition of machine vision in Yokohama during 7-9 December 2016. 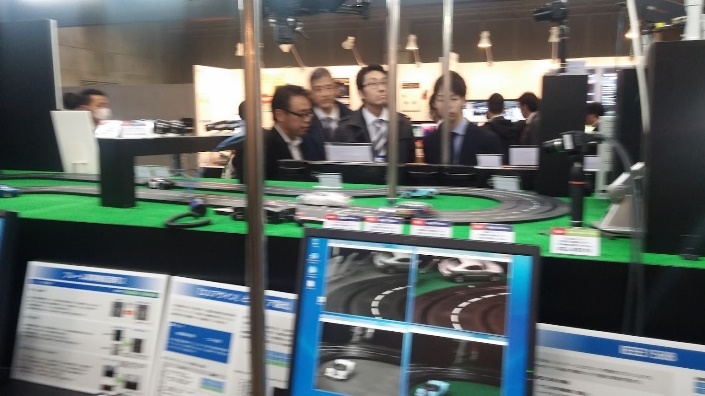 The exhibition of machine vision was held at Pacifico in Yokohama (Japan's second largest city) during 7-9 December 2016. 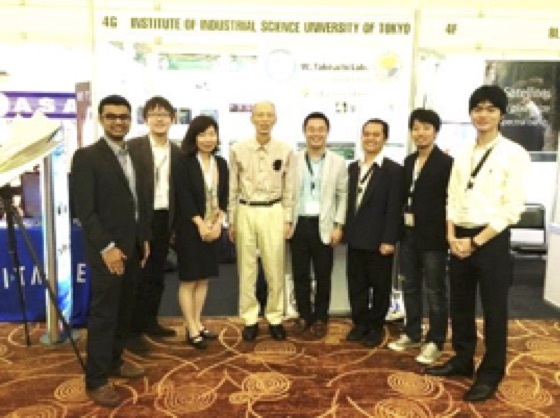 This event aims to display the current technology of machine vision including cameras, mechanical devices and digital image processing with the various applications for industrial fields. 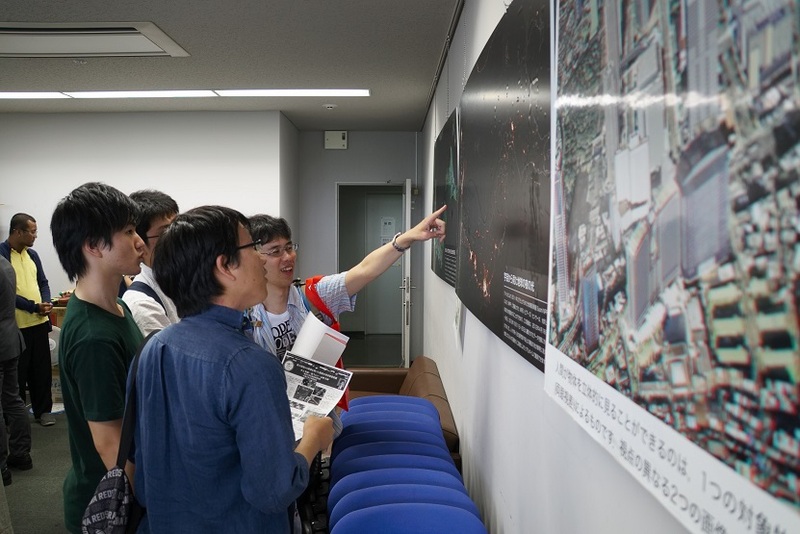 Many industrial staffs, researchers, professors, students and those who are interesting in camera technology were gathered in this exhibition for showing their works and seeing the other works. 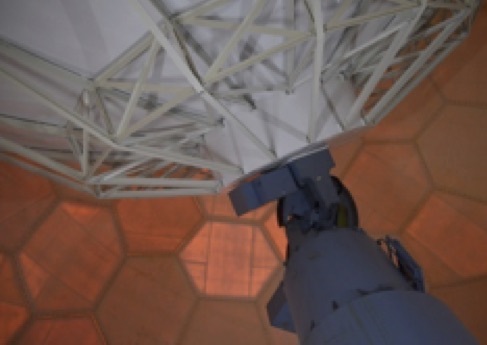 For the highlights of this exhibition, a very tiny camera can record in video mode with a high resolution of 4K pixels. 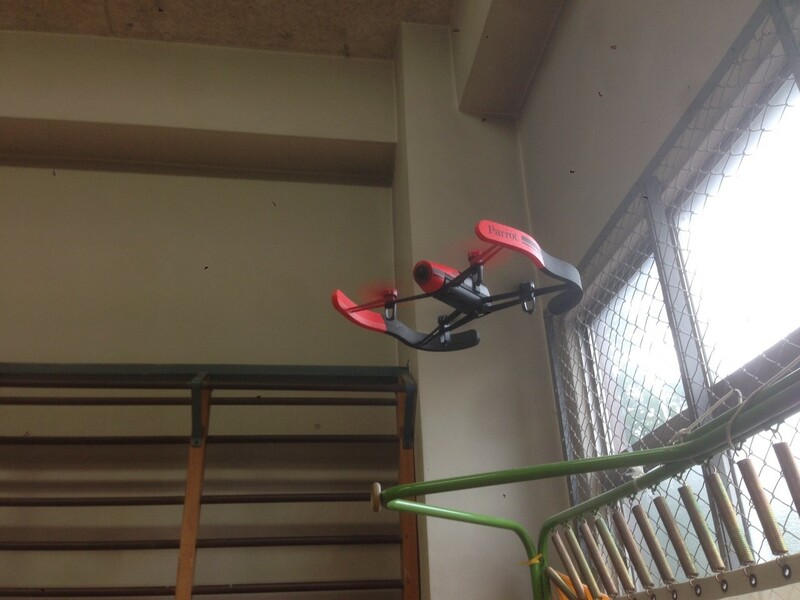 A sensor can capture an image of very fast moving items. 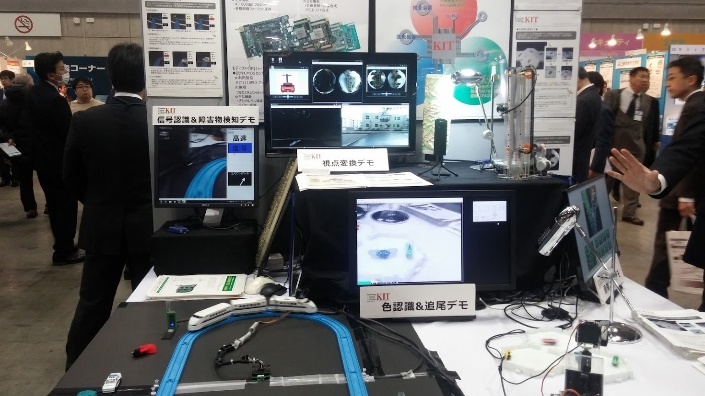 The real-time image processing technology demonstrates the several potentials in many applications such as the simulations of controlling cars in roads and trains in railways without manual handles. 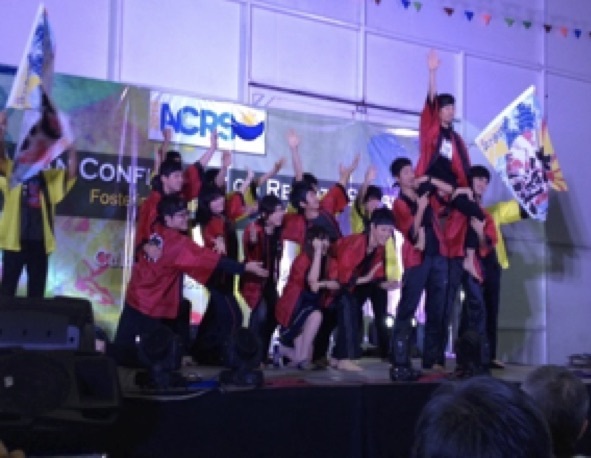 Particpants of The Young Student and Professional forum durin MGA Conference. 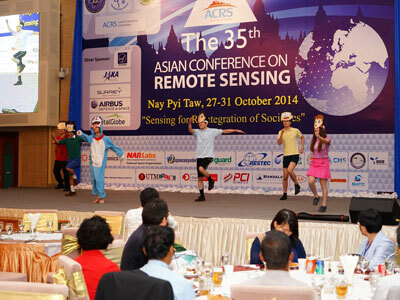 The theme of the conference was Geospatial on the Go. 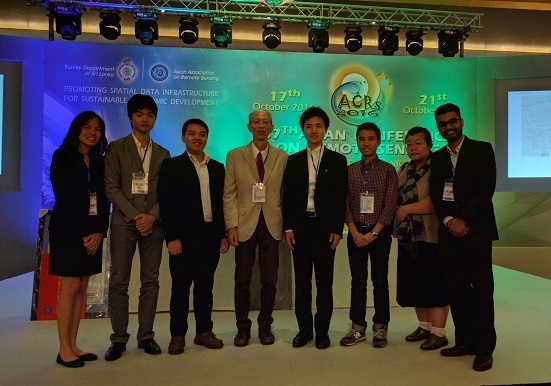 Prof Takeuchi and the lab members, Mr Soni, Ms Nakazono, Ms Li, Mr Tanakorn and Mr Prakhar presented papers and posters on geometric corrections for Himawari-8, mangrove mapping in Malaysia and Indonesia, spread of evergreen forests in Japan, global flood associated with precipitation, urban growth modelling in Yangon city and Indian urban air quality analysis using nightlight respectively. 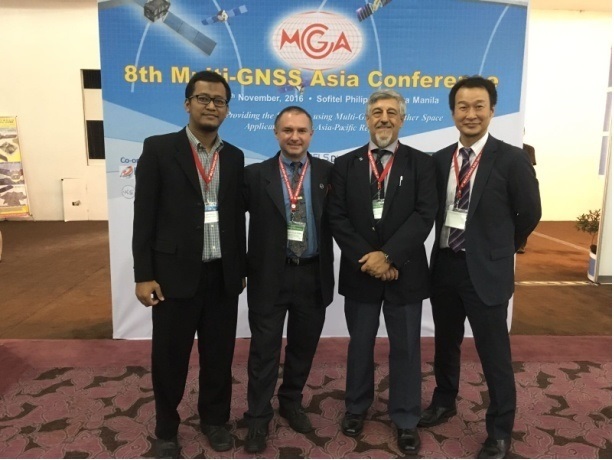 Mr Soni and Mr Prakhar were also invited to submit manuscript to ‘Malaysian Journal of Remote Sensing & GIS’. 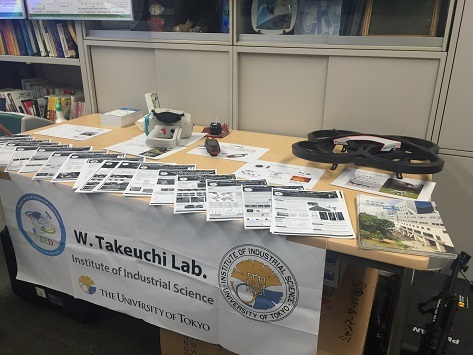 A booth representing Takeuchi Lab as well disseminating information on how to secure admission to Institute of Industrial Science, University of Tokyo was also set up. 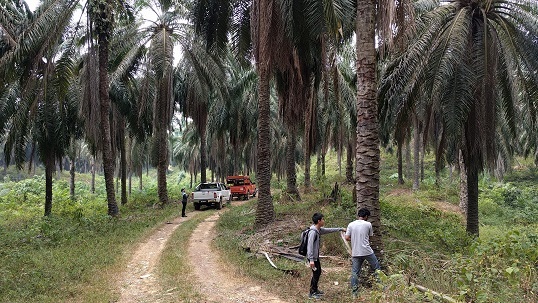 (b) Oil-palm hands-on survey The next day was scheduled for a field visit to an oil palm plantation owned by one of the biggest companies in Malaysia. 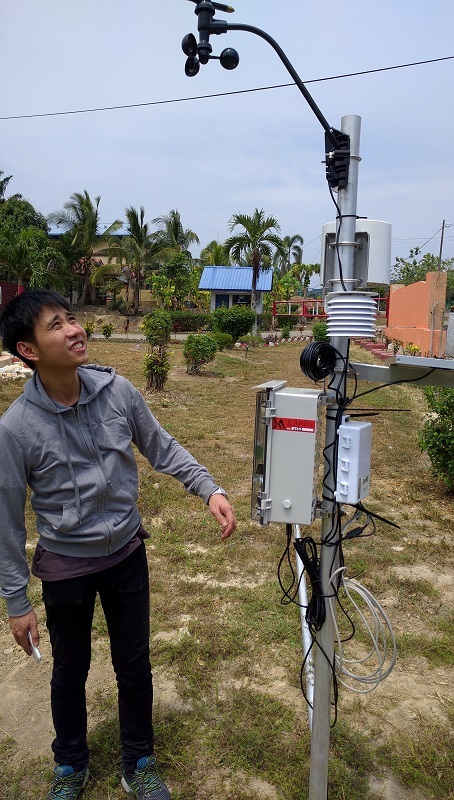 A weather monitoring station owned by the lab already operates there to monitor plant growth along with meteorological conditions. 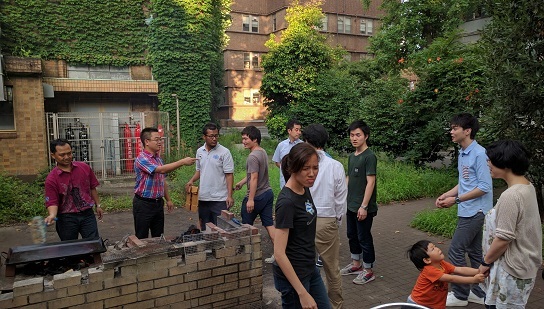 The task to was to measure width of tree stems, height of tree crown and spatial coordinates of tree in a sparse arbitrary manner. This was going to be used as ground truth data for further studies. 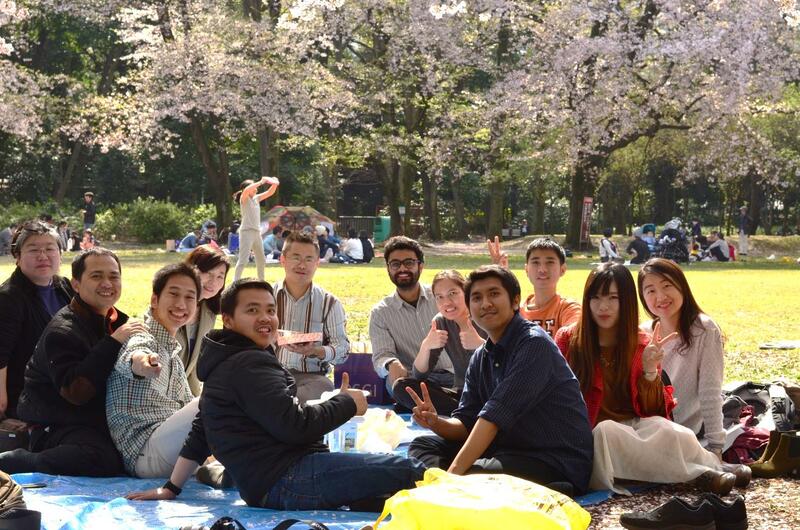 Lab Hanami Party This time we had our annual lab Hanami party in the Komaba park. We shared the space with so many other happy small kids content with running about the full-bloom Sakura (cherry-blossom) trees. 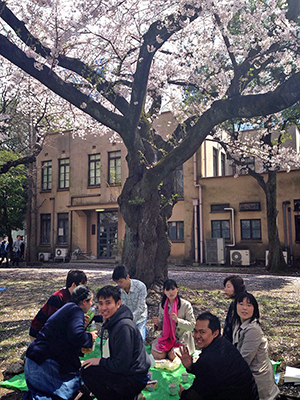 This Sakura cycle encourages us to take a pause and reflect on our achievements and think of the future. 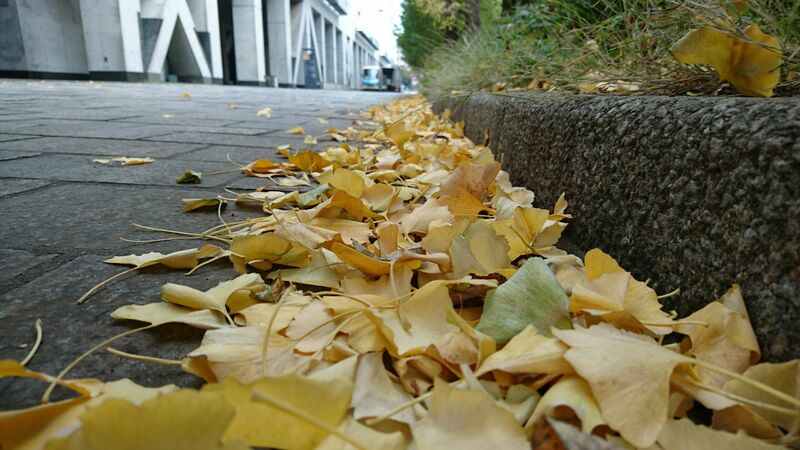 The blooming of trees also symbolizes the transience nature of life and preciousness of time in hand. 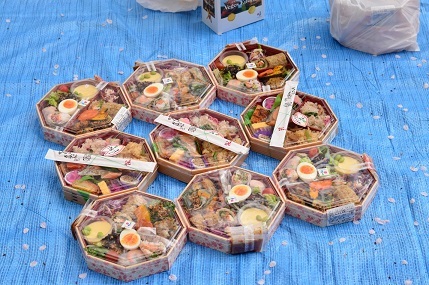 Our Hanami experience was further exalted with accompaniment of the traditional green tea and a special bento. 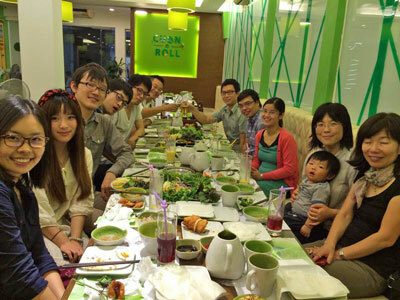 A lab that researches together, eats together. 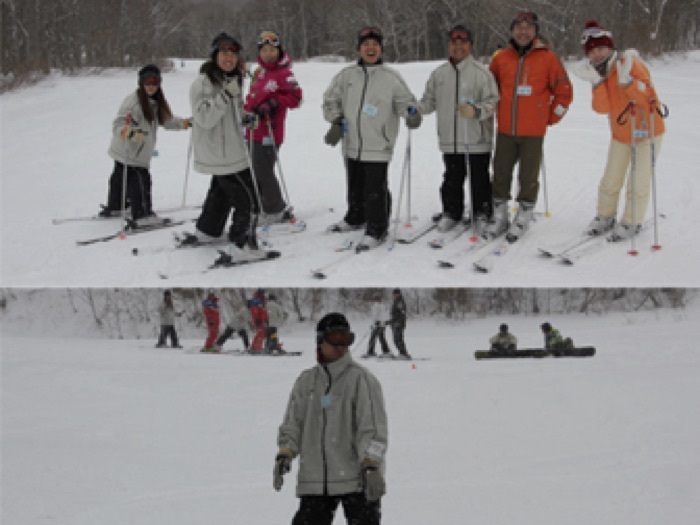 During the university winter break in February, our laboratory members together with Kuwano and Kiyota laboratory had a ski trip at Aizu Daikura ski resort in Fukushima Prefecture. 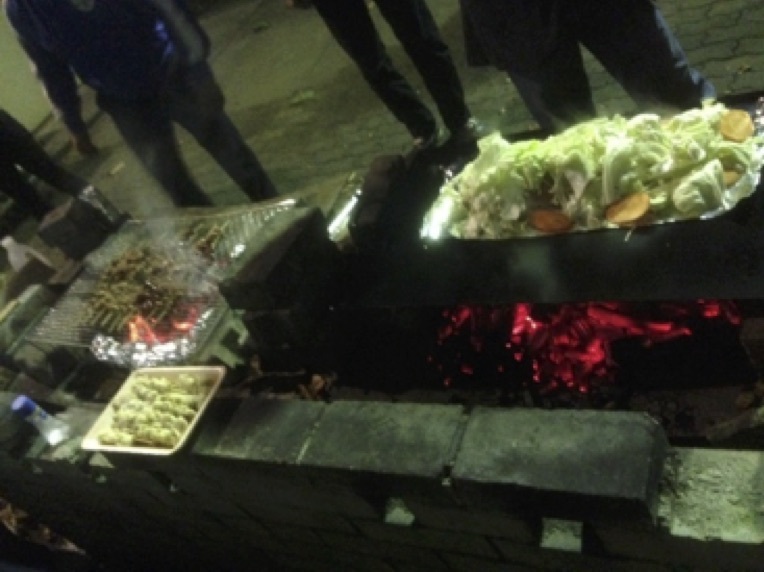 We also had a nice stayover, delicious dinner party and hot spring time at Tokinosato Yurari (report by Ms. Tita). 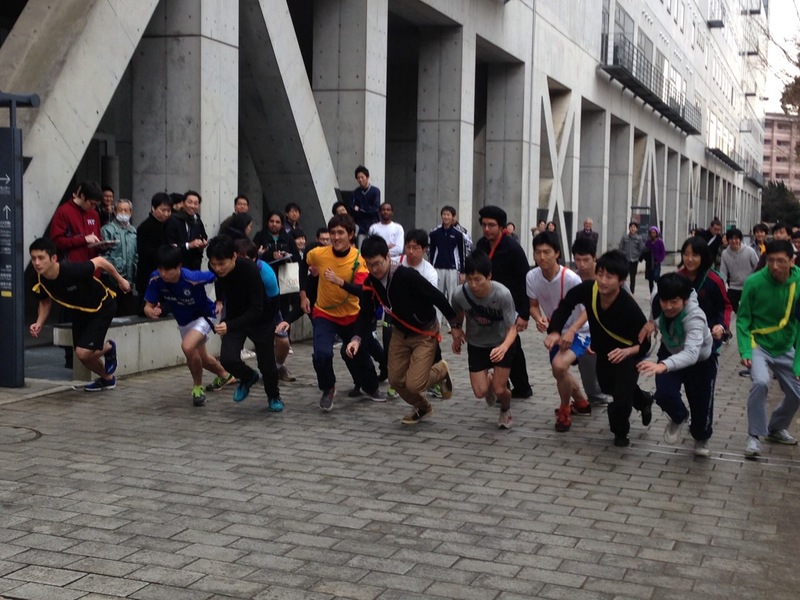 IIS running together (Ekiden). 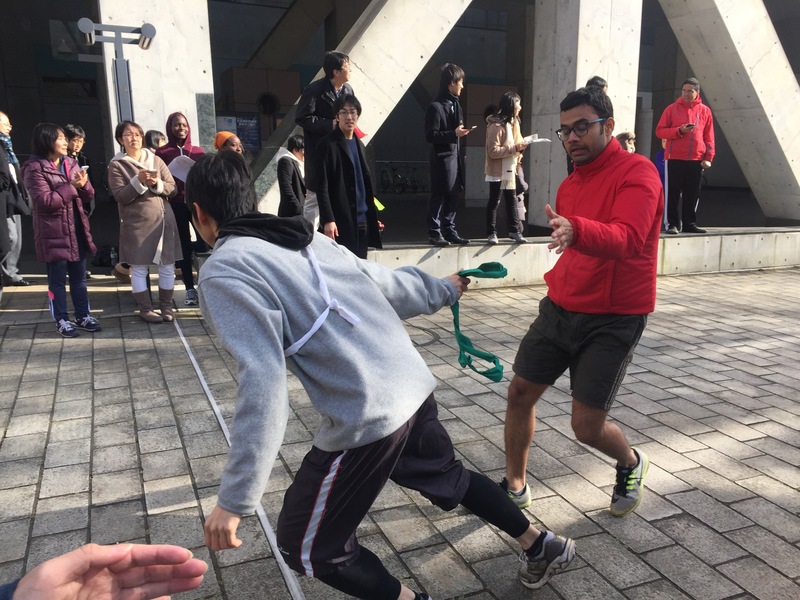 We joined sport with member of IIS, the most important think we need healthy and sweaty even the weather is cool (report by Mr. Arbad). 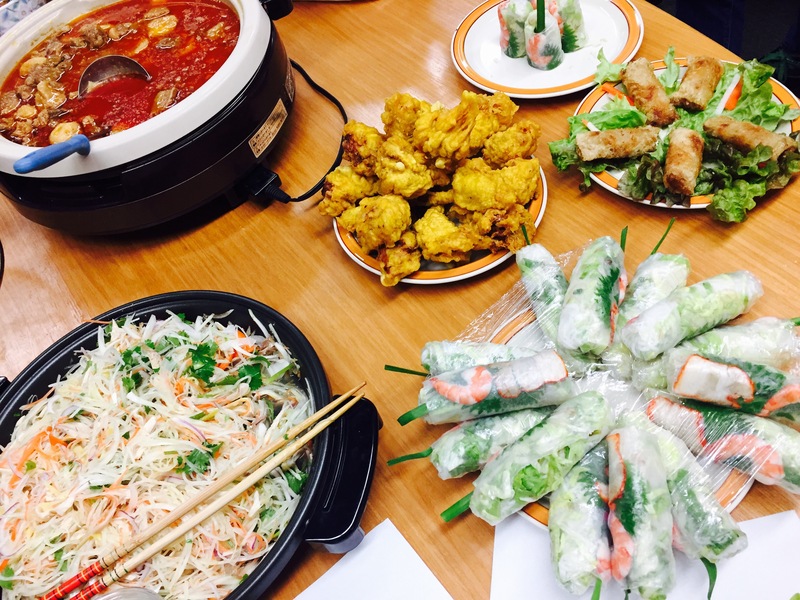 Organized by Li-san, Hot pot is an amazing meal to make, especially during the winter session. 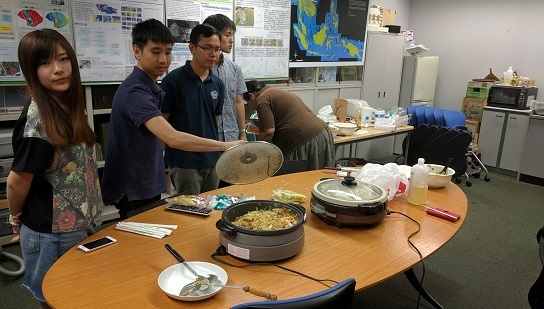 The hot soup for make more skinship to each other in our lab (report by Mr. Arbad). 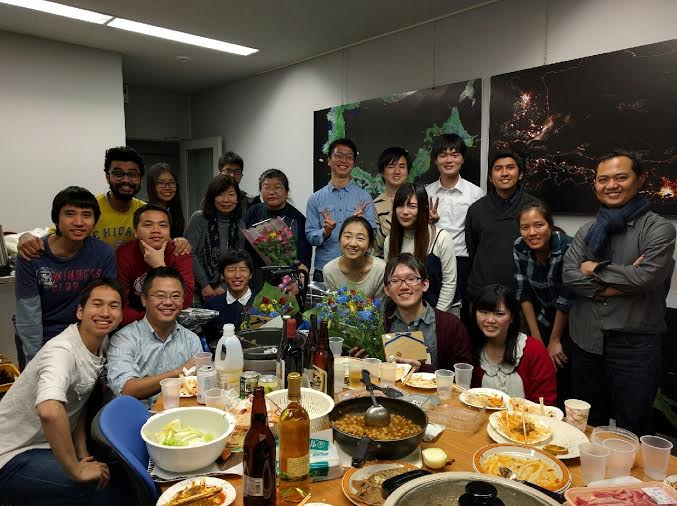 We organized Bonenkai party to celebrate new year, the most important parties. 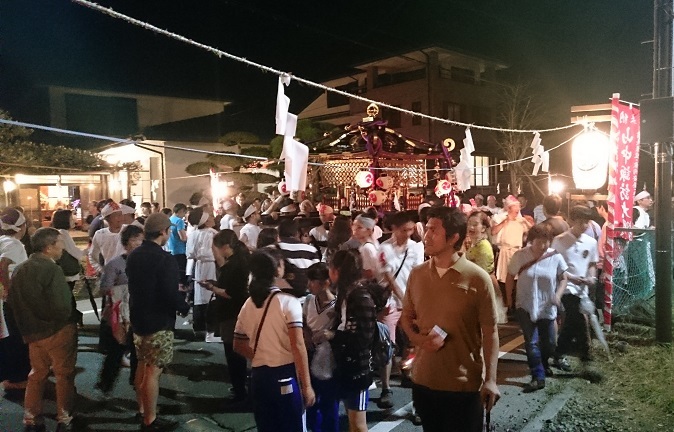 Japanese people believe Bonenkai to forget the problems of the past year and look forward to success in the future (report by Mr. Arbad). 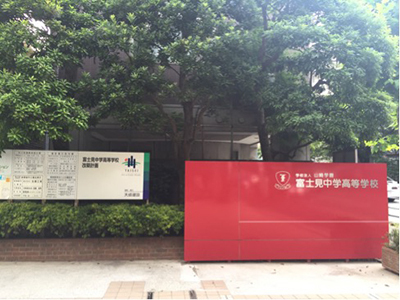 On our way back from ACRS, we transited at Hong Kong and attended seminar at Department of Geography and Resource Management at The Chinese University of Hong Kong. 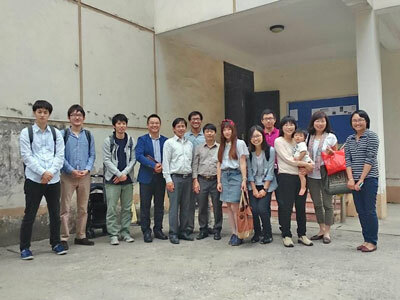 Professor Lin Hui briefed about the facilities and the state-of-art of various research being undertaken most notably in urban subsidence monitoring using SAR, 3D Visualization and urban air quality (report by Mr. Prakhar). 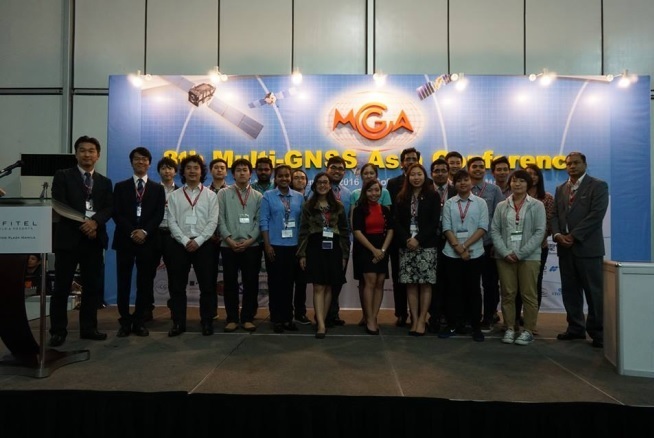 Our lab members presented in the 36th Asian Conference on Remote Sensing in Metro Manila. Philippines. 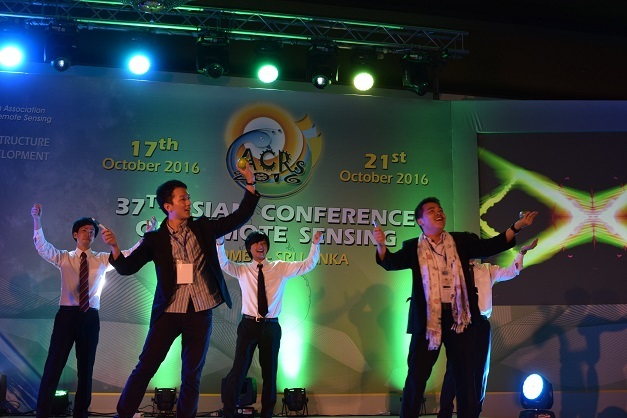 With the Typhoon ‘Lando’ raging during that period, the conference theme: ‘Promoting Resilient Growth in Asia’ became all the more relevant. 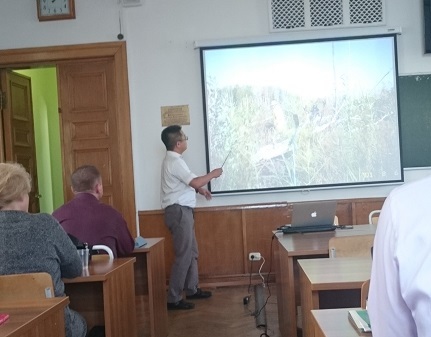 Topics presented diversely ranged from Indonesian peatland subsidence monitoring, forest-fire detection in North Korean to global flood detection. 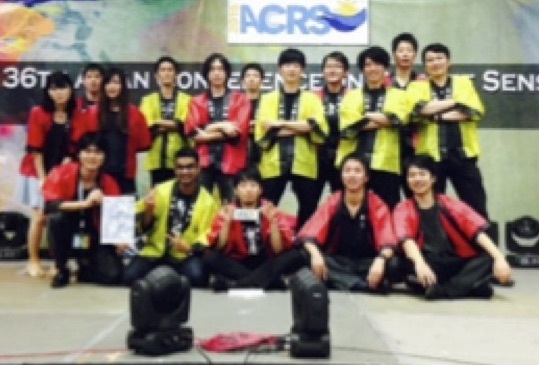 Along with participants from Shibaura Institute of Technology we won the Third Prize for cultural performance. 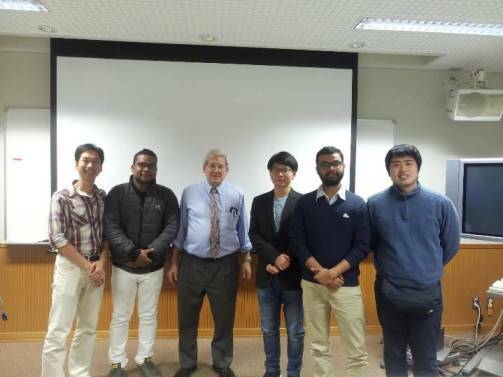 Also information about the lab and research was disseminated to prospective applicants as part of an open discussion presentation (report by Mr. Prakhar). 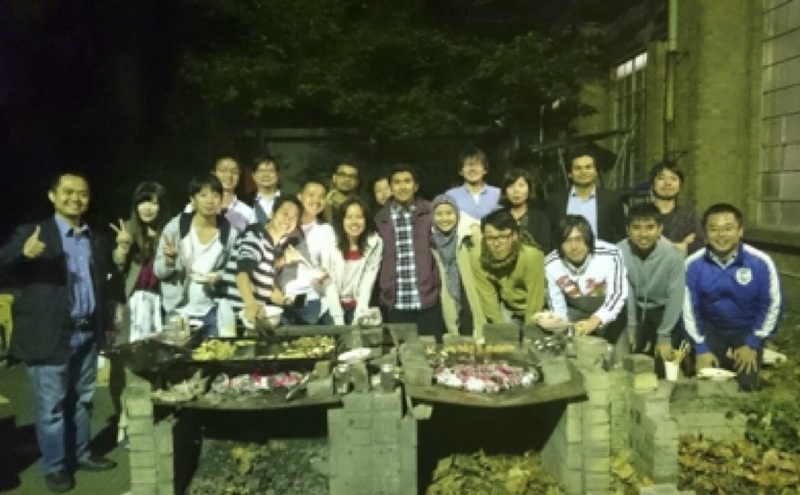 On 8 October 2015, our laboratory held welcome party with BBQ as our dinner menu at IIS campus garden. 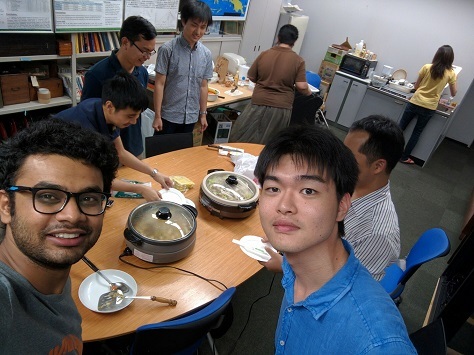 Welcome party is a routine activity in our lab to celebrate new academic year. 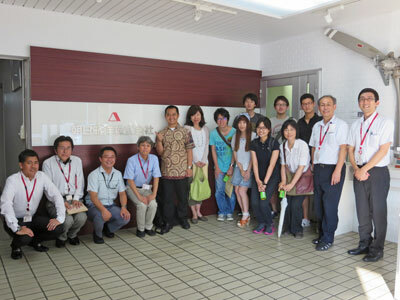 In this event, beside our lab members, we also invite alumni and our partner who work in Japan. 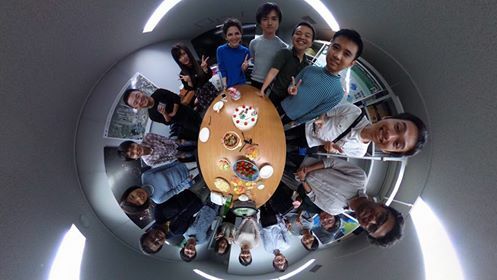 This time, our lab was welcoming three new students that are Mr. Arbad and Mr. Anjar from Indonesia, and Ms. Tita from Thailand. 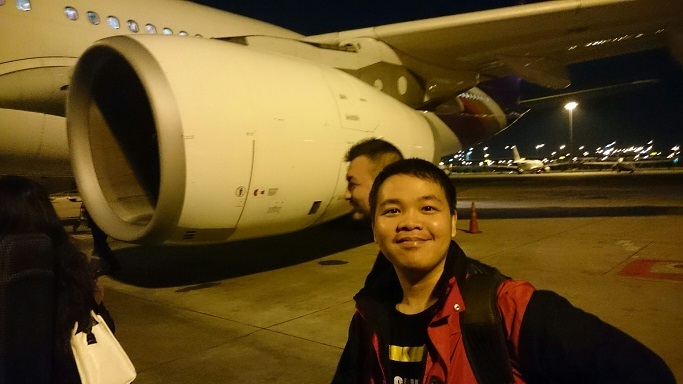 Every year, we encourage each other to get more successful year ahead through this event (report by Mr. Anjar). 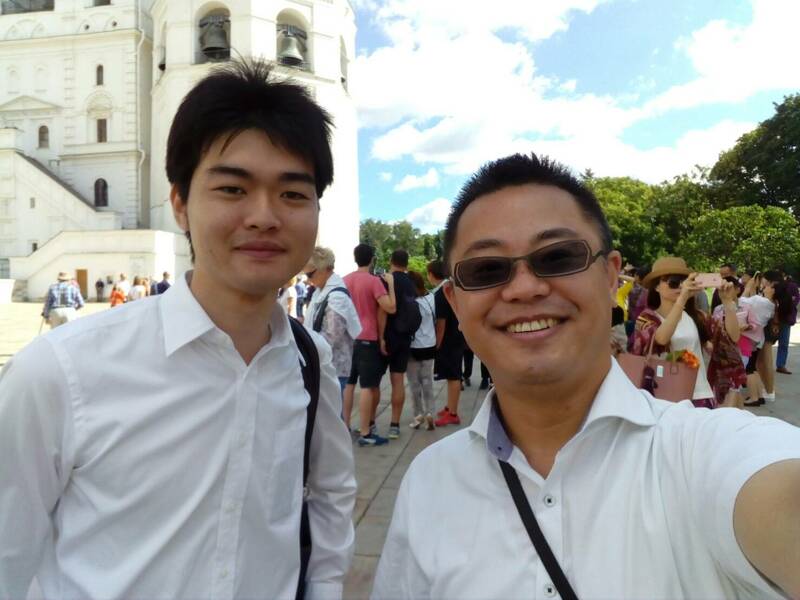 From Sep 16 to Oct 13, Uchida san went to Moscow State University for the purpose of collecting data, which is difficult to gain in Japan. Professors and students there welcomed her. 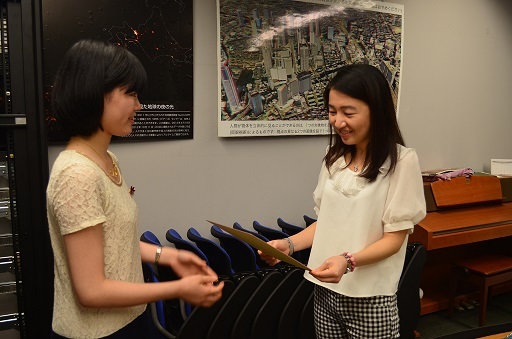 She not only collected data, but also had many meetings even with professors who cannot speak English. 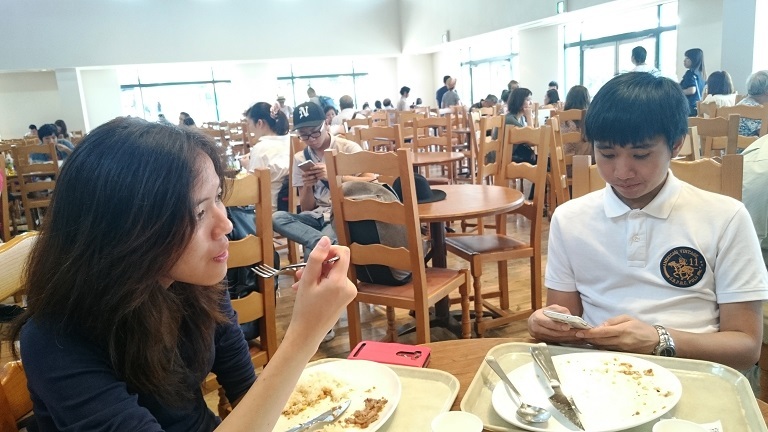 (report by Ms. Uchida).